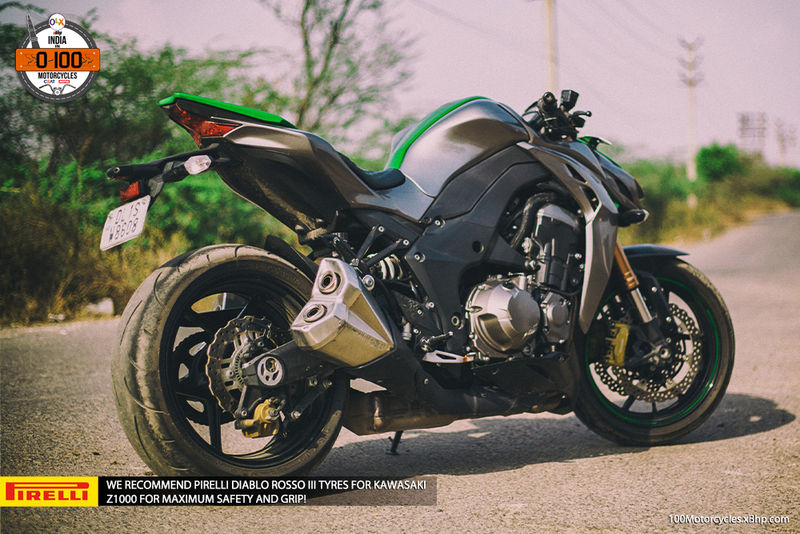 Buy a used Kawasaki from OLX. 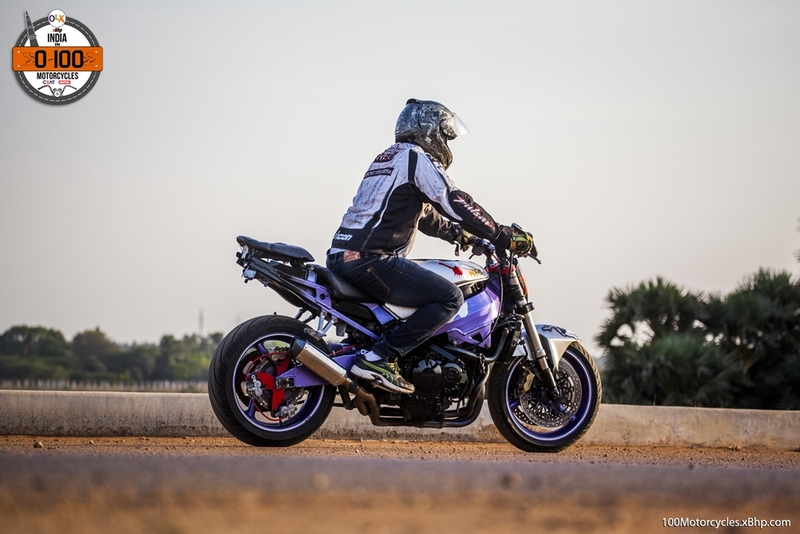 Streetfighter – the name itself points to something purpose-built to take on whatever challenges the streets can throw. But it isn’t some human character out of a videogame we are talking about here. It is something entirely different, but yes, it is in every way related to us only. Having a tight budget? 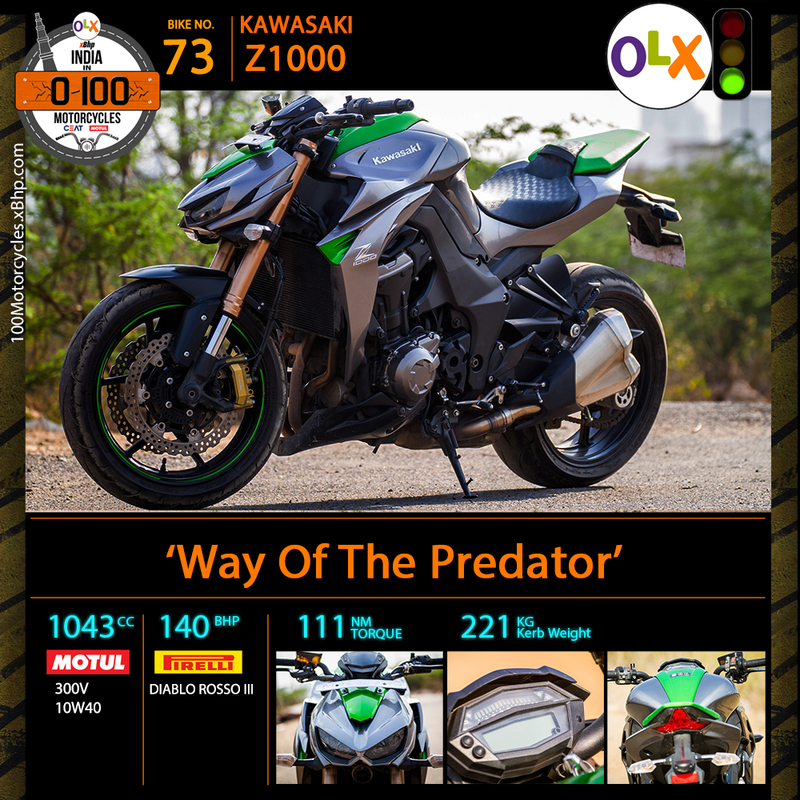 look for your favorite Kawasaki on OLX. 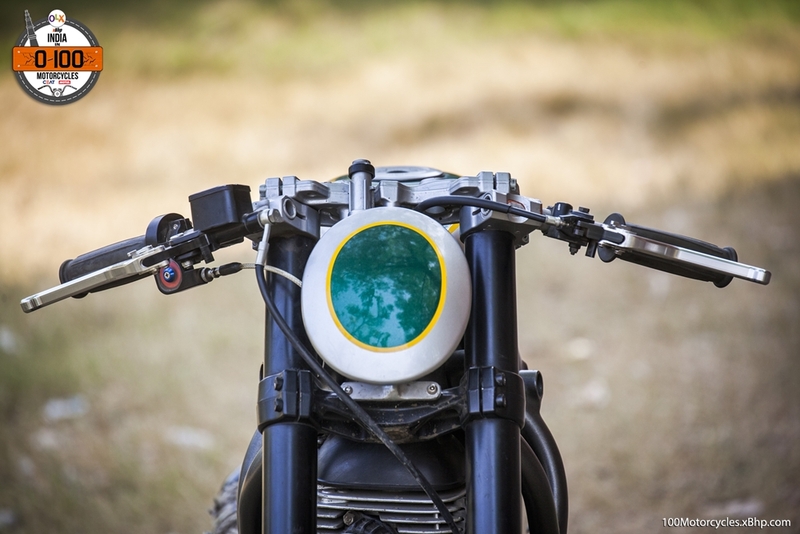 It is a motorcycle which should now start making sense of things in a somewhat different manner. 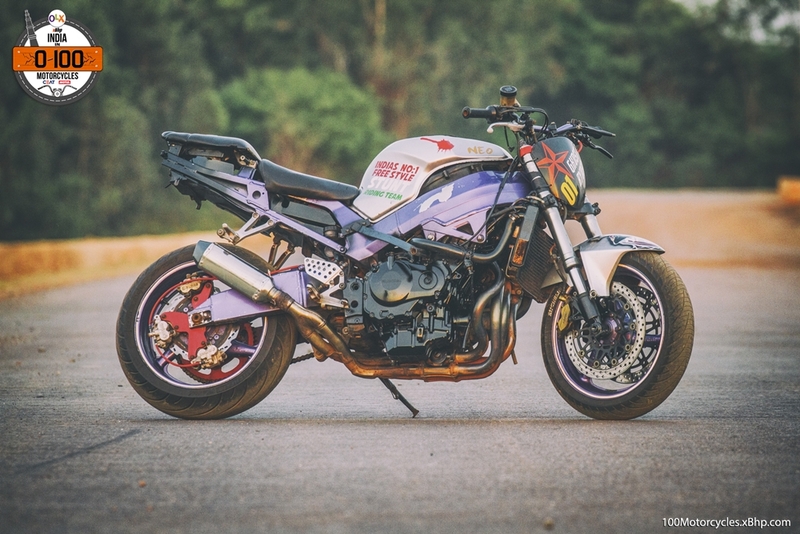 A Streetfighter is a kind of motorcycle which shall represent the livelier, aggressive and the badass side of the motorcycling world. 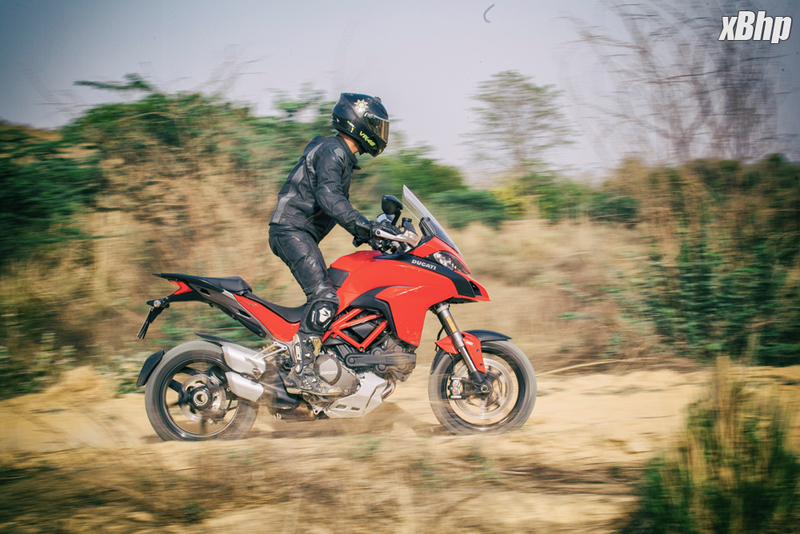 They are focused along with a dash of versatility as they take the sportiness from full-faired Superbikes and mix it with the practicality of an upright riding stance. 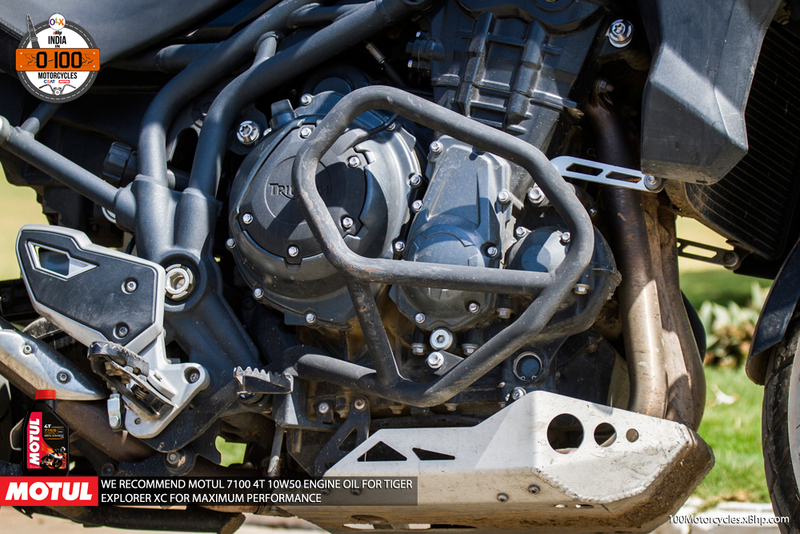 Add to it the more street-friendly engine (meaning tuned for less top end compared to a Superbike). 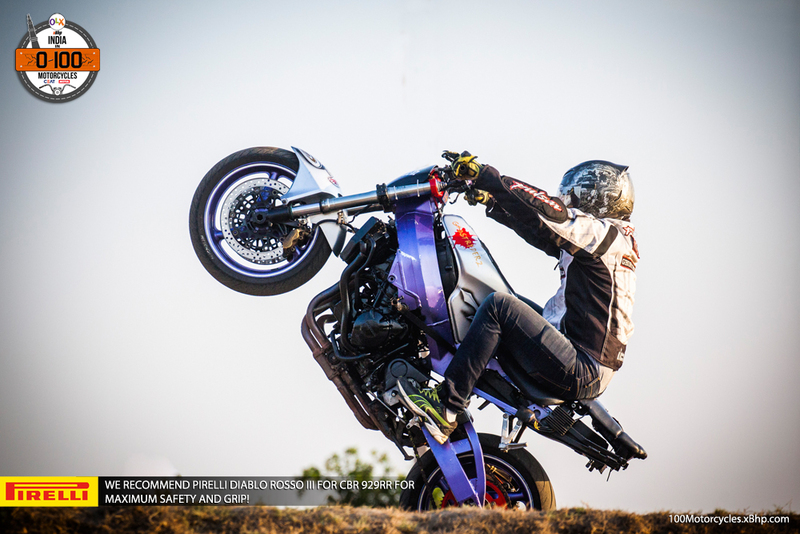 Since the time these kinds of motorcycles have become mainstream, companies are trying hard to make exceedingly aggressive looking Streetfighters today more than ever before. Some of them look so sharp in fact that you might cut yourself if you touch them! 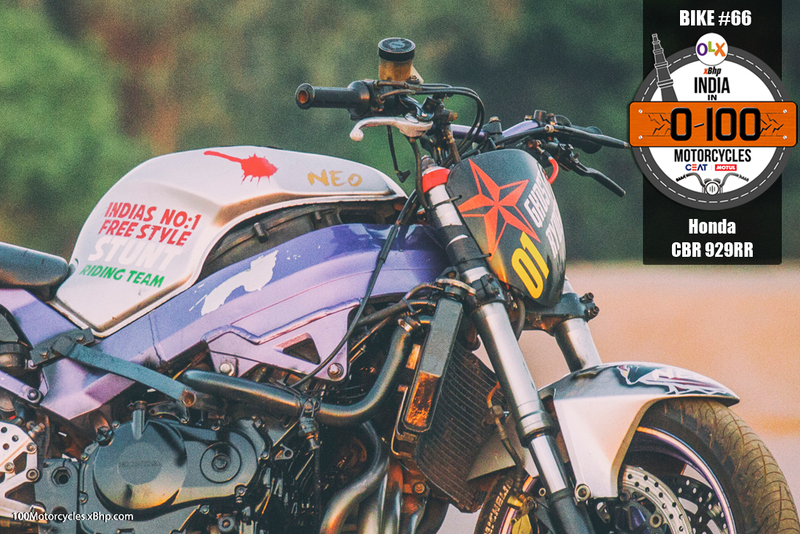 Every design has a point of reference behind it – while some just want to make a sharp and edgy looking motorcycle (read KTM for instance), some have a more specific allusion to the source or the inspiration. 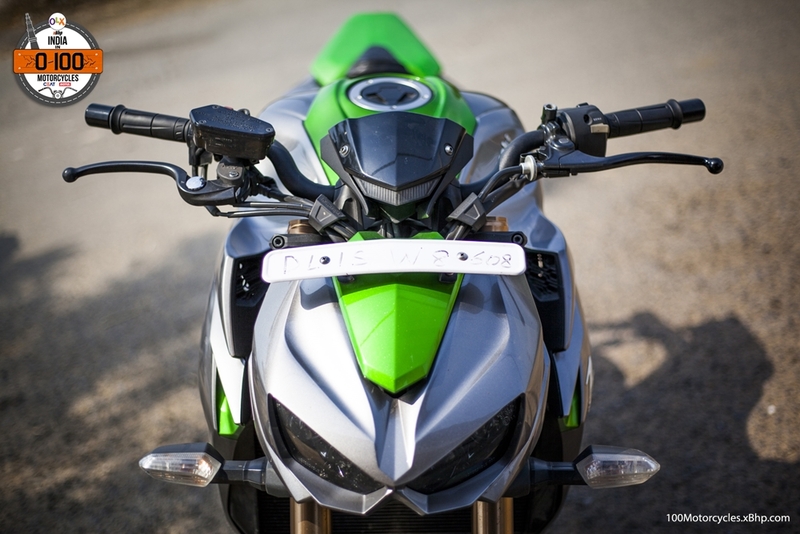 Kawasaki’s Z1000 is the latter. It is sharp no doubt, but that isn’t remotely its sole intention. 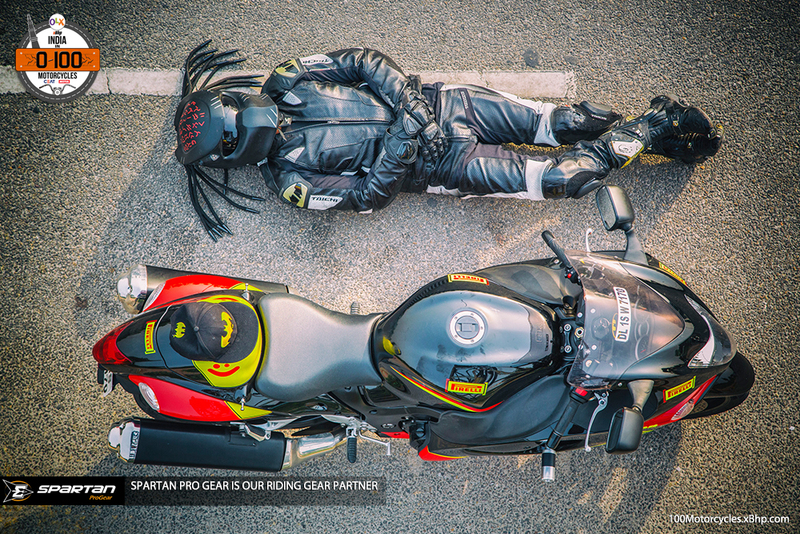 The Z1000 is designed to look like a predator, a panther in the stealth mode as it readies itself to attack its prey. 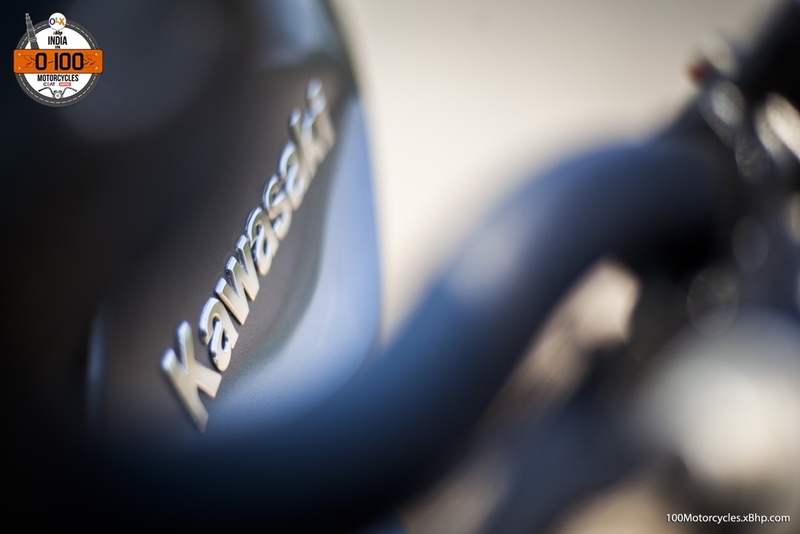 Kawasaki calls it the Sugomi design – a Japanese word meaning ghastliness for one. 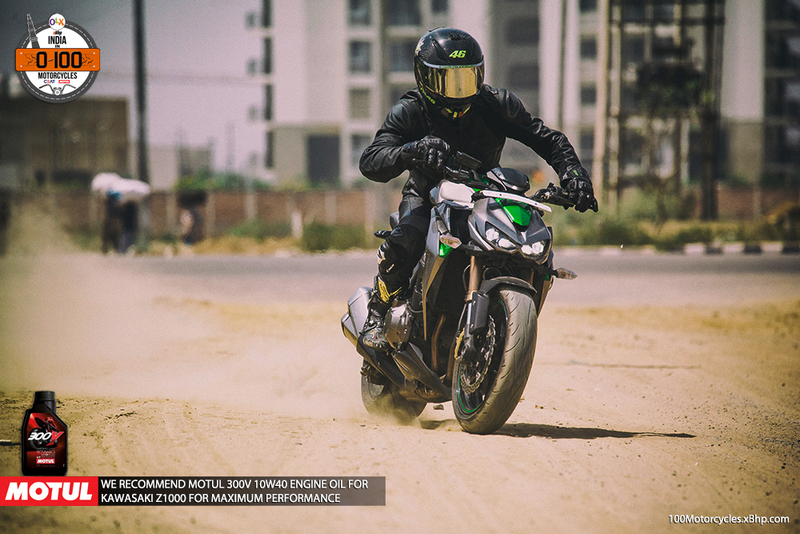 While being edgy enough, the Z1000 has quite a fuller body, it hardly looks skinny or petite. It still appears a bit rounded especially because of the inline 4 engine which isn’t really compact. 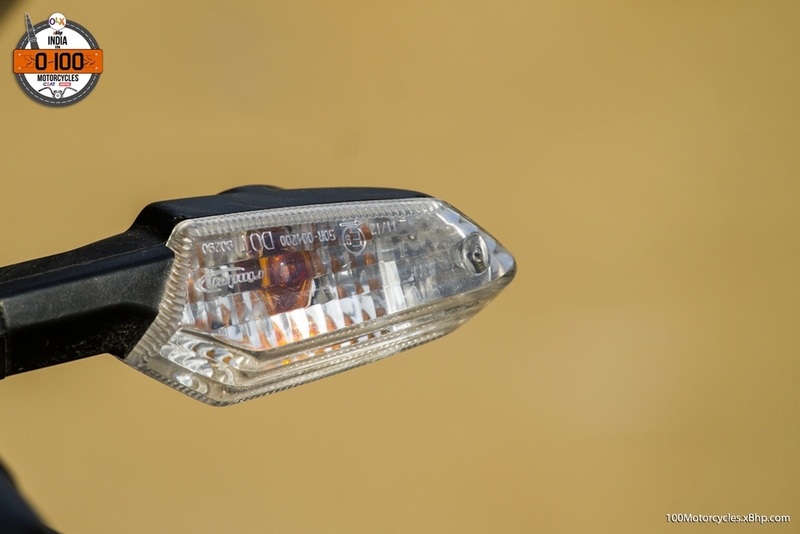 The biggest or the only element which makes it look like an animal ready to attack is the headlight assembly. 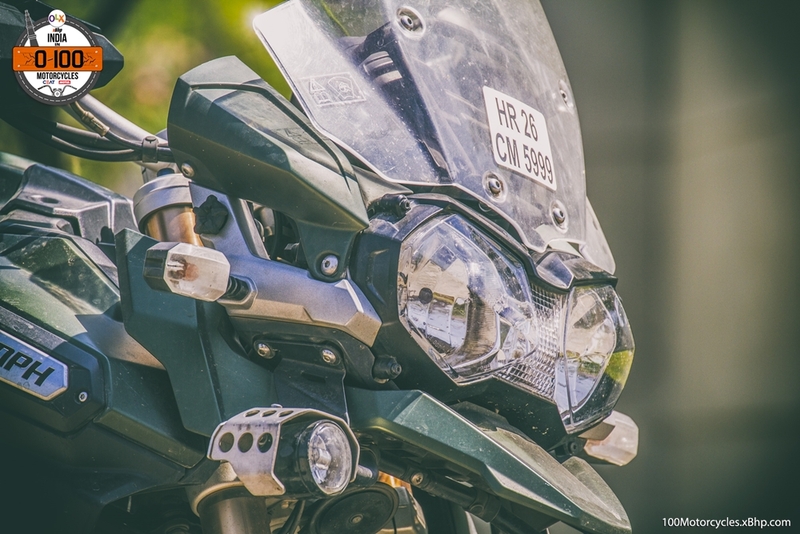 Of course, the headlight of any motorcycle is ideally its face and so, it has to be the most personifying part or the liveliest part of the whole motorcycle design. 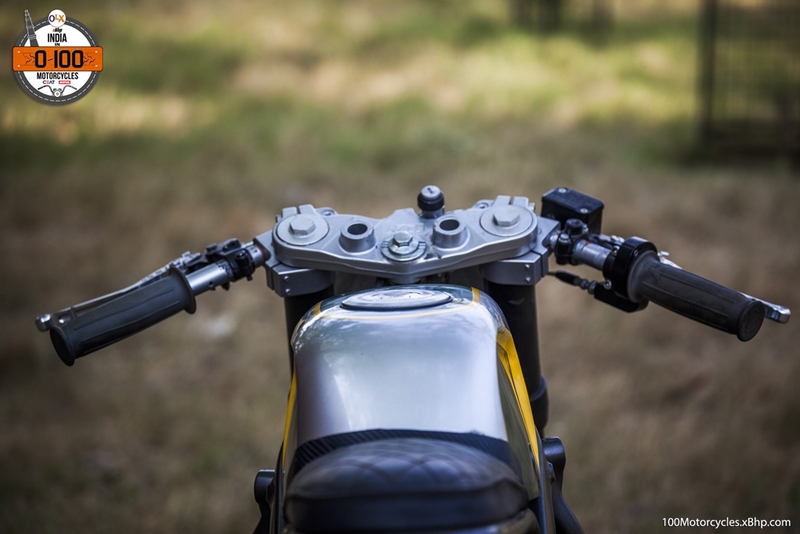 Let’s understand something, it doesn’t make a good first impression for a Streetfighter if the face of a motorcycle isn’t aggressive enough. But that’s only the beginning. 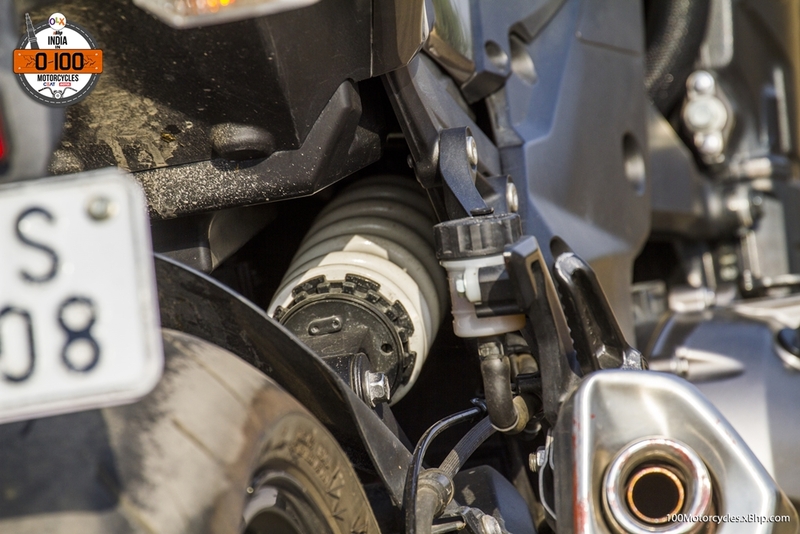 The more important things are the engine, chassis and the suspension package which actually tells if the motorcycle is the hunter or the hunted! 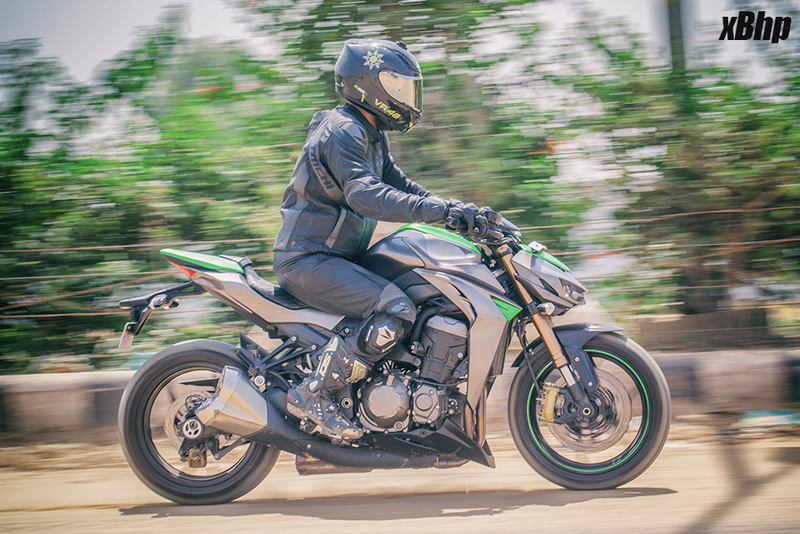 Now, the Z1000 isn’t the most powerful naked out there but it has got itself covered with a very potent 1043cc engine which produces 142 PS of power at 10,000 RPM and 111 NM of torque at 7,300 RPM. 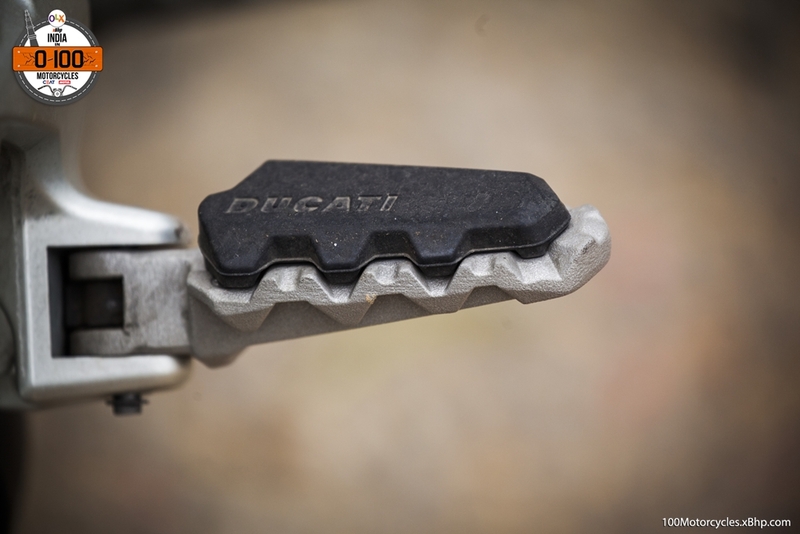 Not the class-leading specs by far but enough to slug it out with the best of the best. 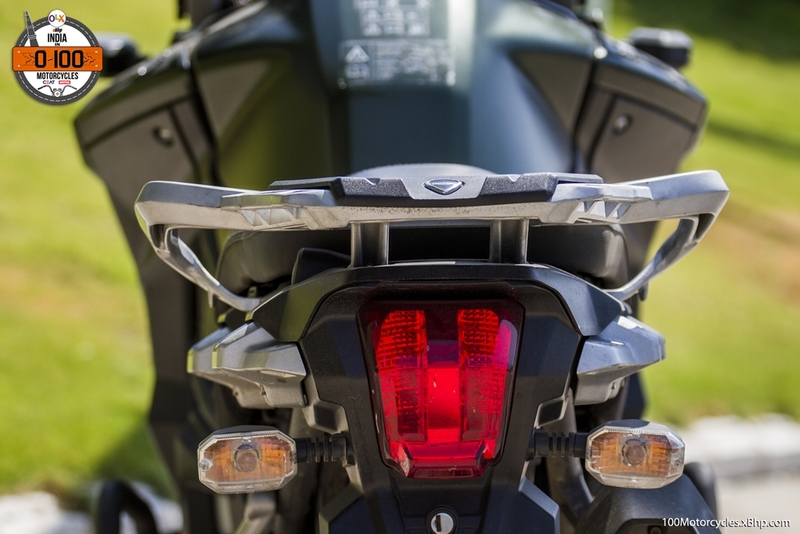 Given its pretty bulky dimensions and not-so-light operating weight of 221 kg, the Z1000 is surprisingly light on its feet. 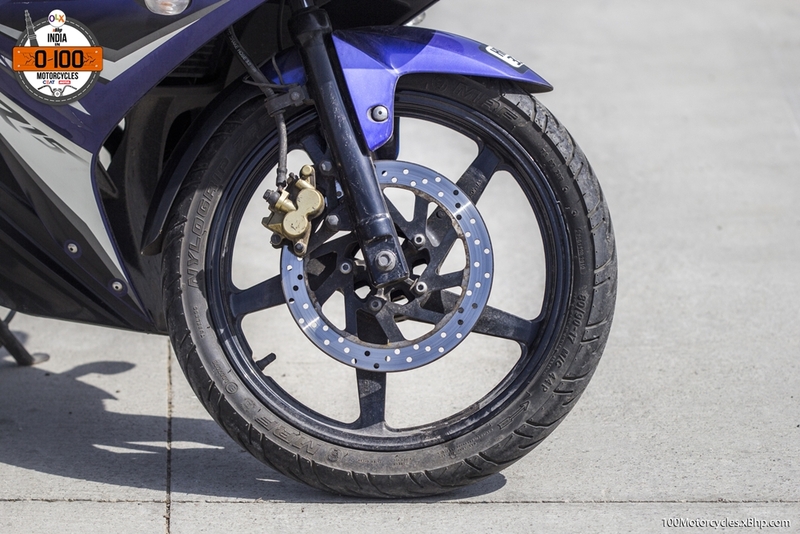 This shouldn’t come as a surprise as many modern-day sportbikes are engineered to carry low centre of gravity making them extremely light to handle in varying traffic conditions. 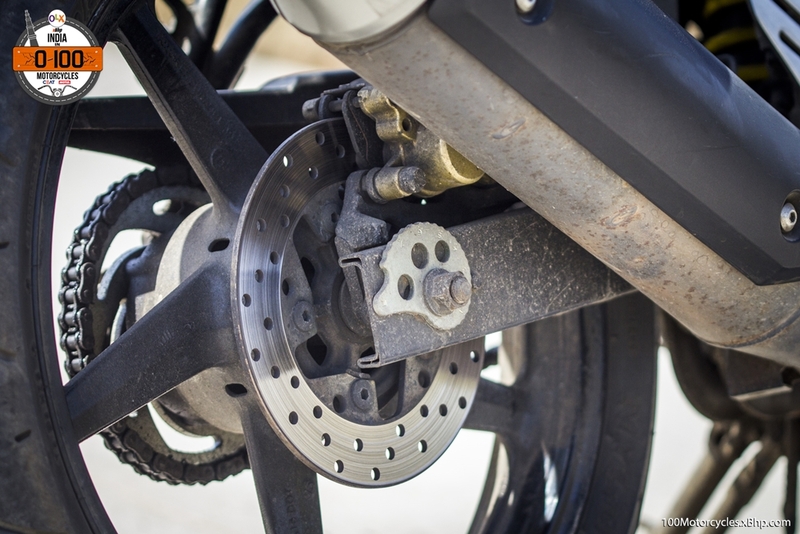 Another factor which contributes to the motorcycle’s easy handling is the aluminium frame. 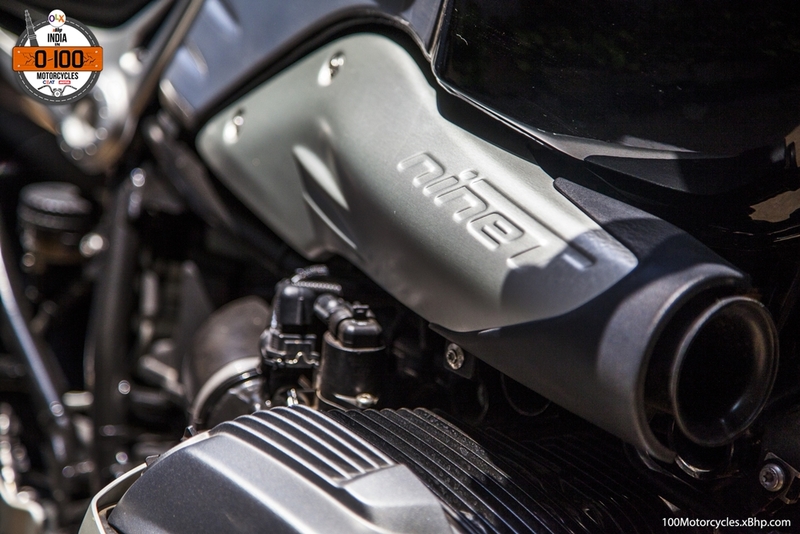 One of the highlights of the engine is the sound it generates especially the intake growl. 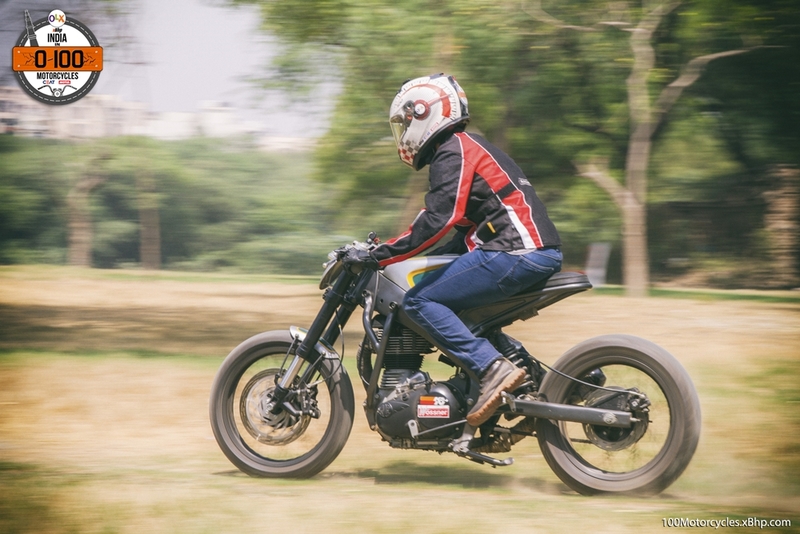 It is intoxicating and the bike doesn’t come with many bells and whistles. 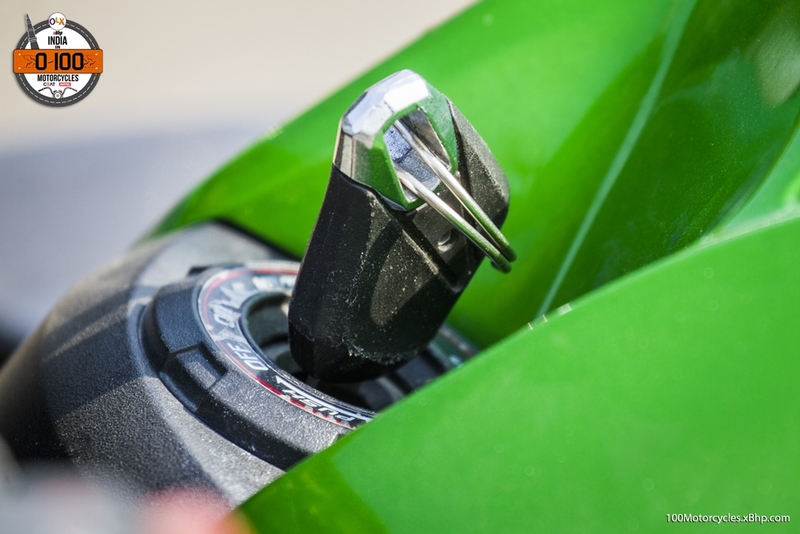 As far as electronics are concerned, the Z1000 is equipped with ABS, that’s it. 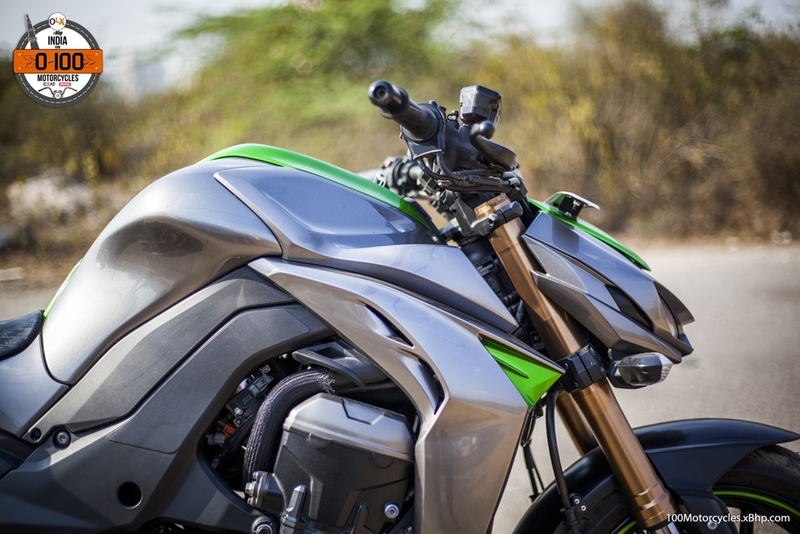 With the Z1000, Kawasaki has designed their most radical looking motorcycle to date. 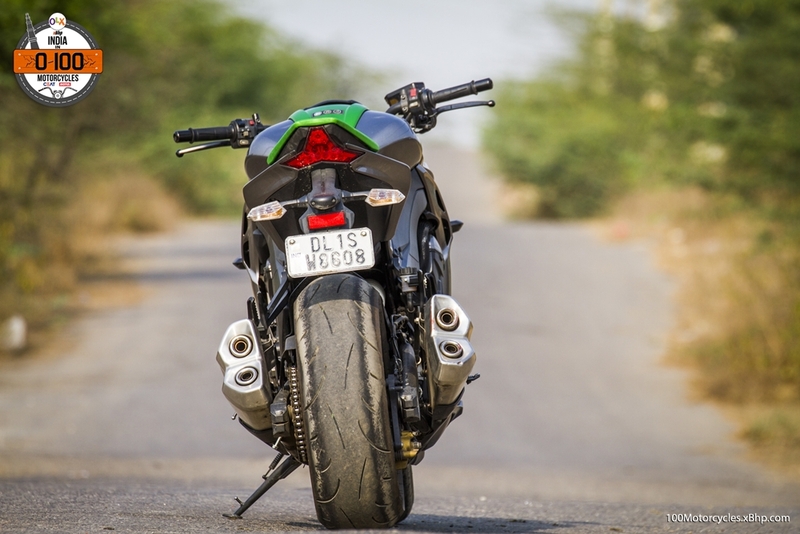 While their Superbike, ZX-10R, is sharp and focused but nearly not as radical as its naked sibling. 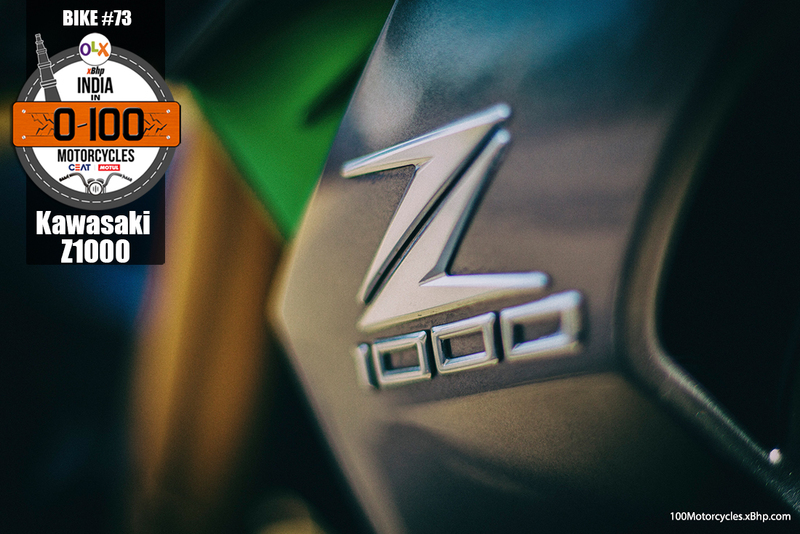 We had a wonderful time riding the Z1000, it is versatile and is a blast to ride in the city, on the highways and on twisties, of course. 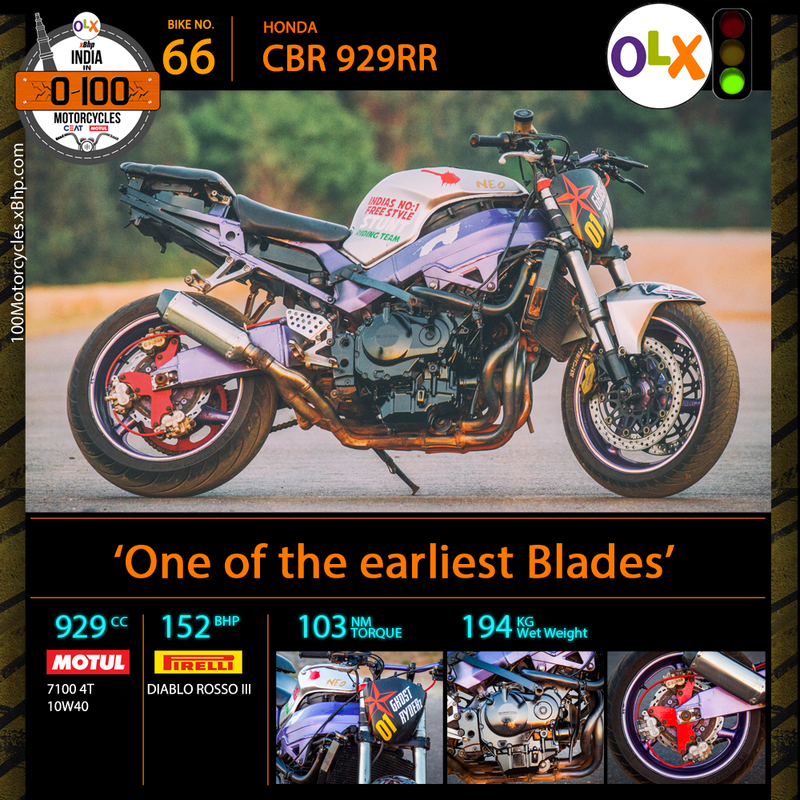 And if you think that a brand new Z1000 out of a showroom is a bit out of your budget, you can always try OLX to find a second hand one. You never know when you might get lucky! Suzuki’s Hayabusa, by far, is the most remarkable achievement of modern day sportbike engineering. 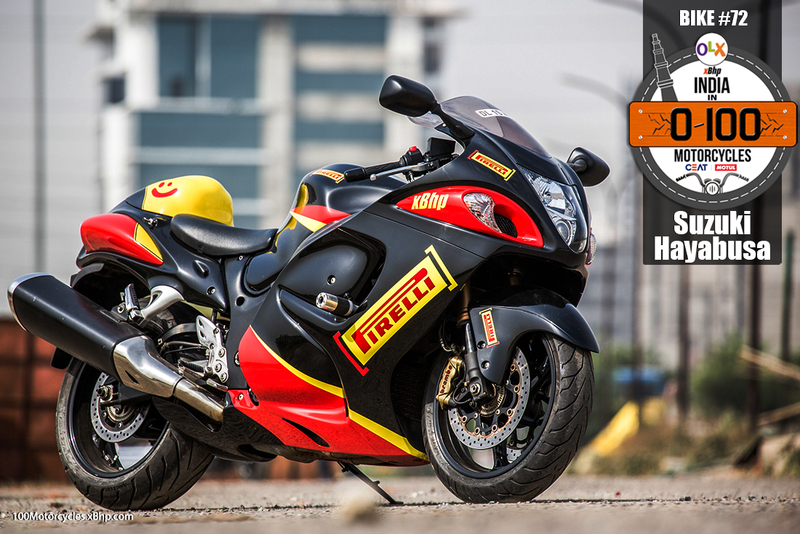 No other motorcycle has had its life filled with as much emotion, opinion, support and controversy as the Hayabusa. And it’s got all of those things at the same time. 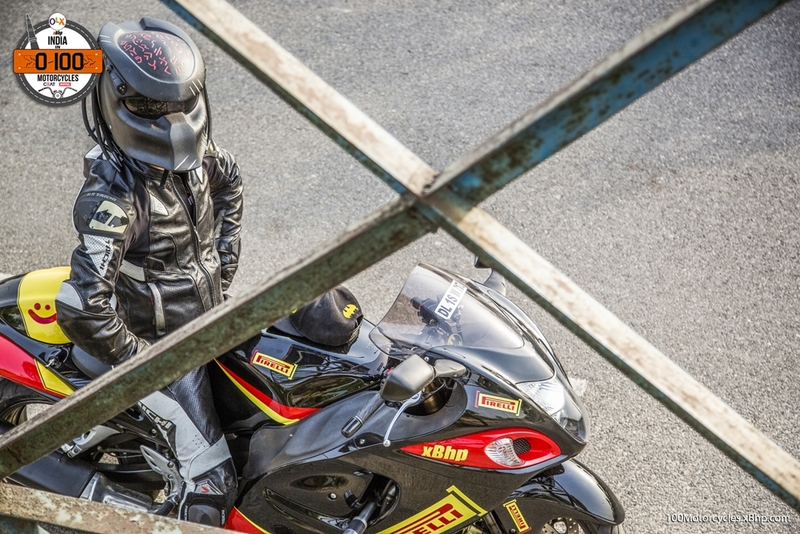 In essence, Hayabusa has been the standard which has defined Superbike performance since its launch in 1999. 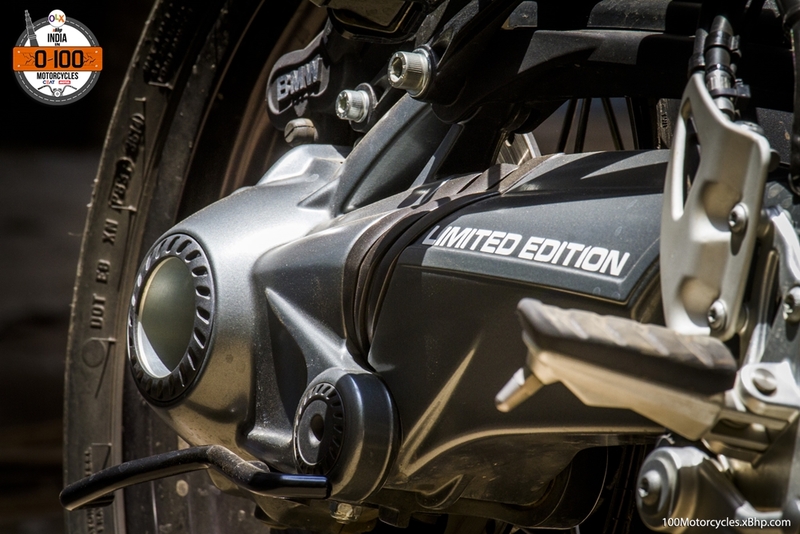 A century came to its end as it gave birth to a new generation of performance motorcycles. 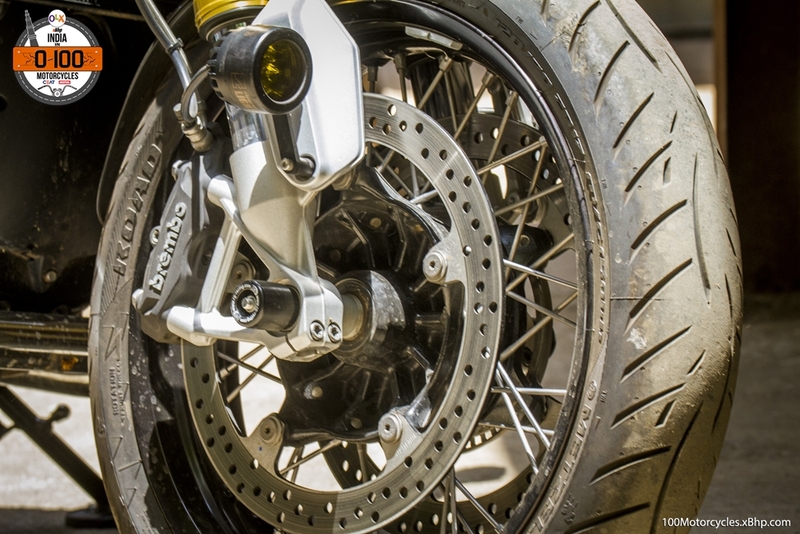 Without a doubt, this is Suzuki’s finest sportbike so far. 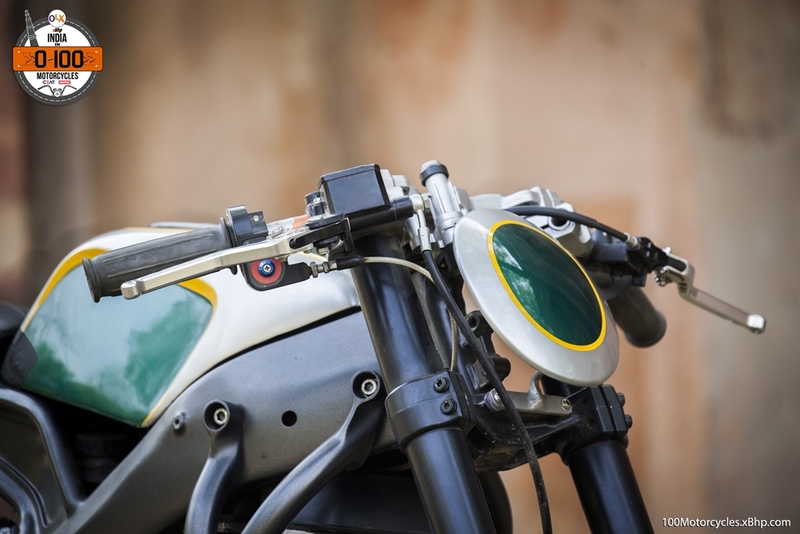 World’s first production motorcycle to touch and cross the magic figure of 300 km/h, and the one which brought the infamous “Gentlemen’s Agreement” into existence. 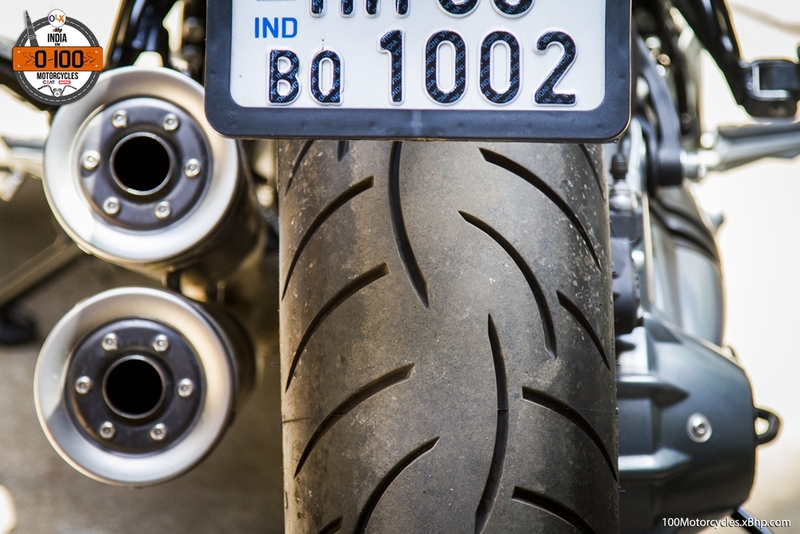 Of course, we all know what it means – that no motorcycle post the year 2000 shall exceed the top speed of 300 km/h. 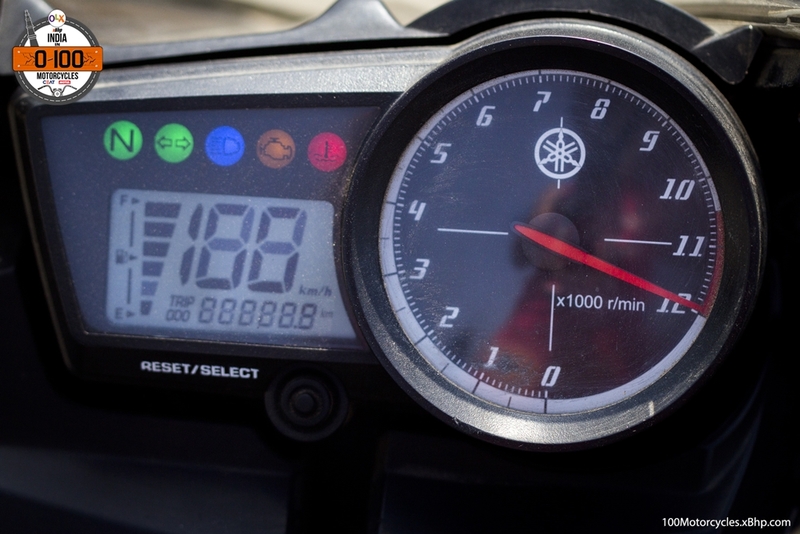 And for exactly this reason, the 300 km/h is still a magic figure for any motorcycle even though many of them are well capable of going beyond it (but they are electronically restricted). 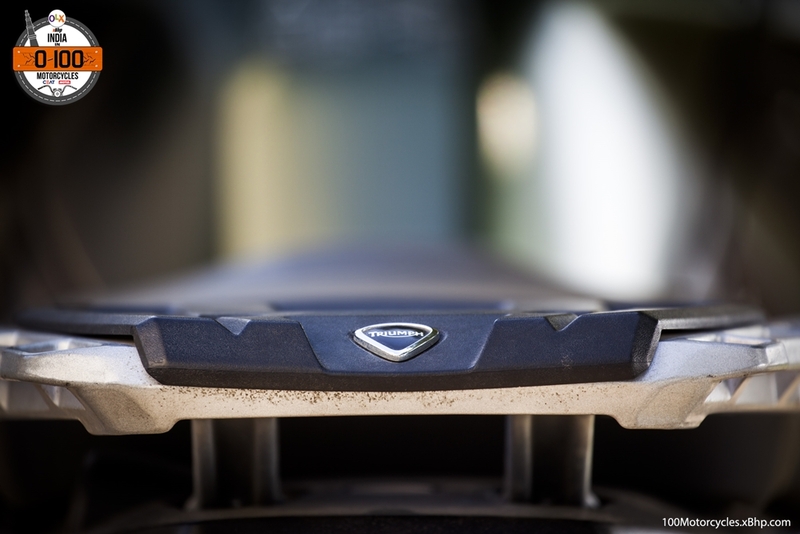 But why did Suzuki do it and it’s not a typical case of why not! A few days back, we came across an excerpt from the man who led Hayabusa’s engine development team. 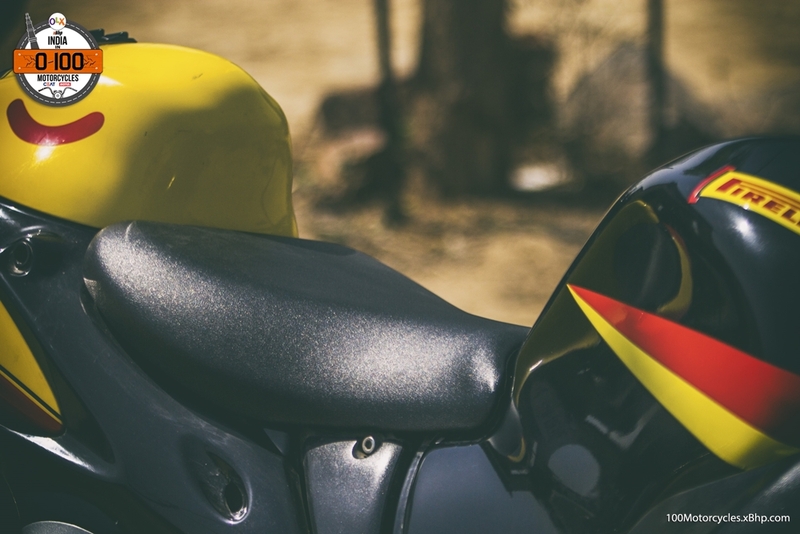 Interestingly, he disclosed that Suzuki wasn’t really out to make the fastest motorcycle in the world, their only objective was to make an engine which would give effortless power at all speeds. Such a simple line of thought one would say. And look where it got them. 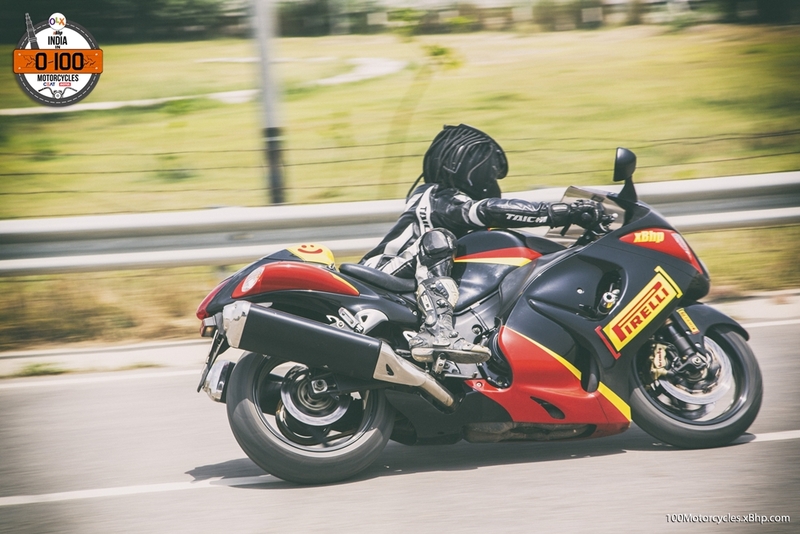 Riding the Hayabusa would reveal to anyone that the rider doesn’t really have to work to generate speed. It is like it is always there. It comes so easy on tap. 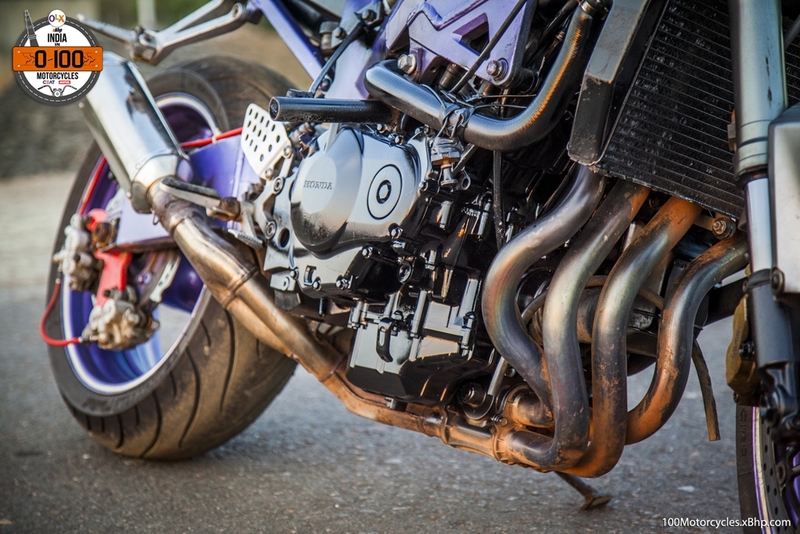 To be fair to all Superbikes and Hyperbikes, none struggle (by any definition) to gain speed, but there’s something about the Hayabusa, that big and round thing of a motorcycle when it just continues to put G-forces on the rider without an iota of a hiccup in its acceleration. 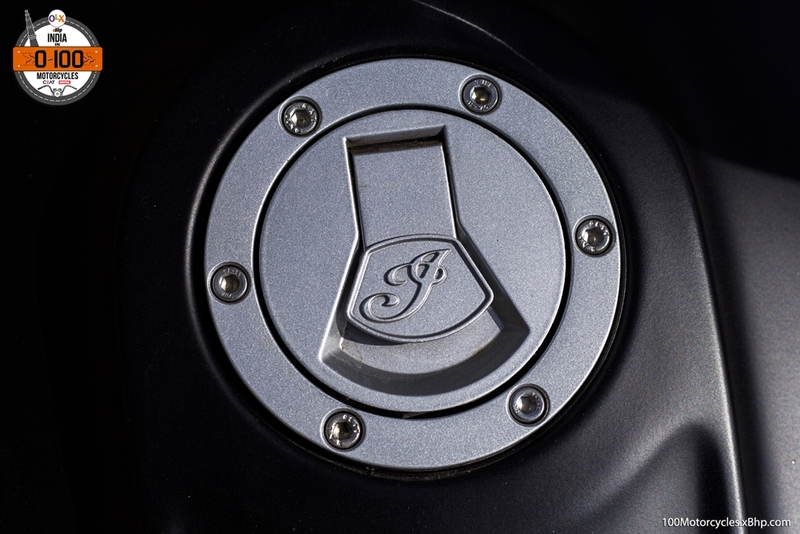 There’s literally no dip of any sort in its torque curve. Beyond a point, it actually feels it would blast through a wall if required! 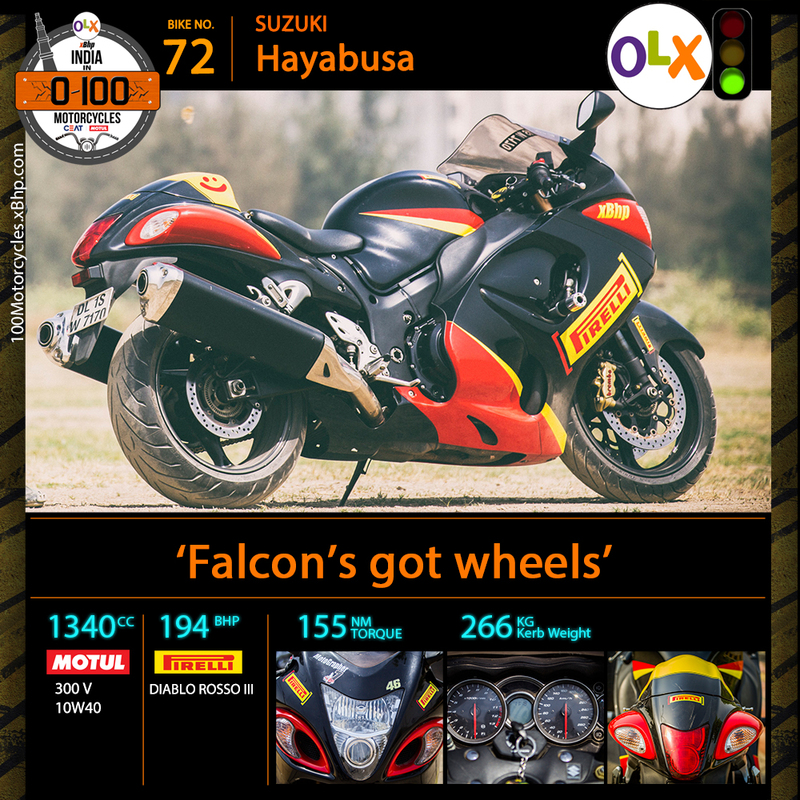 Suzuki has designed Hayabusa on the concept of the Peregrine Falcon, a relatively large bird (a falcon) which is renowned for its high-speed dive to hunt its prey on the ground or water where it achieves the speed of around 320 km/h making it the fastest of all forms of animals. 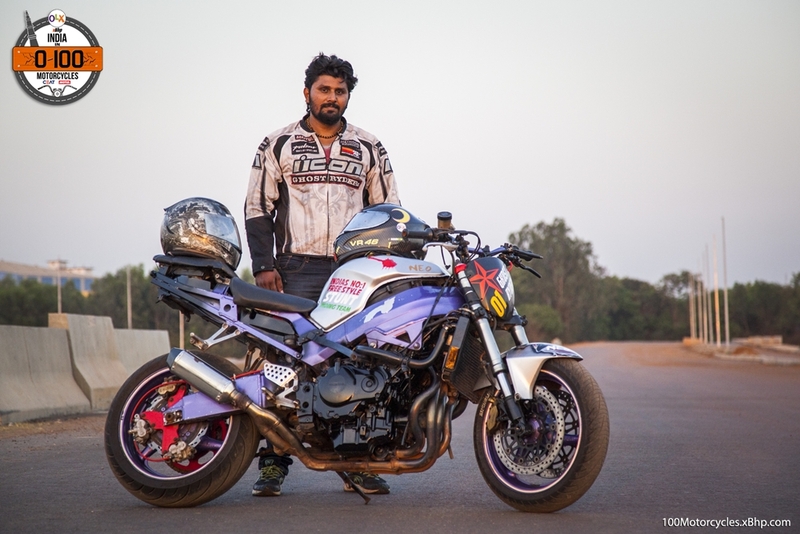 Hayabusa, at its launch, could go well over 300 km/h and several reports suggest that it could do somewhere between 320 to 330 km/h before the top speed restriction came into place. 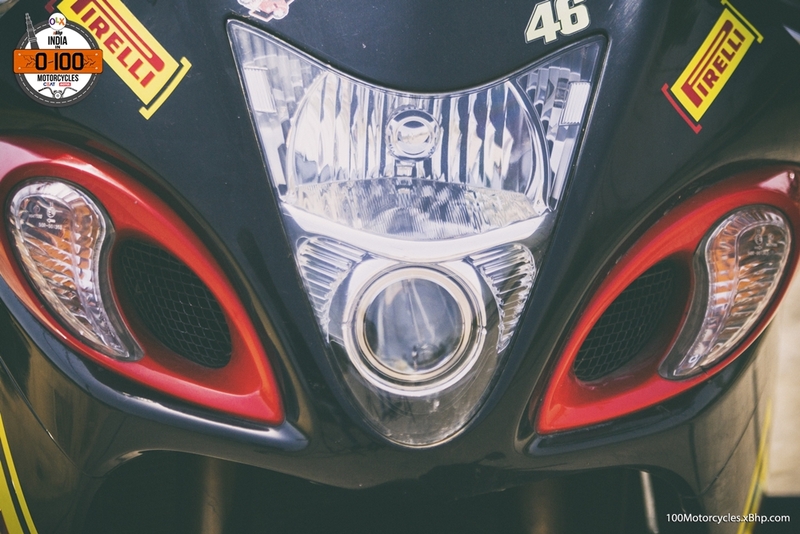 Hayabusa’s front impeccably resembles the face of a falcon or a hawk or an eagle – the headlight being a part of the beak while the indicators and air-vents form the nose. 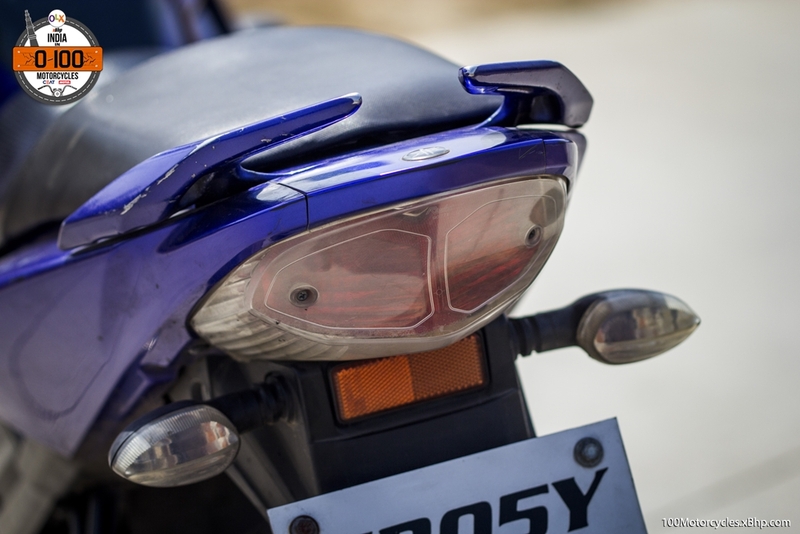 It is sharp enough and aesthetics aside, it is one of the most effective aerodynamic fronts one would find on a motorcycle. Period. 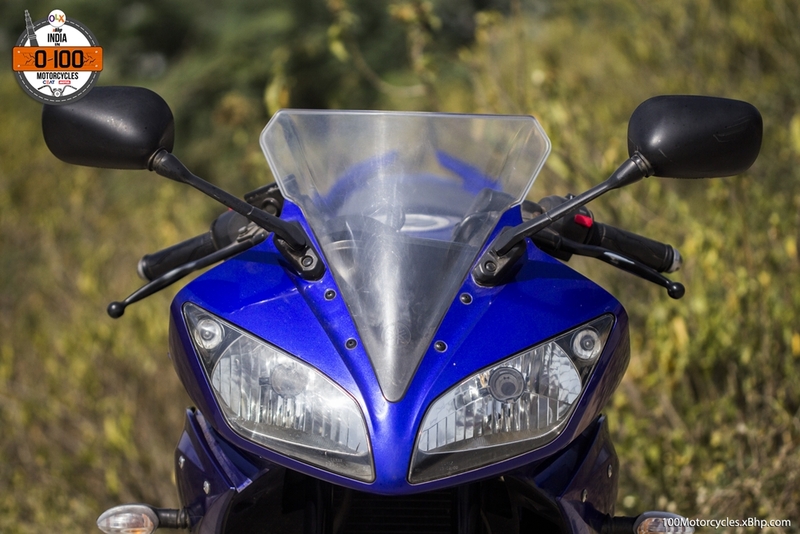 The whole fairing, from front to back, has been designed in a wind tunnel to tear through the wind with the rider tucked in behind the windshield. 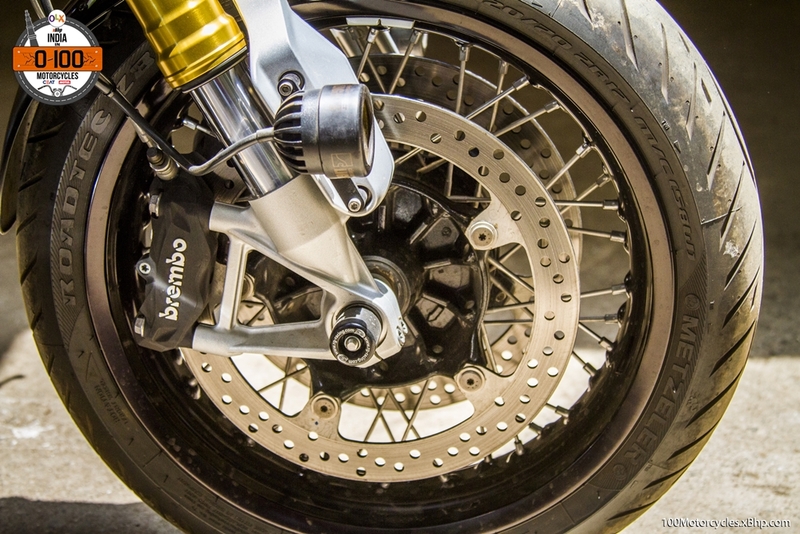 It is as stable as a motorcycle can get at all possible speeds. 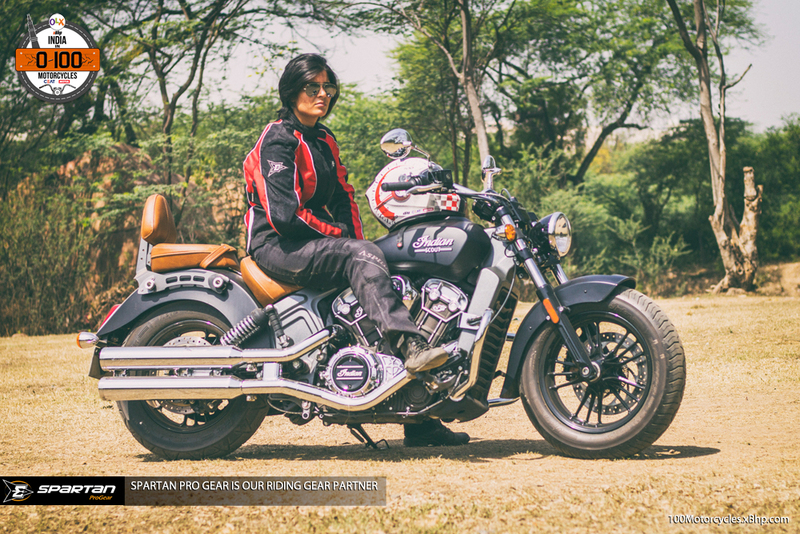 At xBhp, we have had a long association with this motorcycle and are smitten by its capabilities as a long distance sport-tourer. 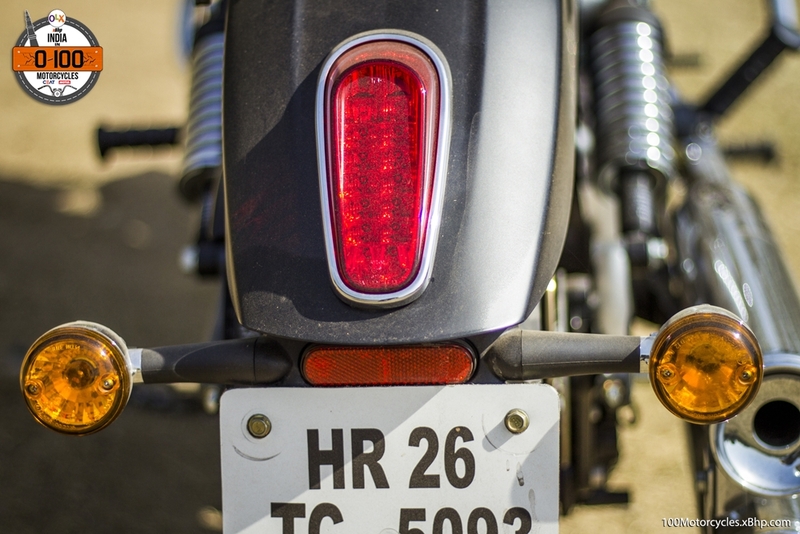 This motorcycle has been around on various pan-India rides and has proven to be an absolutely dependable two-wheeler. 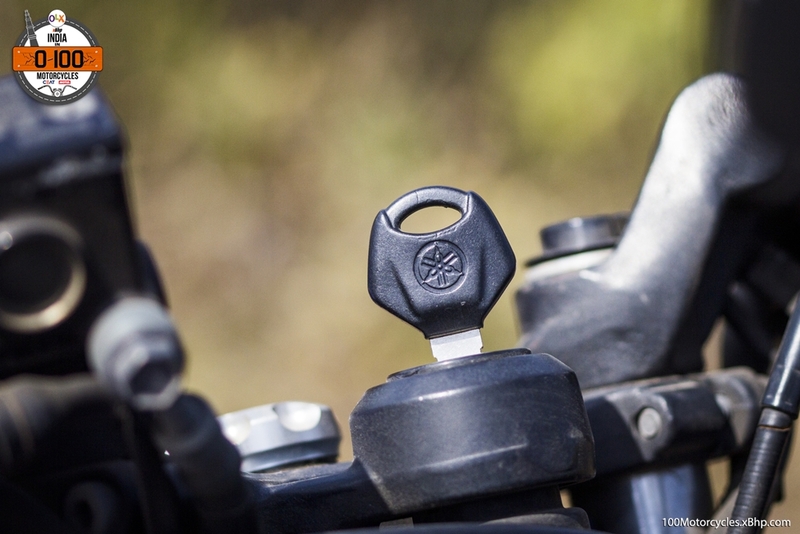 The reliability is absolutely bullet proof. It is not without its own share of faults, though. 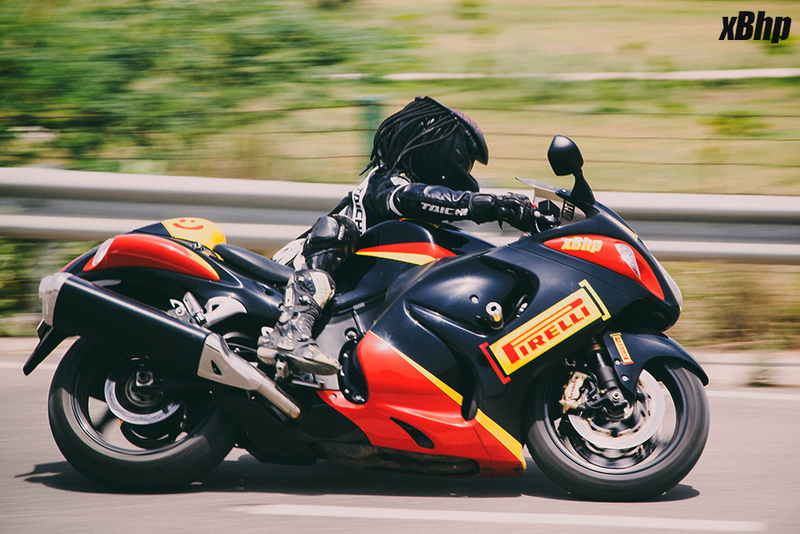 It heats up pretty good and the middle part of the frame becomes quite unbearable after a good ride in Indian traffic. Heat management can definitely be better. 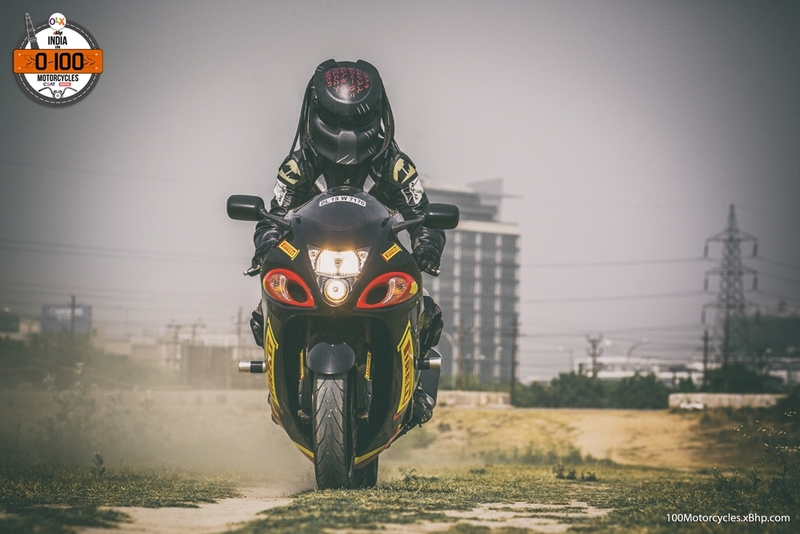 Suzuki now makes Hayabusa in India, but if you still find it a bit out of budget, perhaps, you can try searching it on OLX and find a good second-hand deal for yourself. 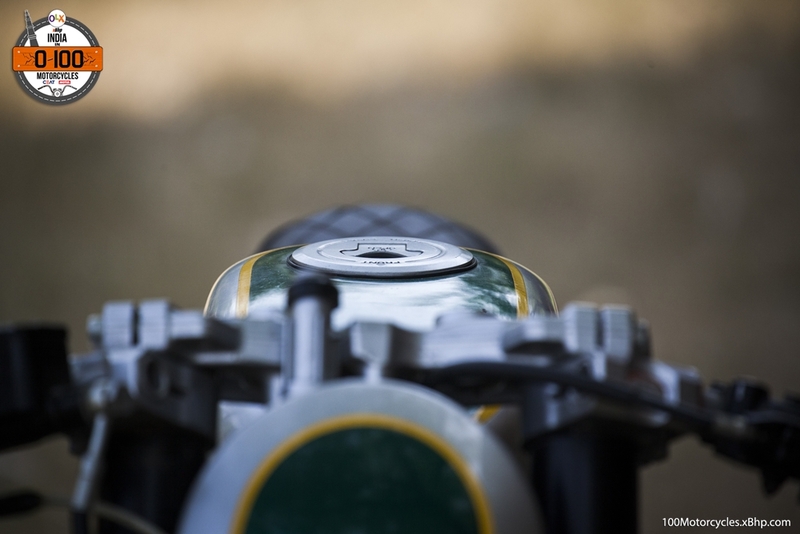 Suffice it to say that Hayabusa is one of the greatest achievements of mankind. 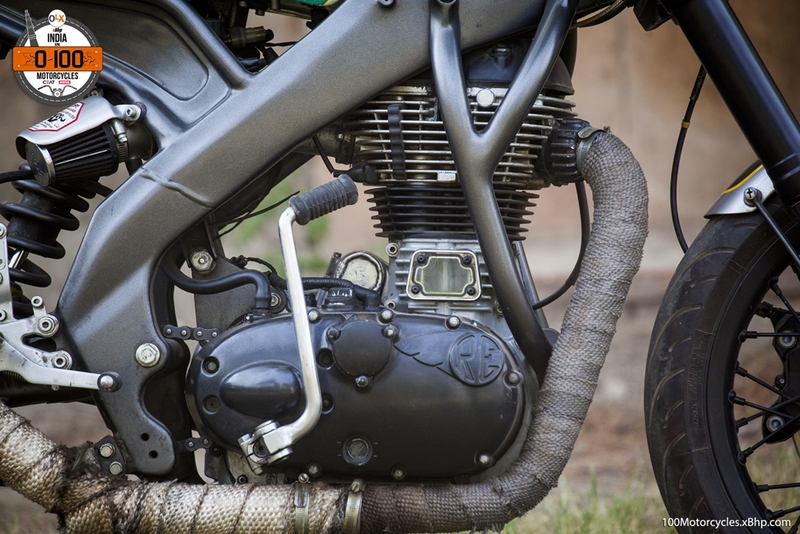 Personal preferences aside, it is one of the most important motorcycles ever made in the world. 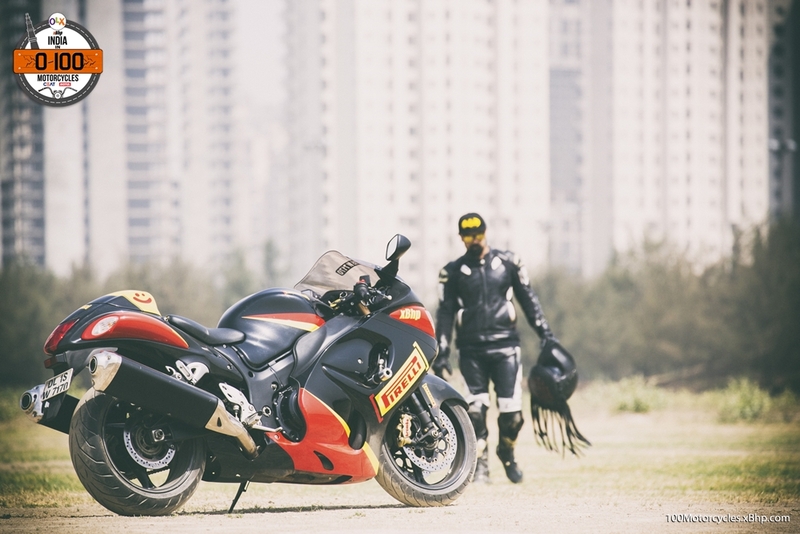 Even when its main competitor, Kawasaki ZX-14R, has more features, Hayabusa continues to be the favourite for many riders who are looking to buy a Hyperbike. The legacy is quite unmatched. 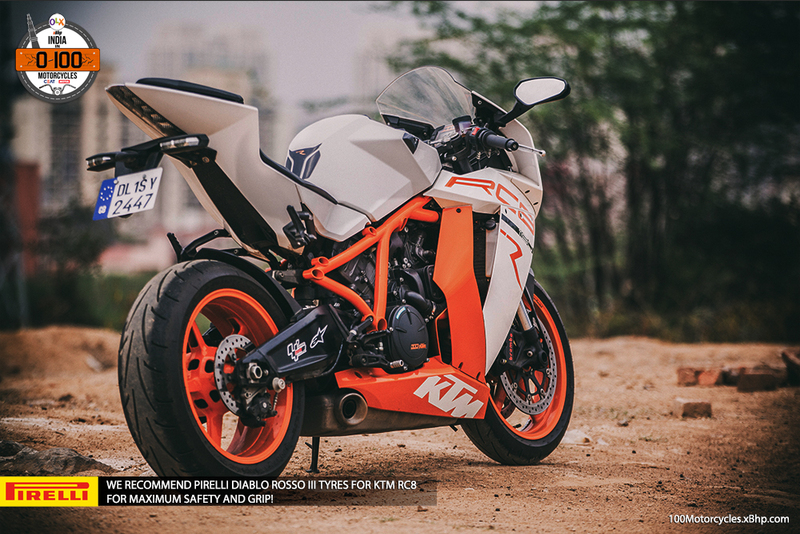 Buy a used KTM from OLX. 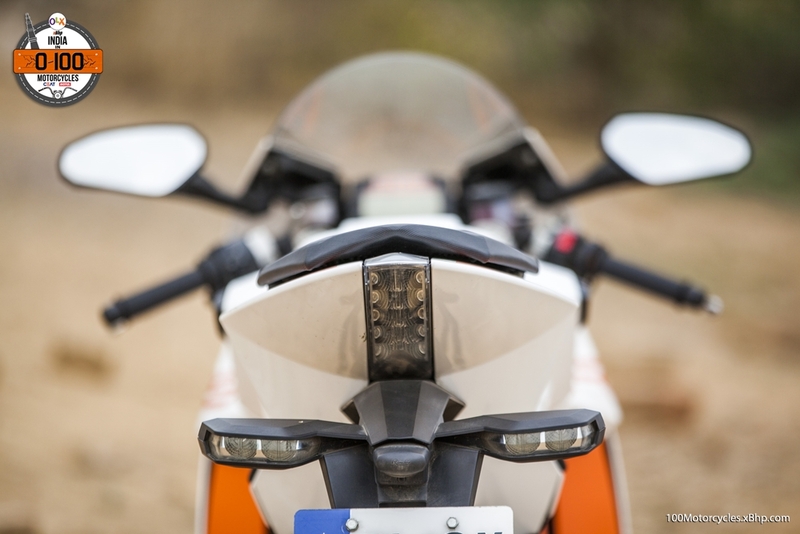 Sharp and edgy – the best way to quickly describe any street bike from KTM. 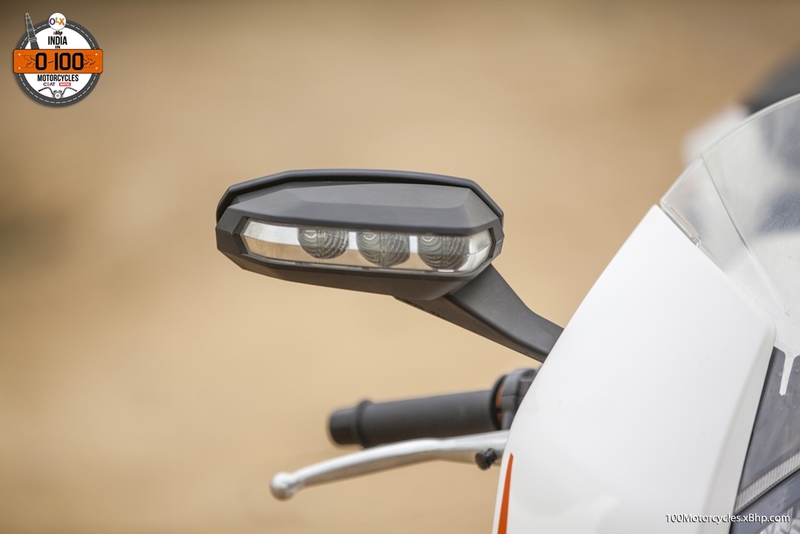 It wouldn’t be easy to find motorcycles that surpass KTM as far as the sharpness in design is concerned. Running short on budget? 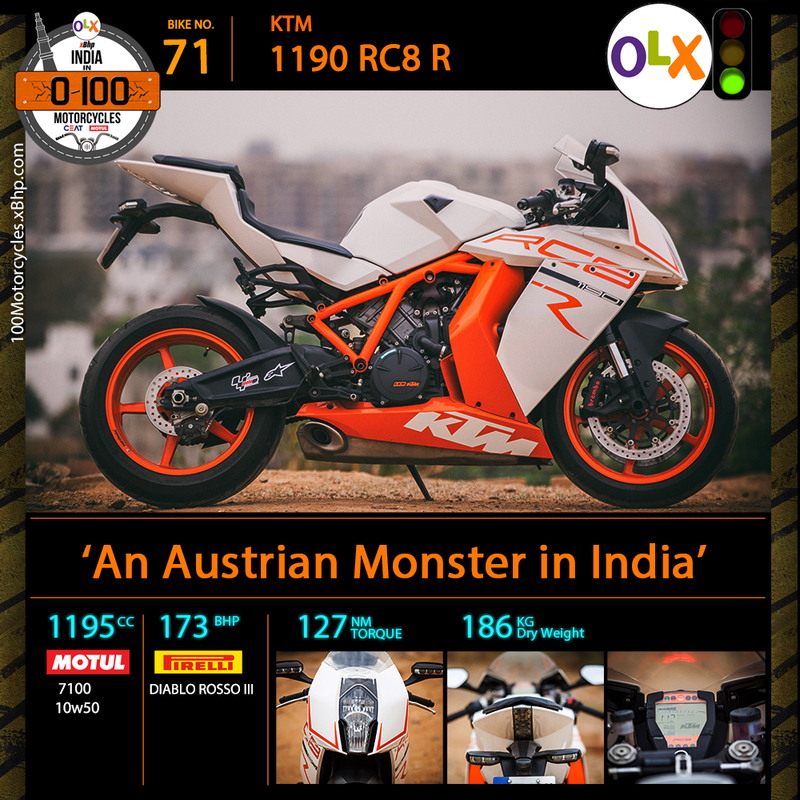 Find your favorite KTM motorcycle listed on OLX. 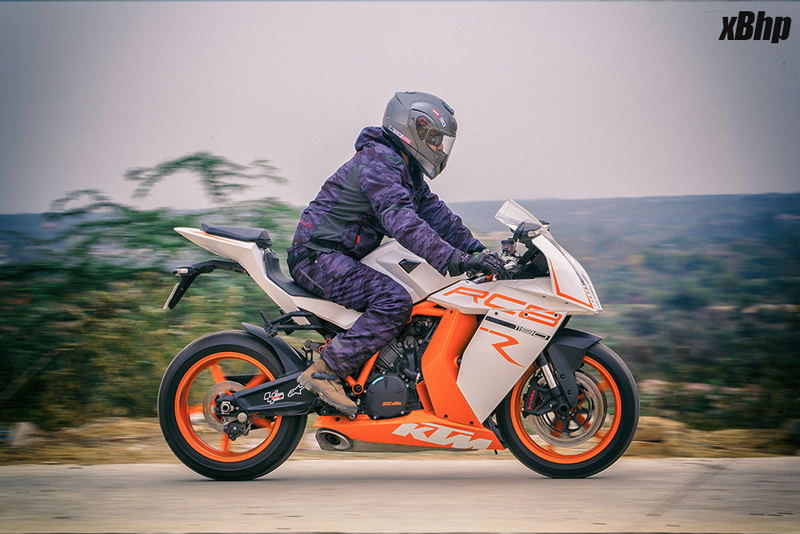 And with that trademark bright orange colour splashed in good amount all over the motorcycle, nothing else looks as lively. 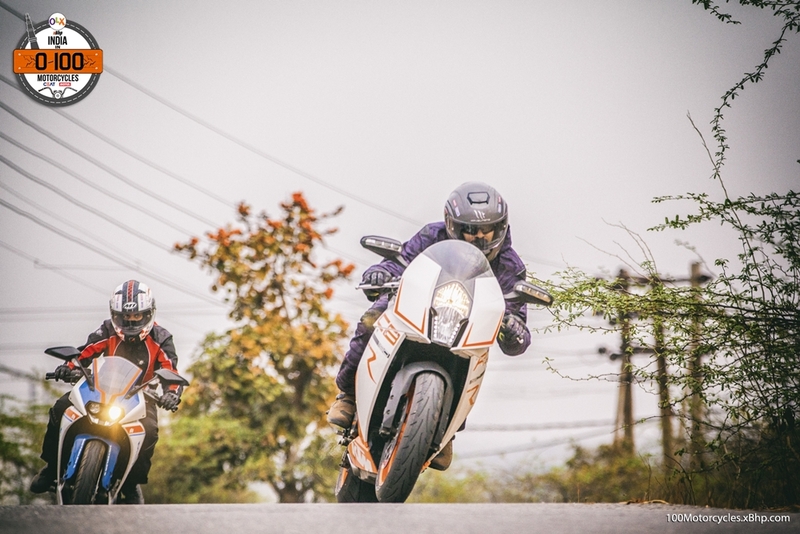 If you want fun, KTM offers some of the best motorcycles you could go for. 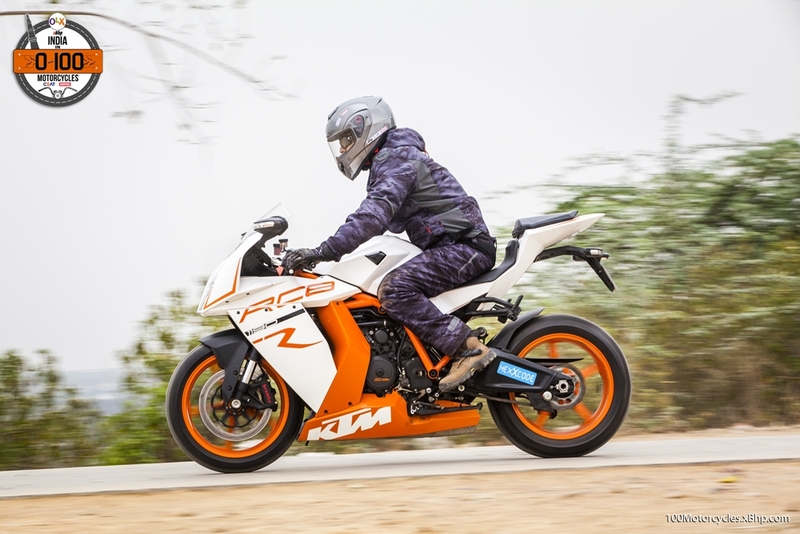 In that regard, we were given an unlikely opportunity to ride the RC8 R, KTM’s only Superbike till date. 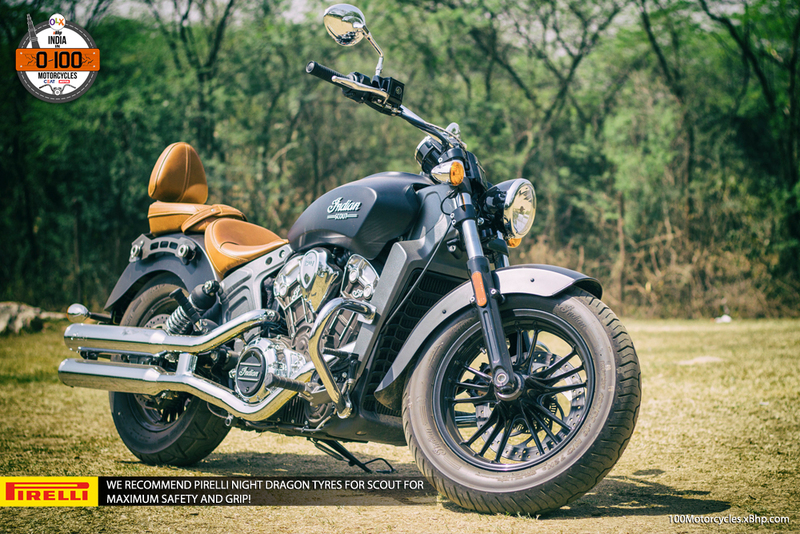 You guessed it right, it looks unlike anything in its segment, it is sharp and edgy but has a likeable design language overall. 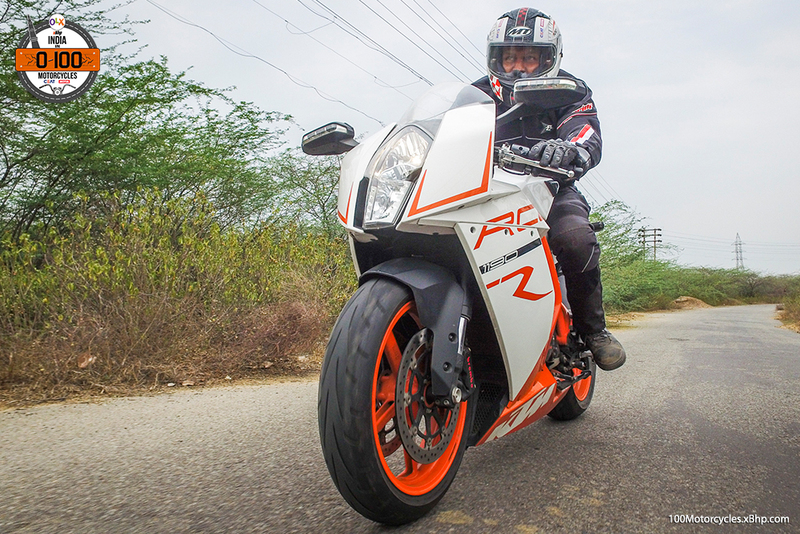 Splashed with a good dose of white and orange and a dash of black, the RC8 R looks like it is having fun even when parked at the road side. It doesn’t look uncomfortably restless, but eager to move. 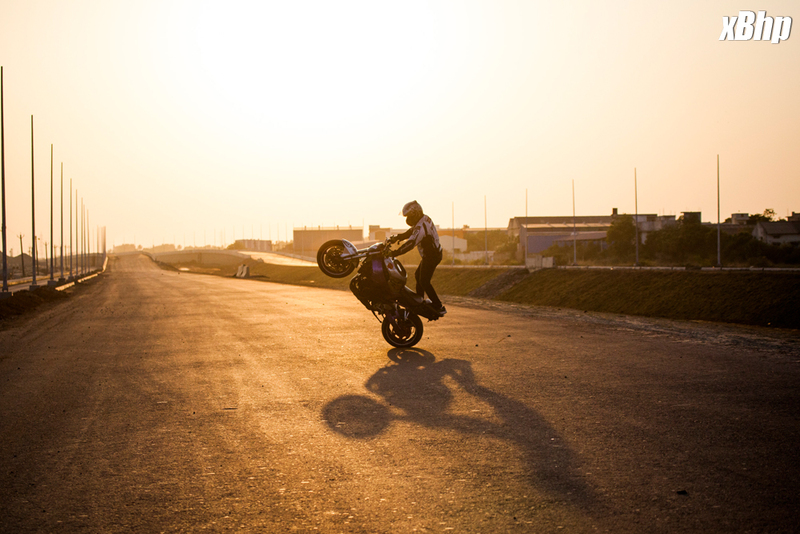 And that is a good thing if a sportbike can make you feel like that. 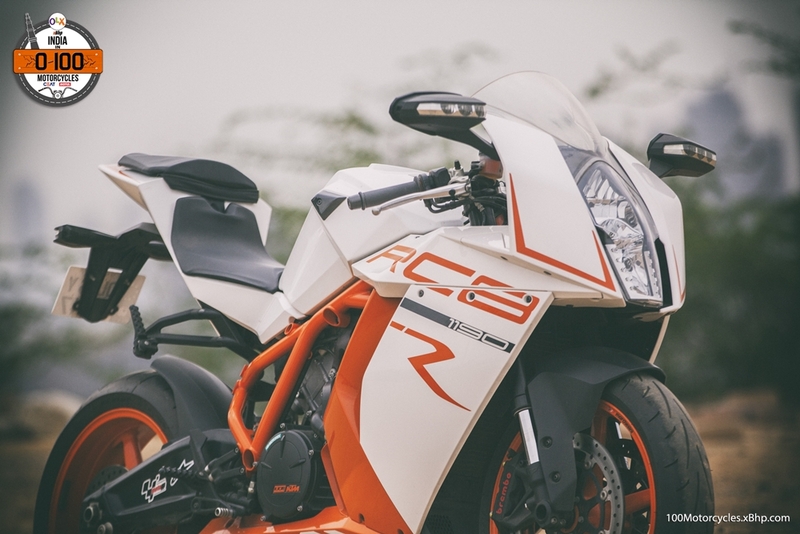 Initially displayed as a concept in 2005 with a 999cc engine from Super Duke of those times, the RC8 was launched in 2008 with an 1148cc V-twin engine. 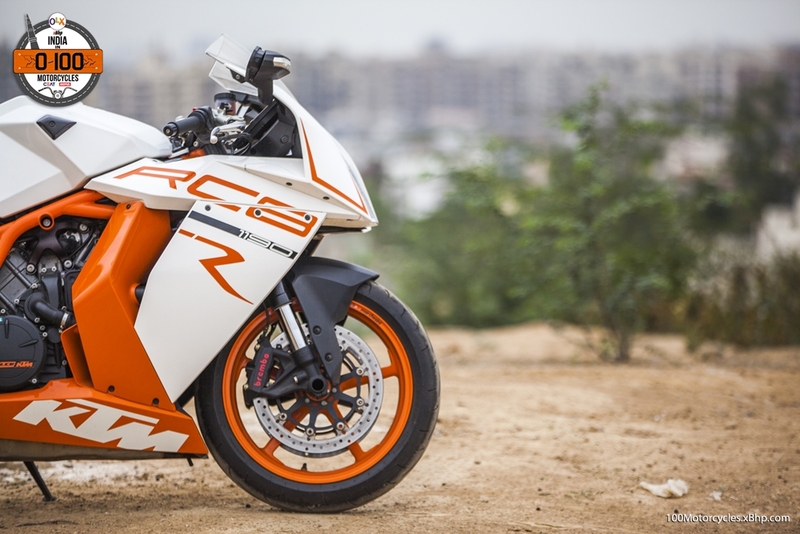 In 2010, the RC8 became RC8 R and the engine was upgraded to 1195cc with several other improvements in other areas like chassis to make it a better Superbike for street and track both. 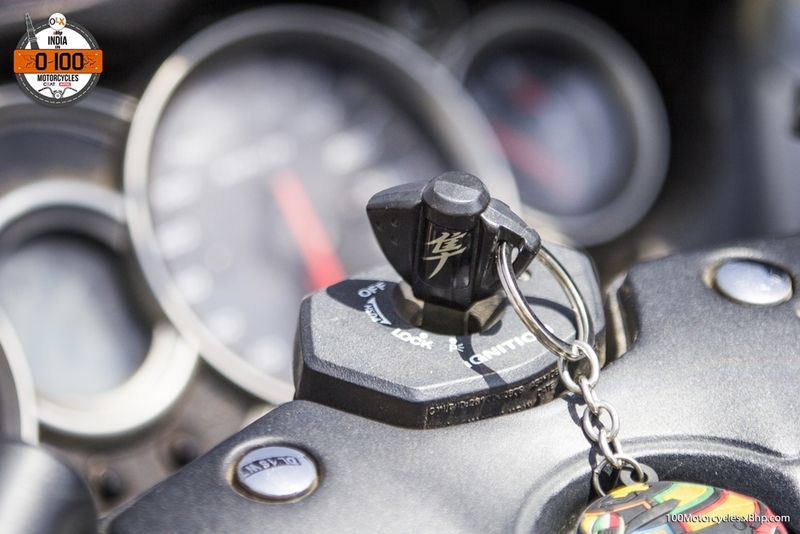 The power it produces is around 175 PS at 10,250 RPM while the torque is 127 NM at 8,000 RPM. 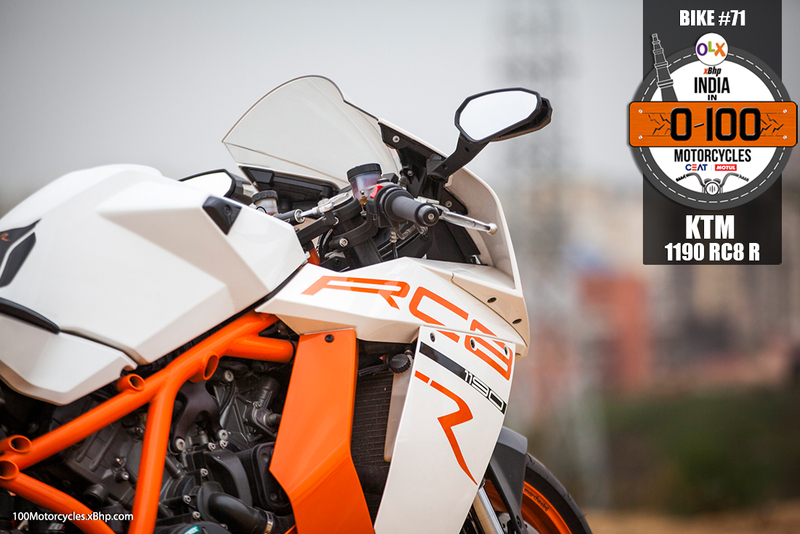 Yet, the most interesting thing about the RC8 R, other than riding it, remains its design. It is, shall we say, very geometrical. Look at the recesses on the fuel tank, they are straight lines joined together at various angles. 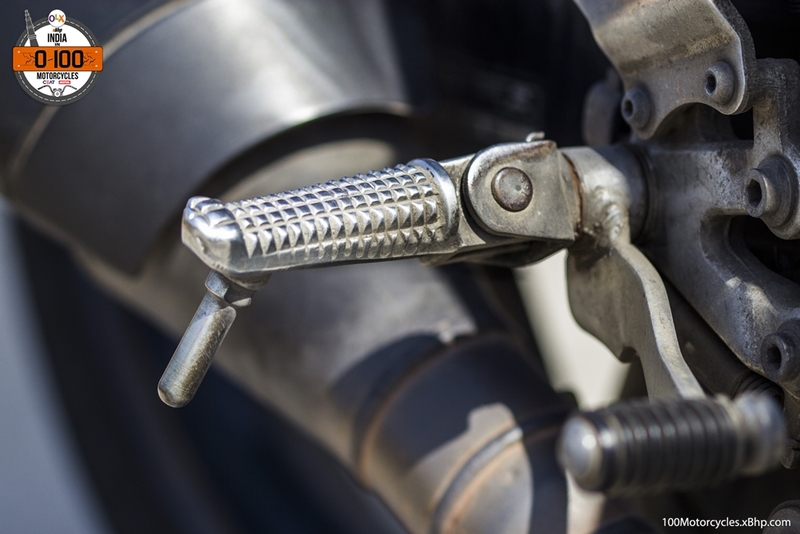 It is not a typically smooth bent of metal (or plastic)! 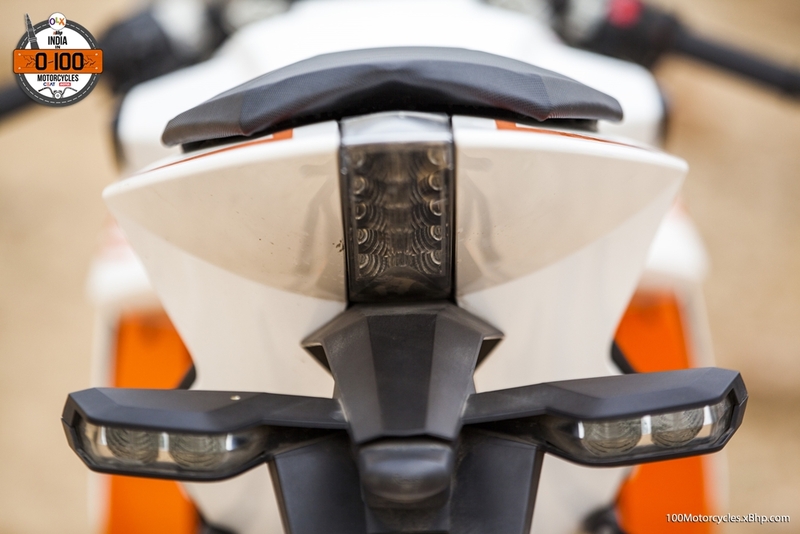 Same is the case with how the side fairing has cuts. They are a mixture of straight lines. 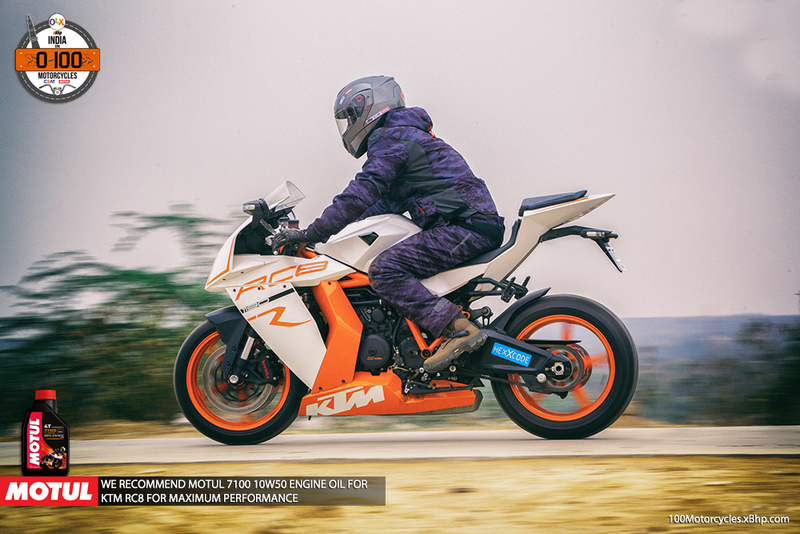 It is trademark KTM, this is how they make their motorcycles appear. 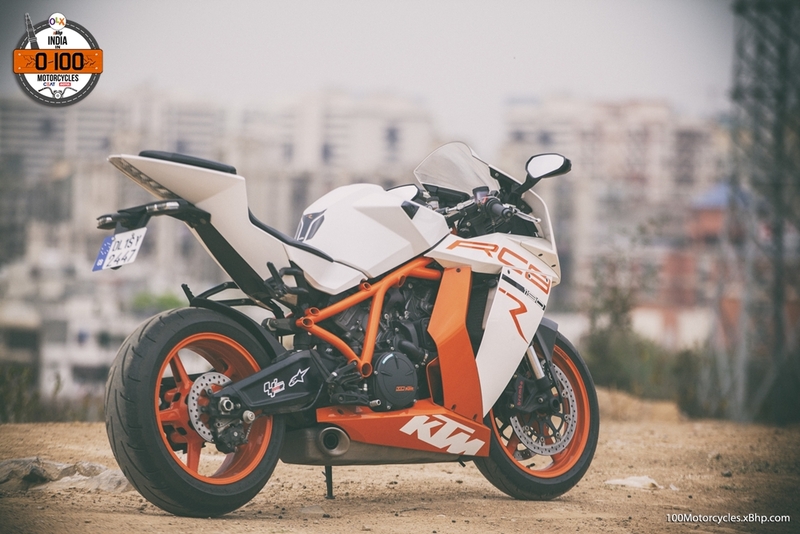 Even then, KTM has managed to make it look quite pleasing to the eyes. 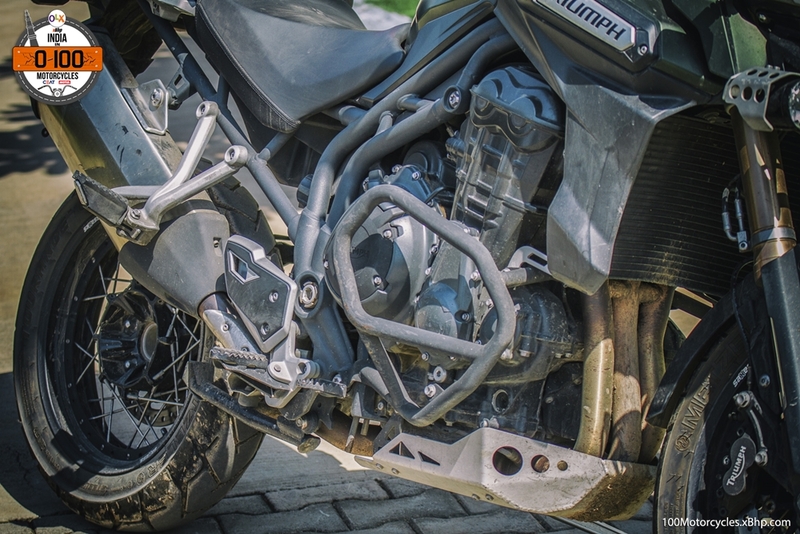 It looks as uncomfortable as any other Superbike out there. But how would you know unless you’ve ridden it? 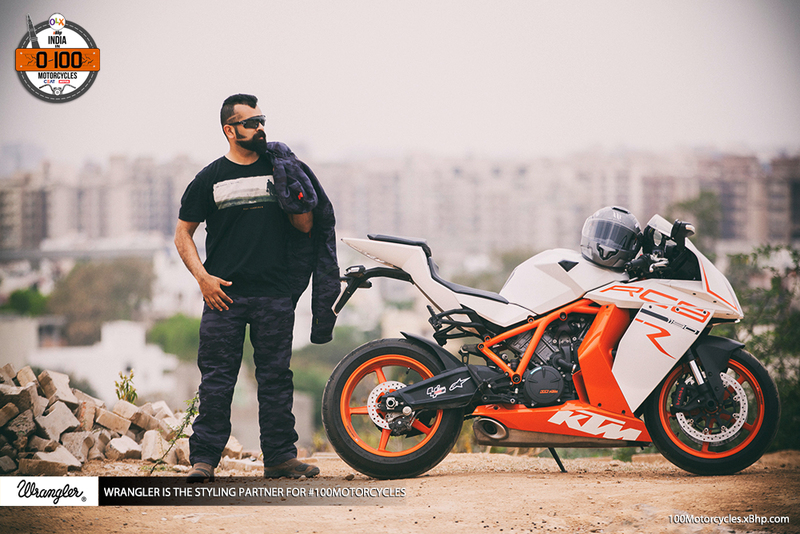 After reading numerous international reviews and finally riding one ourselves, we can tell you that this radically designed KTM is quite accommodating and isn’t as torturous to sit on as it might look. 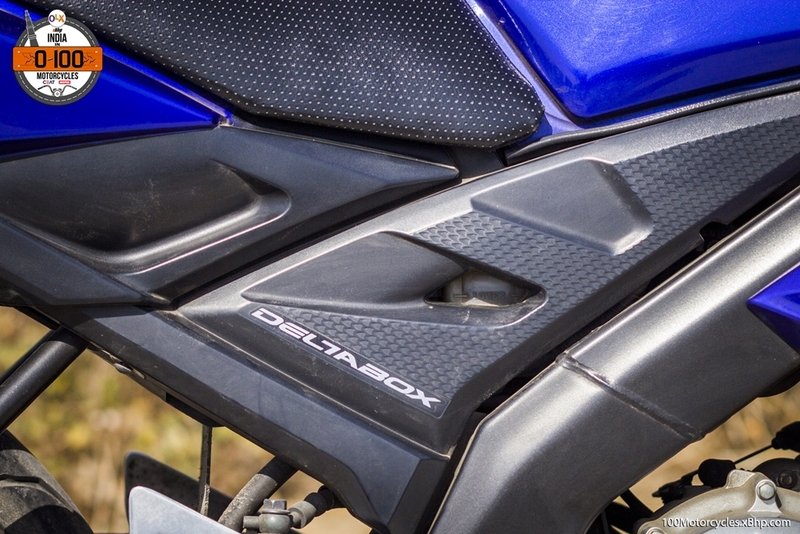 It is, by far, not the most uncomfortable Superbike and that is saying something. 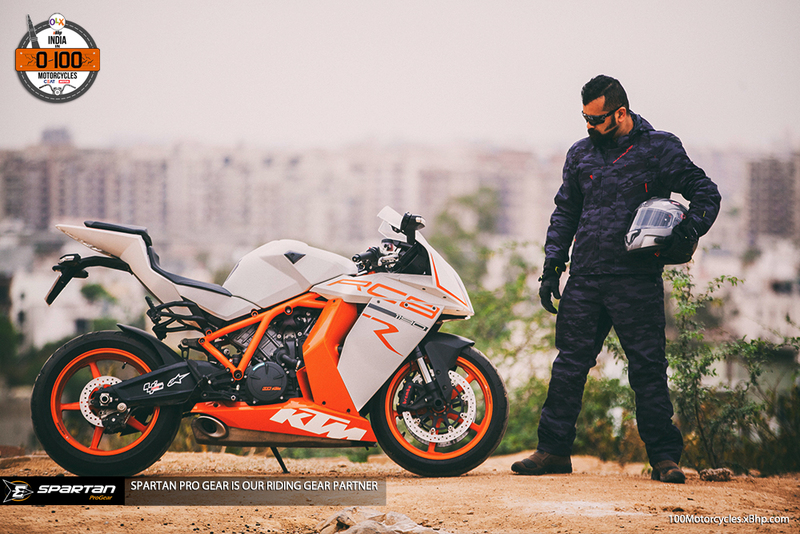 We Sincerely thank Mr. Rohan Chhibbar for his valuable time and letting us ride his KTM 1190 RC8 R.
By all means, it is a great value for a Superbike if you can get one. 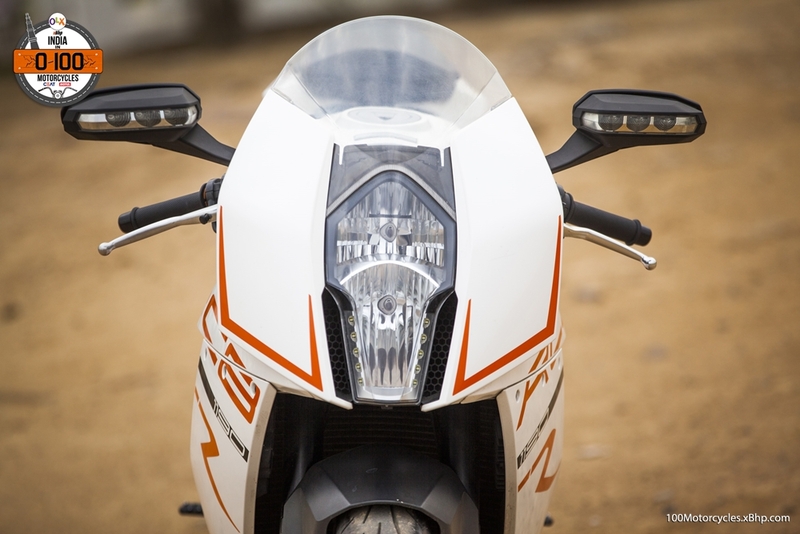 KTM never really launched it in India. But some people do have it and for this reason, you might find one on OLX if you give it a try. 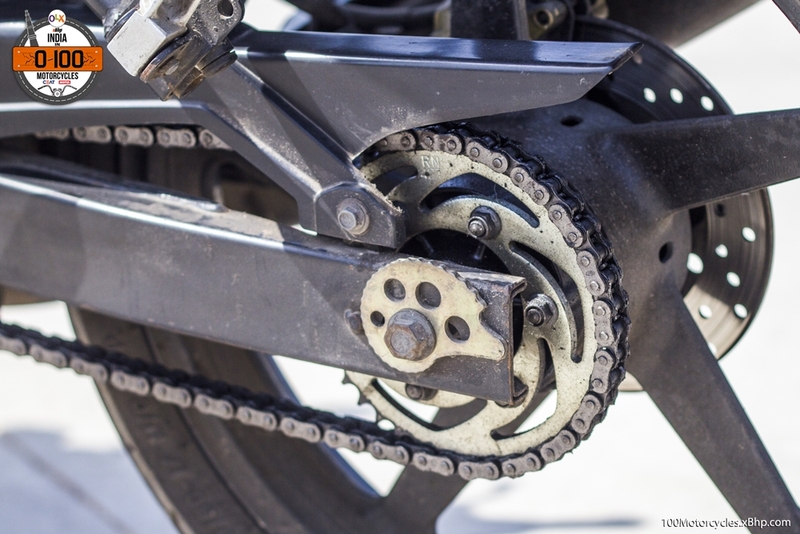 However, it is time for KTM to bring out a new version of their Superbike because nearly 175 horsepower at crank is not going to cut it anymore. It is the time for 200 hp plus a plethora of electronics. And there’s hope. 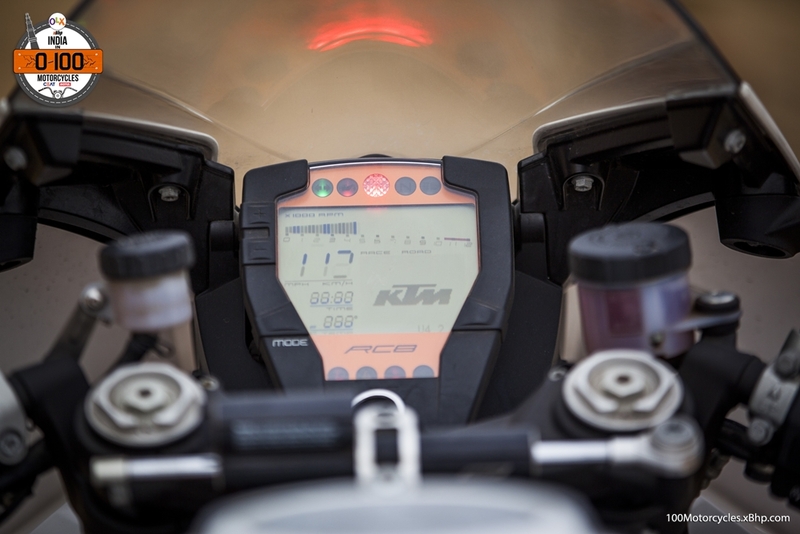 KTM is getting ready to enter MotoGP for next season (2017) with their RC16 race bike which the company revealed some days back. 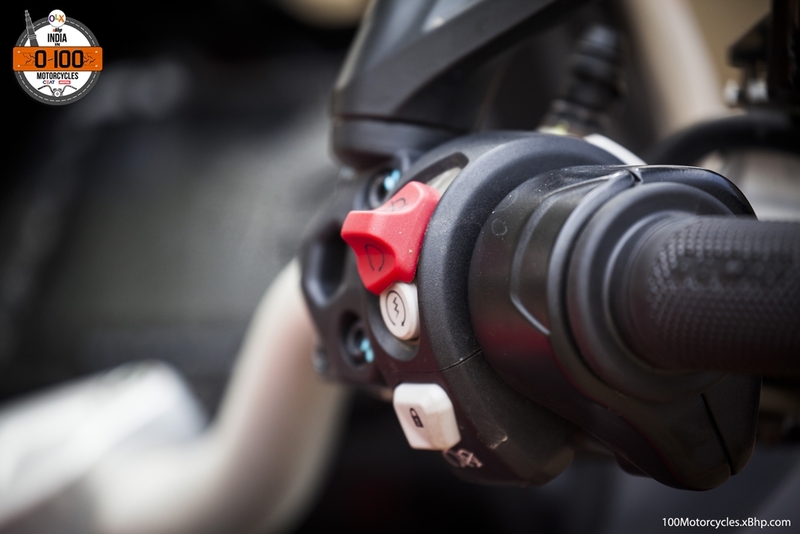 Of course, we can expect KTM to be working on their new production Superbike as well and it is safe to assume that it will be one hell of a machine, up there with the best. Evolution is the name of the game. It is inevitable, it is life. Everything, living and nonliving, evolves with time. As we continuously work, we discover new ways of doing the same thing. Or, should we rather say, better ways of doing the same thing. 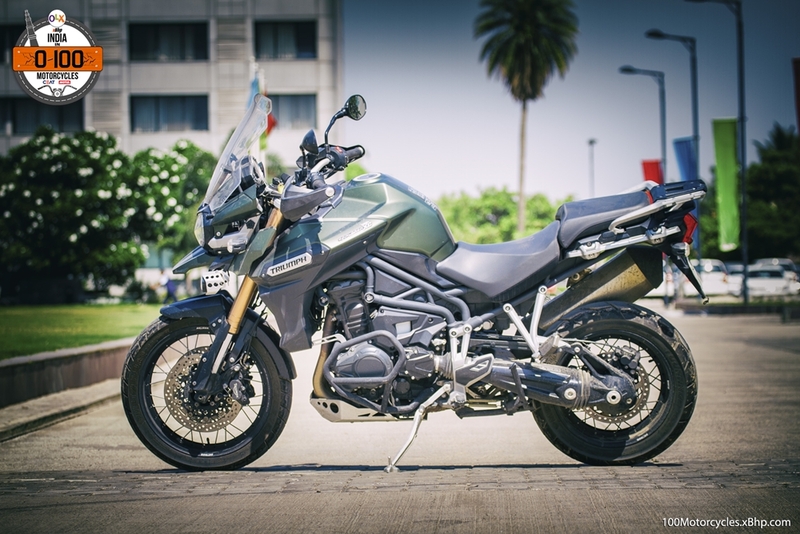 Sport-touring is a concept born out of the “need” of sportbikes that are fast inclined more towards better handling and braking rather than outright speeds, but at the same time, they do not sacrifice rider and pillion comfort even with luggage. But this isn’t something new, motorcycles like these have long existed. 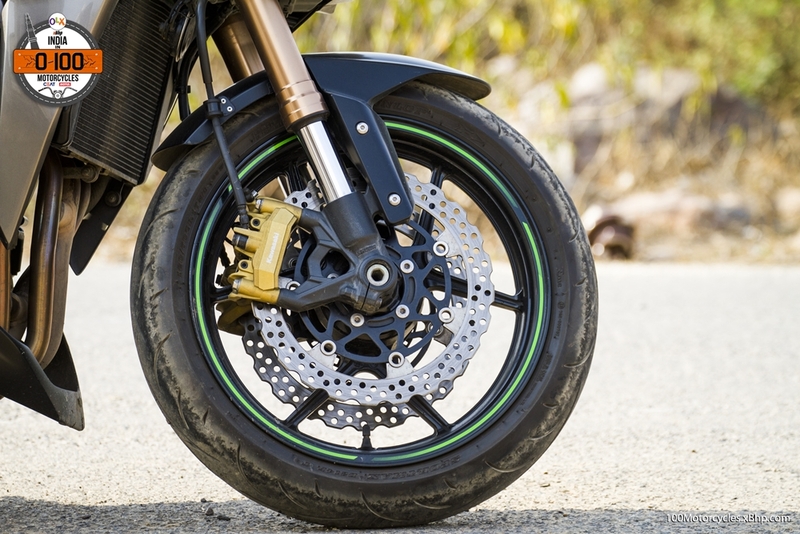 What’s new is that sport-touring motorcycles are continuously evolving and thinning the gap between themselves and Superbikes. 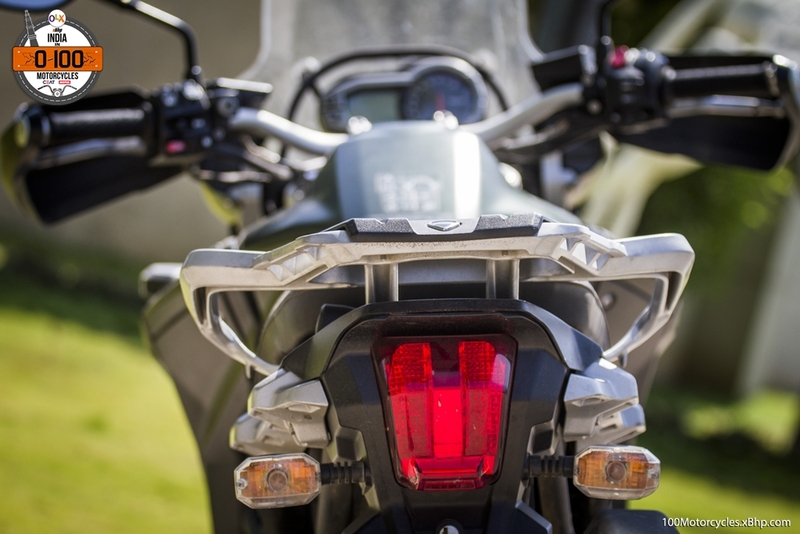 For example, the Ducati Multistrada. 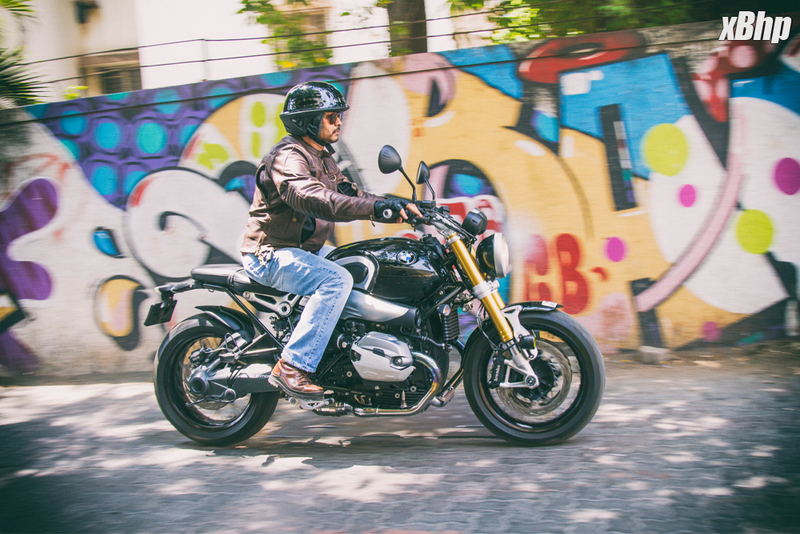 A lightweight designed to be a multi-tasker – easy handling in city traffic, extremely stable for high-speed highway riding and exceptionally sporty on tracks and canyon-carving. And that engine? Oh well, what a screamer! 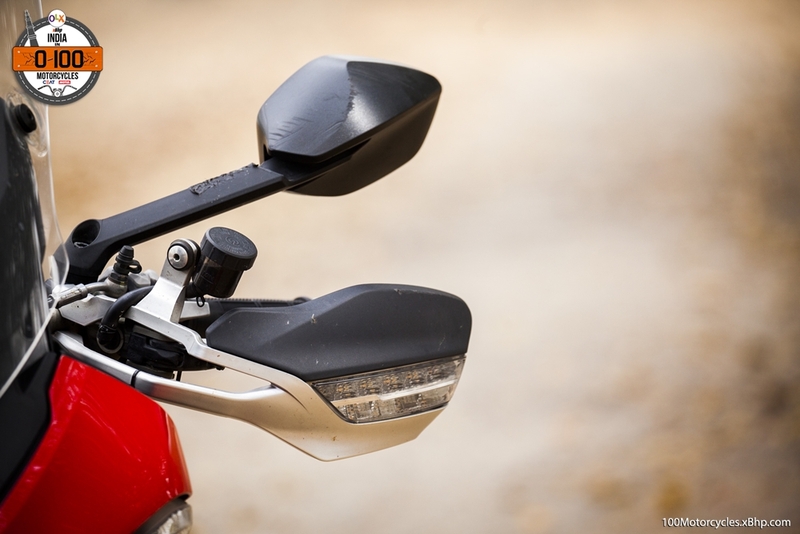 Taken from the 1198 Superbike, the 1198.4cc L-twin engine is one of the most performance oriented twins in the world today. 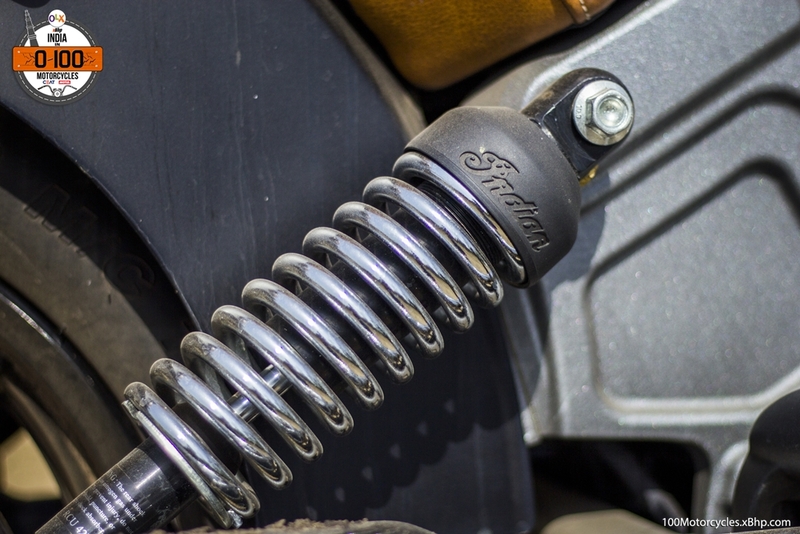 Capable of dangerously high speeds but thanks to the first-in-production-motorcycle DVT (Ducati’s version of Variable Valve Timing), it is sweet to ride at low speeds as well. 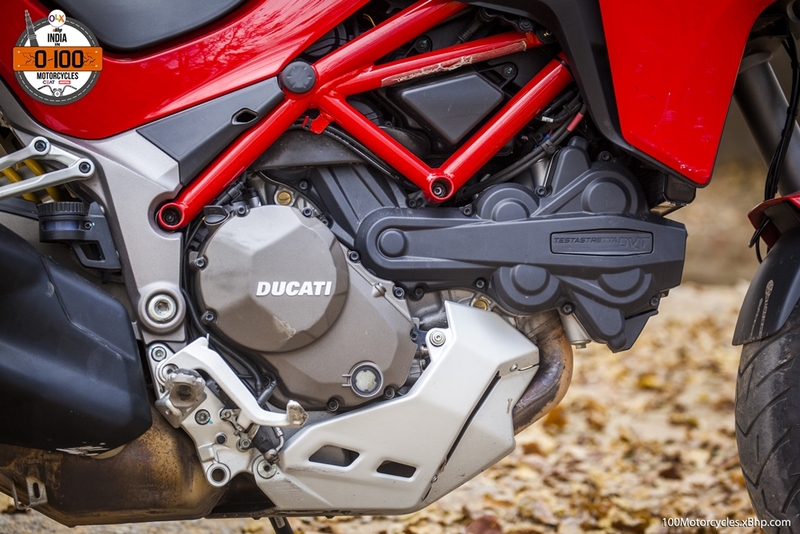 It isn’t rough like the old Ducati engines anymore. 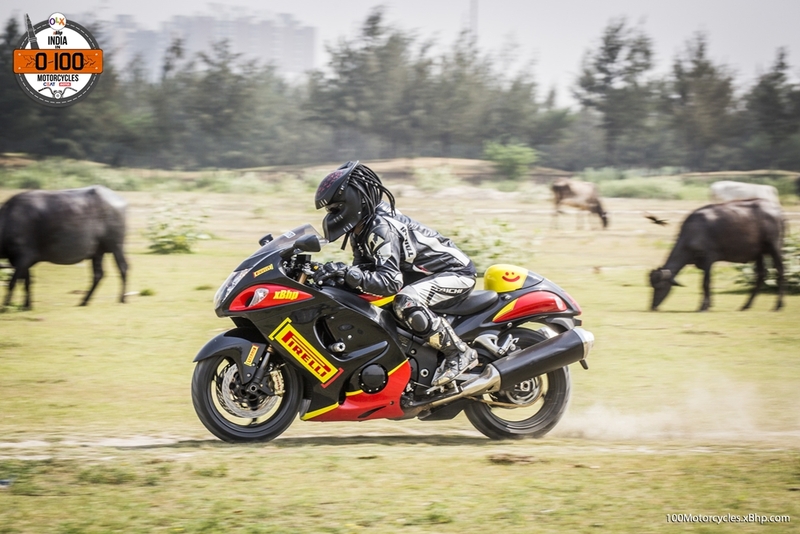 This new breed is an all-rounder. Evolution. 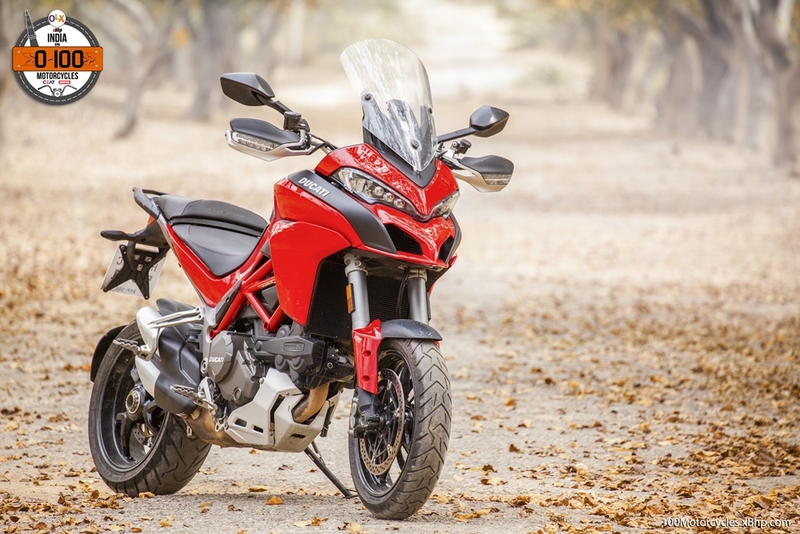 But the history of Multistrada goes back to over a decade. 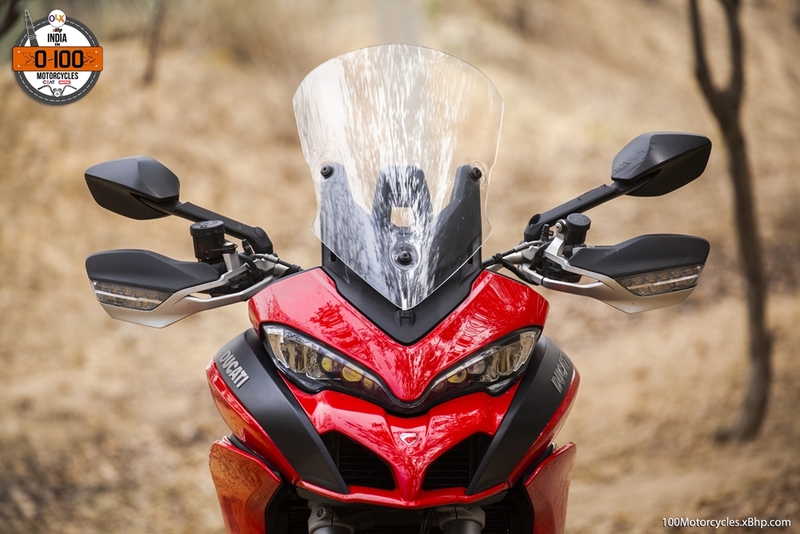 Launched first in 2003 as the Multistrada 1000 DS, it was received with mixed response. 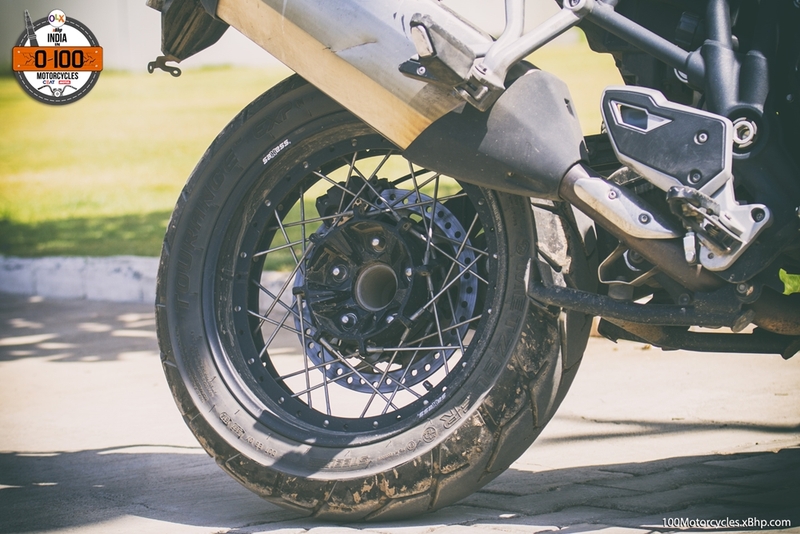 While it was praised for its versatility as a sportbike that offers comfort for long rides as well, the styling wasn’t to everyone’s liking. Yet, it was a decent success overall and while it continued to receive engine updates, it went on looking like this till 2010. 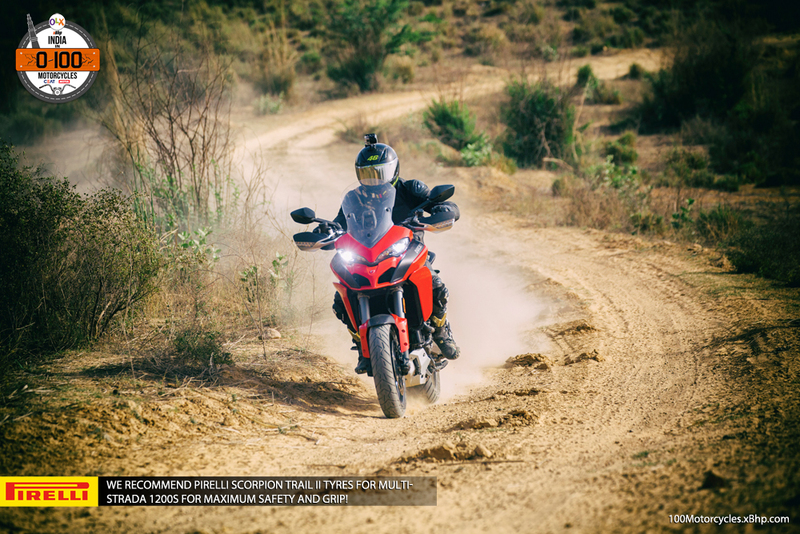 It was in then when Ducati finally launched the all-new Multistrada complete with new engine, chassis, suspension and design, and changed the dynamics of sport-touring forever. 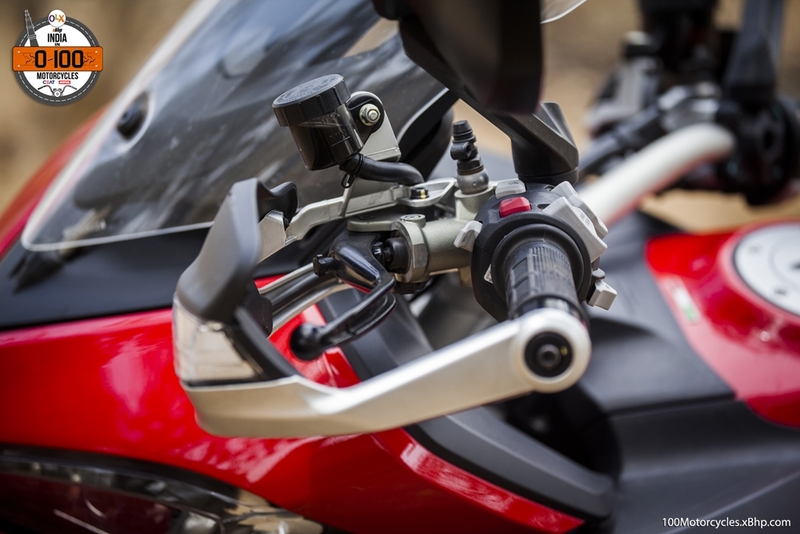 It is the reason that today BMW has the S1000XR in their motorcycle lineup. 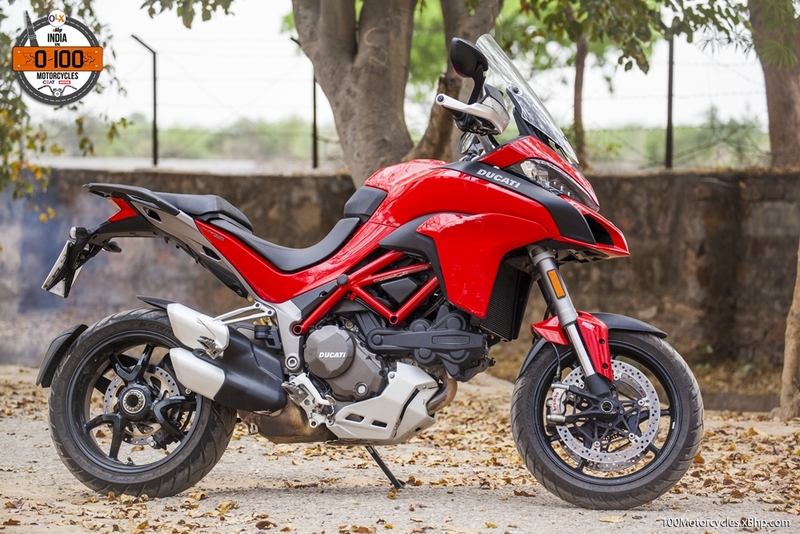 For our India in 0 to 100 Motorcycles project, we got the chance to ride the Multistrada 1200 S which comes with Ducati Skyhook Suspension which means that the suspension automatically adjusts in real-time depending on the road conditions to provide the best possible ride quality. 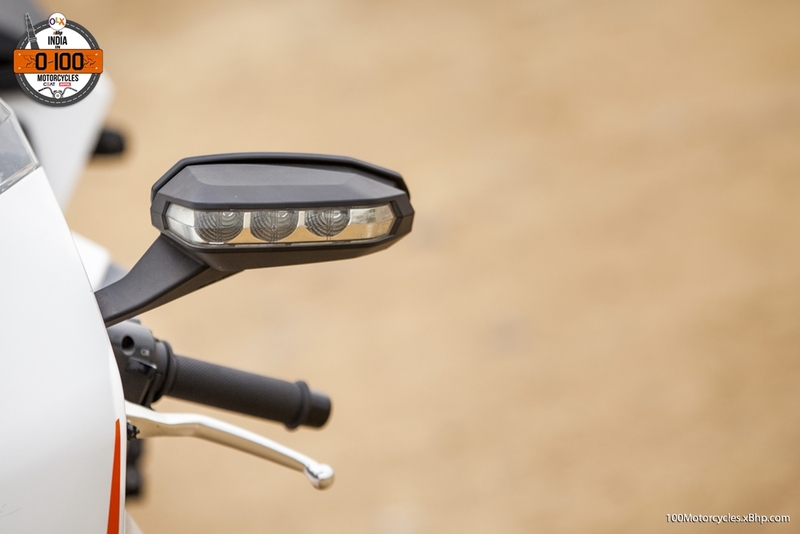 The S variant also comes with LED headlights that are also equipped with Ducati Cornering Lights technology – this enables the headlights to point towards the direction the motorcycle is turning giving the rider a better view of what’s ahead at night. 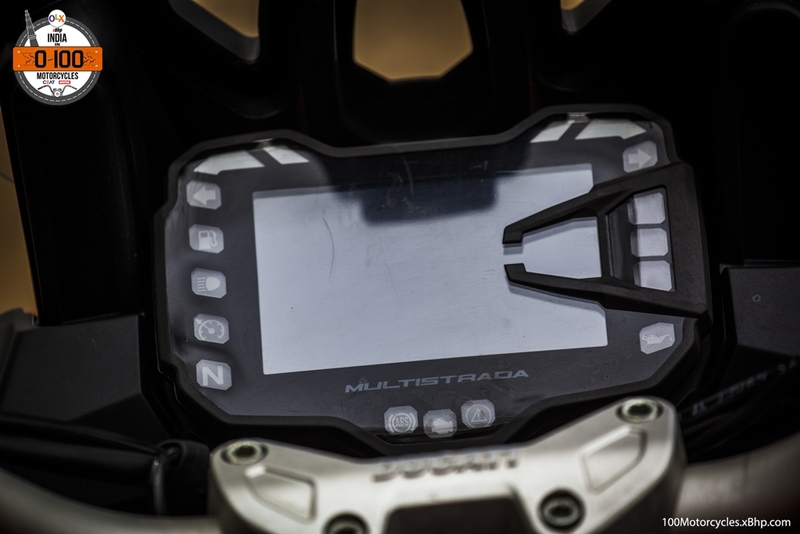 Then there’s Ducati Multimedia System which allows the rider to answer incoming calls and listen to music from his phone. The phone can be connected via Bluetooth. 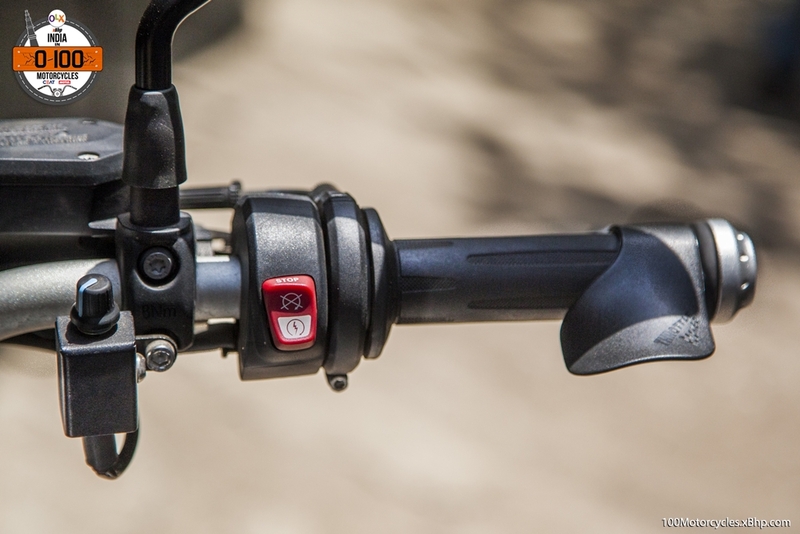 Lastly, there’s the Inertia Measurement Unit (IMU) which has various sensors to allow traction control, ABS and other electronics work better in various riding conditions. 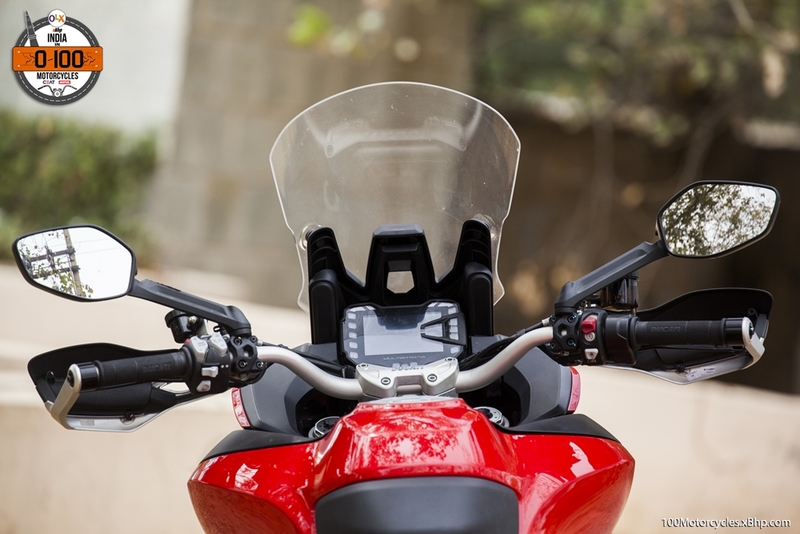 xBhp has a long history with the Multistrada as well. 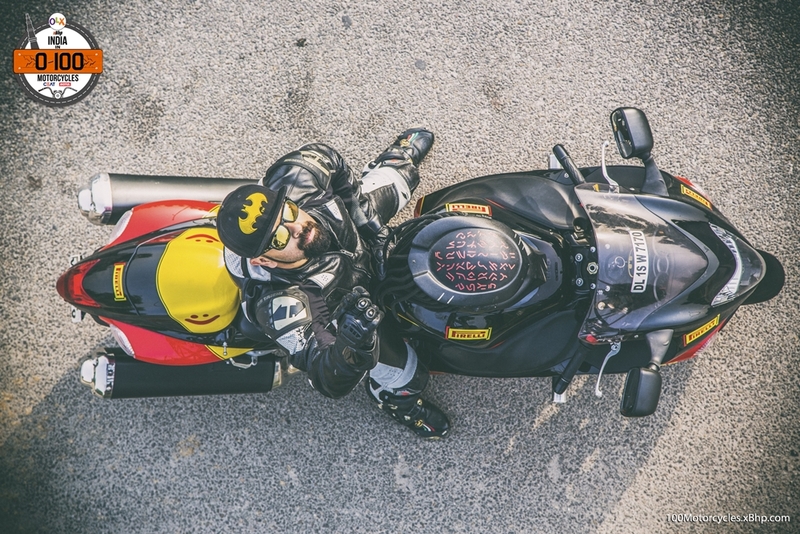 We rode it for the first time in one of the most memorable rides that we undertook – we rode it from Dubai all the way to the World Ducati Week. And then there were many other rides in other countries. 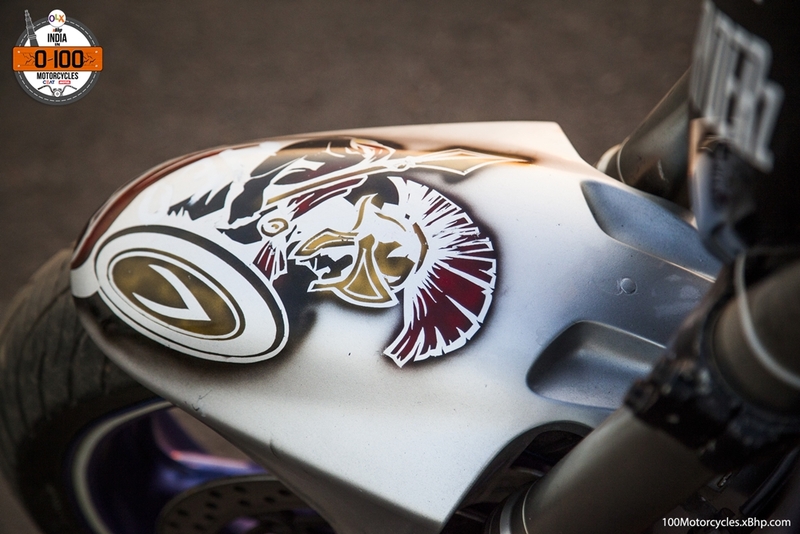 This motorcycle is virtually a part of our family. 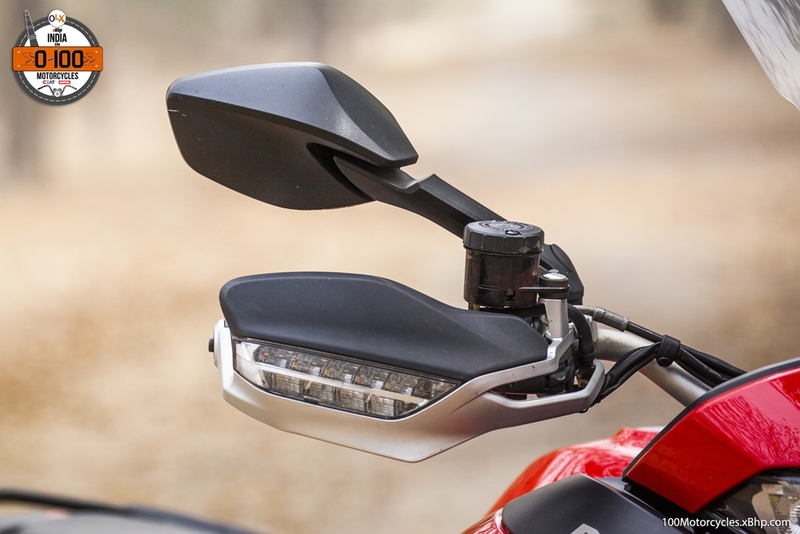 We have always had a fantastic time on Multistrada. 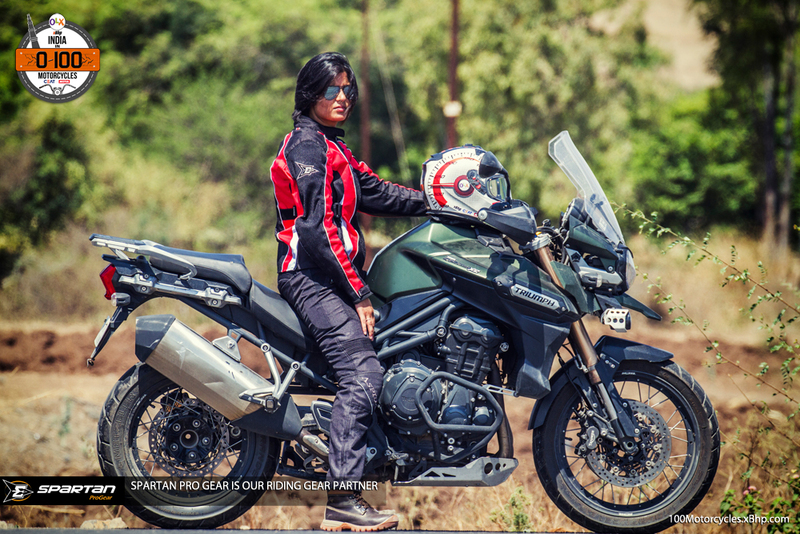 It is almost like the torchbearer of its category of motorcycles, someone who shows the way forward. 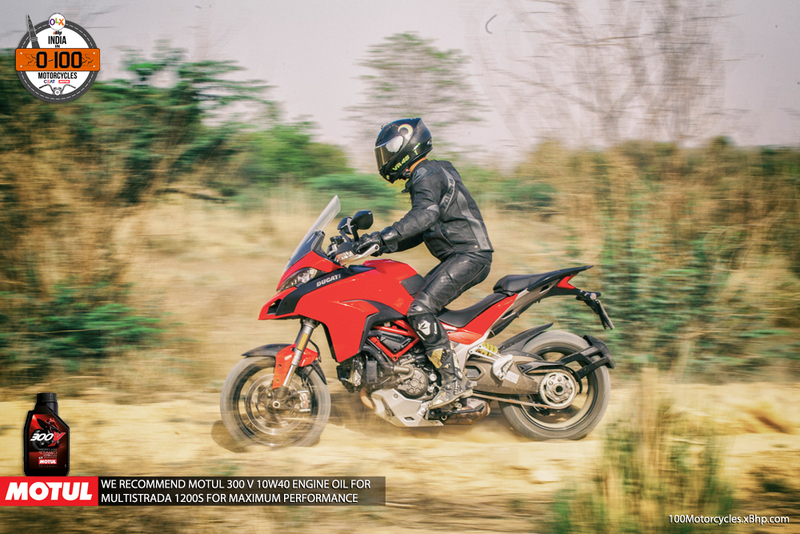 It is indeed one of the best multipurpose motorcycles that anyone can buy today. 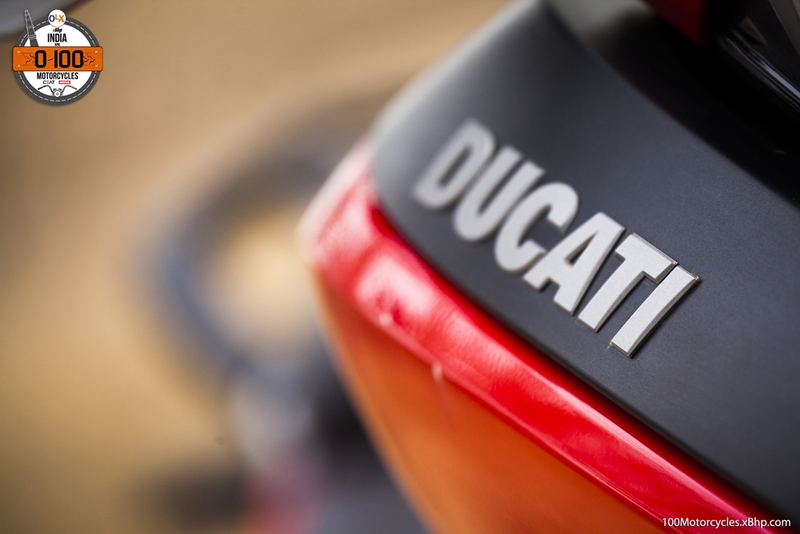 Great job Ducati! And I case you’re finding it out of your budget as a brand new motorcycle, you can always try to find a second-hand one on OLX. 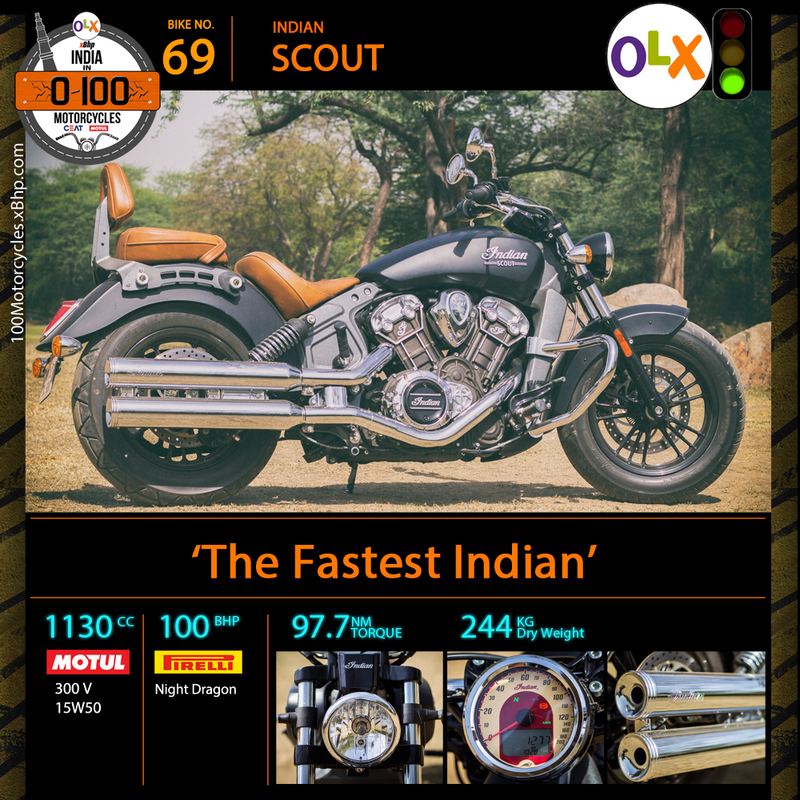 69Indian Scout – The Fastest Indian! 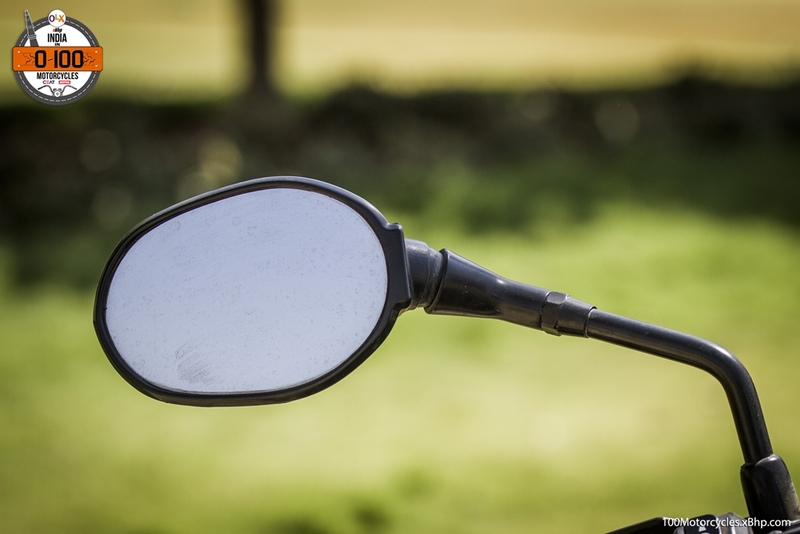 Sell your old Motorcycle on OLX. 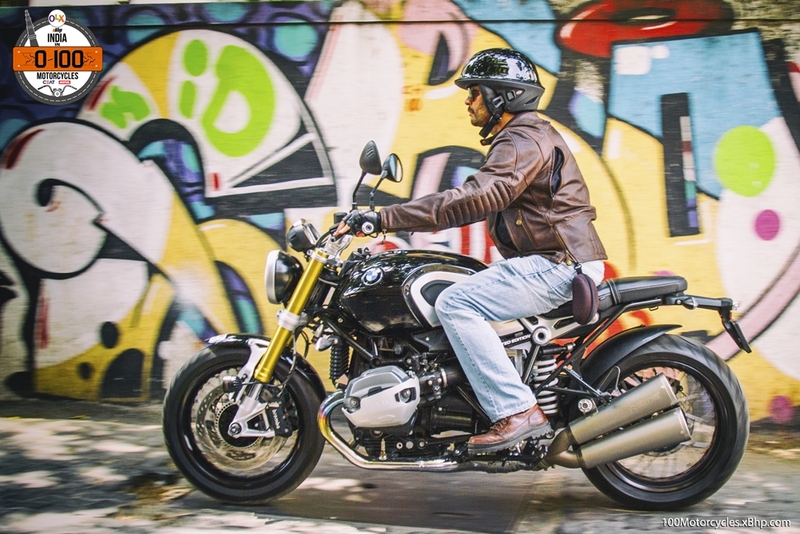 Every prominent bike maker has had at least one motorcycle in their arsenal which brought them the much-deserved fame. 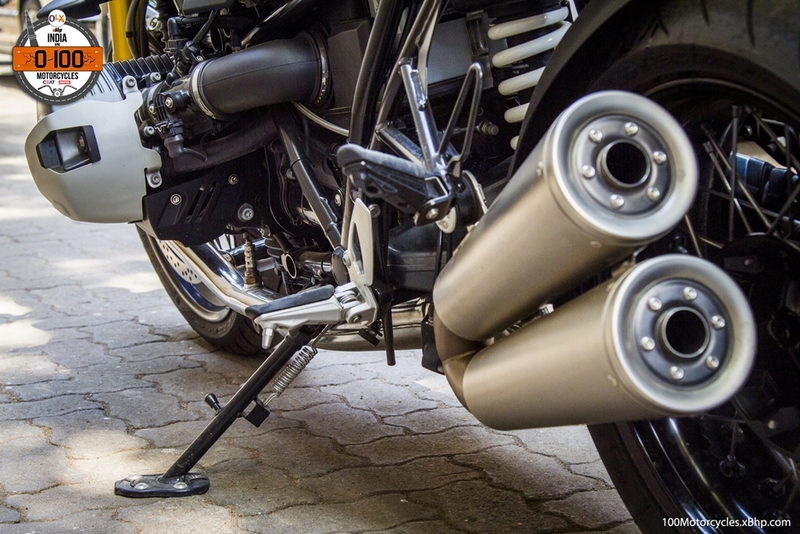 Be it cruisers, sportbikes or dirt bikes, certain manufacturers have made a huge impact in one way or the other. 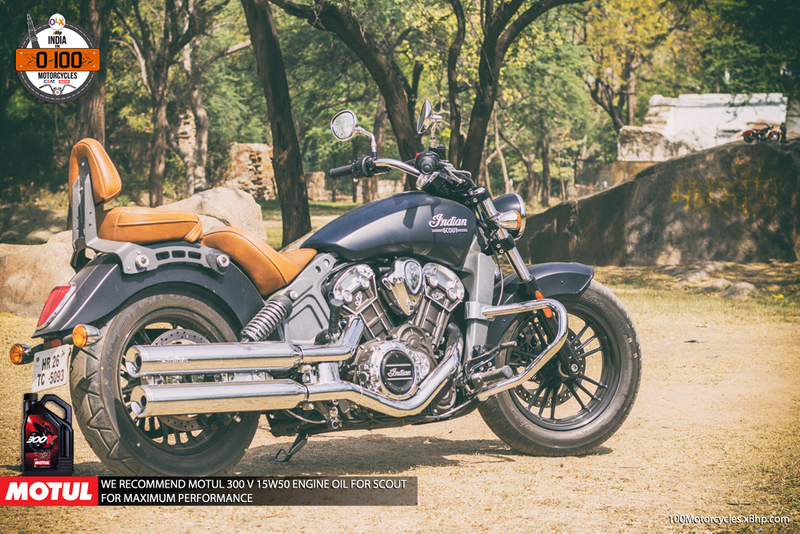 Indian is an American company which specializes in manufacturing cruiser motorcycles. 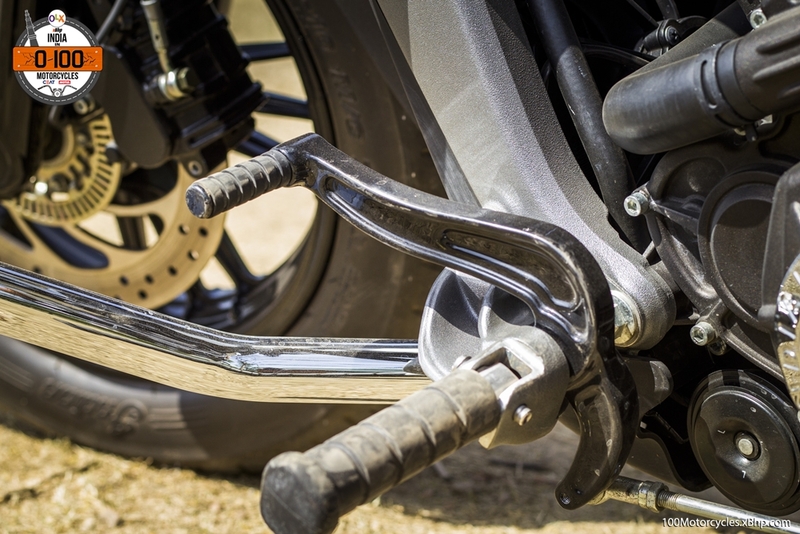 It is America’s oldest motorcycle manufacturer which came into existence in 1897 as Hendee Manufacturing Company. 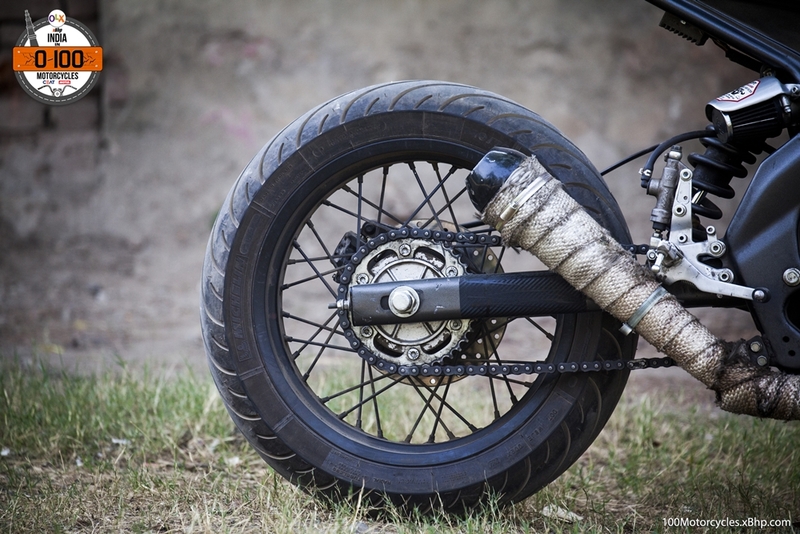 It has been making motorcycles since 1901 and sold their first motorcycle to the public in 1902. 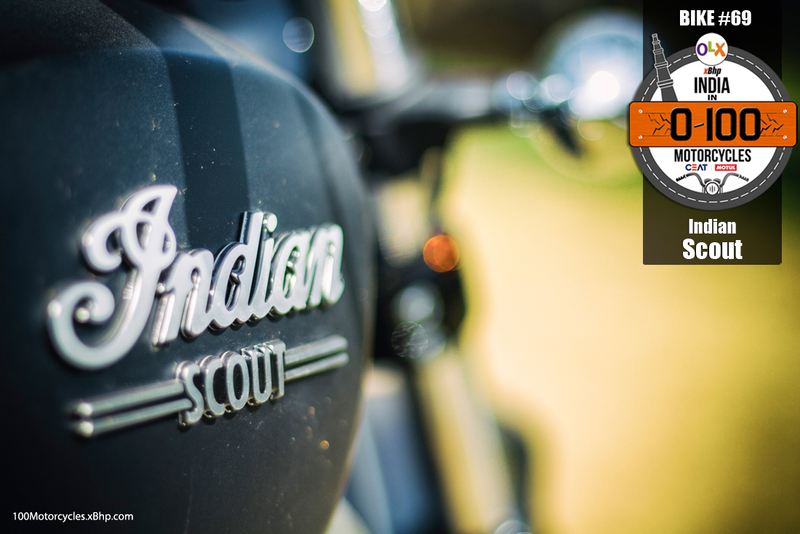 But not until 1920 did Indian achieved worldwide fame like never before when it launched a motorcycle by the name of Scout, one of the most popular motorcycles ever. 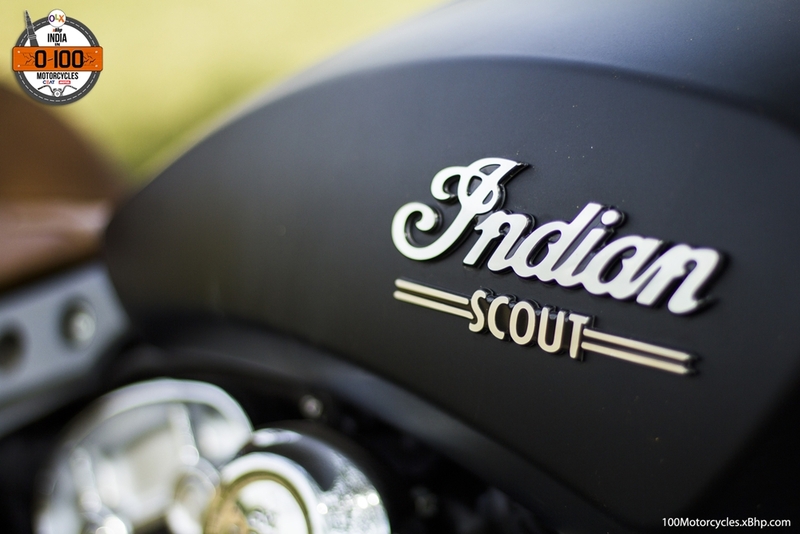 Scout is a cruiser which was introduced in 1920 and made till 1949. It was also briefly made between 2001 and 2003. 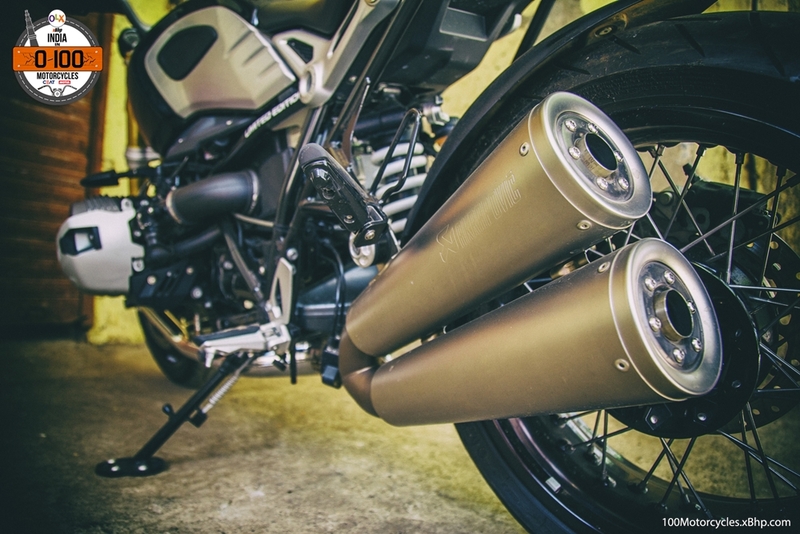 However, the glory that came to Indian was brought by the New Zealander Burt Munro who set three world speed records (in 1962, 1966 and 1967) at Bonneville Salt Lake Flats. One of the records is said to still stand as of today. He used a 1920 Scout (627th from the factory line to be precise) and modified it for 20 years in order to make it fast enough for setting speed records at Bonneville. 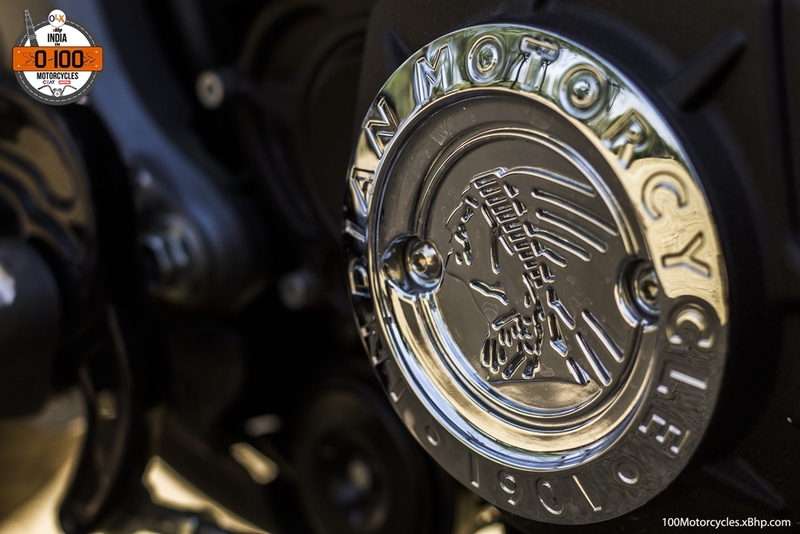 Indian Motorcycle Company was acquired by Polaris Industries in 2011 and since then, it has been one of the strongest comebacks by a company in the automotive industry. Everything Indian has launched since its revival has been successful. 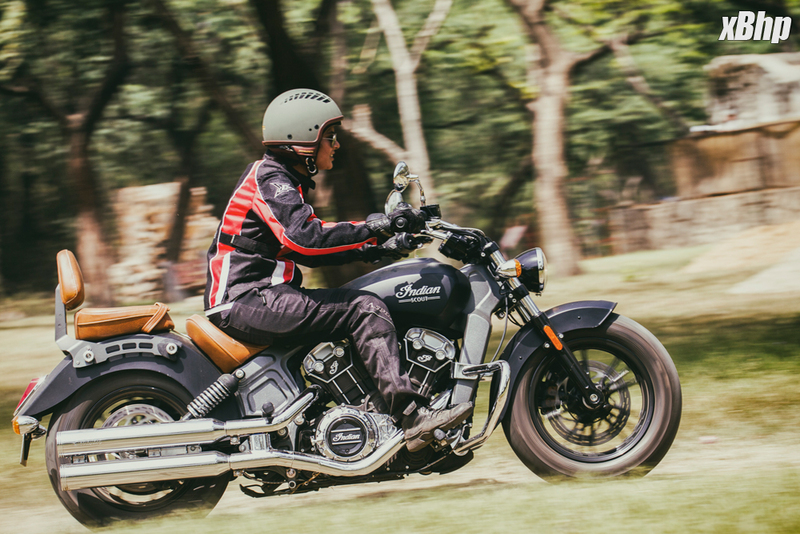 In 2015, Indian brought back the Scout with much anticipation and to the delight of motorcycle enthusiasts around the world. 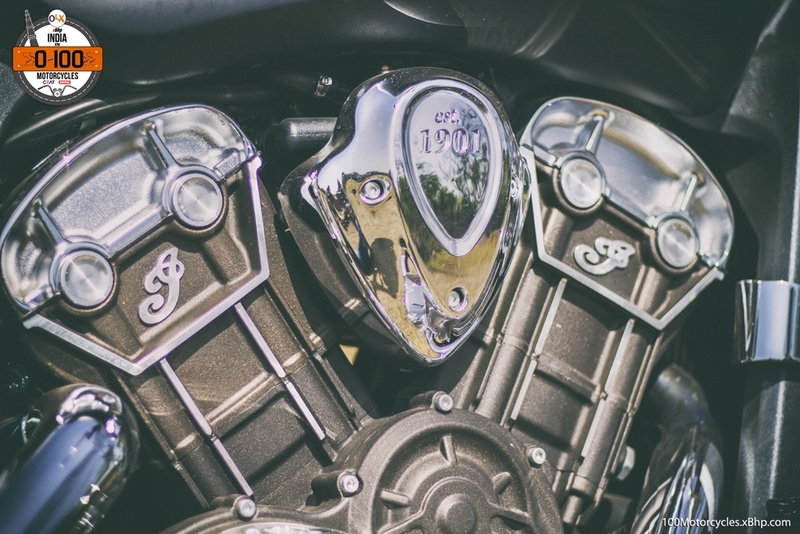 An all-new motorcycle, absolutely modern, with an 1130cc v-twin engine having the double overhead cam and 4 valves per cylinder. 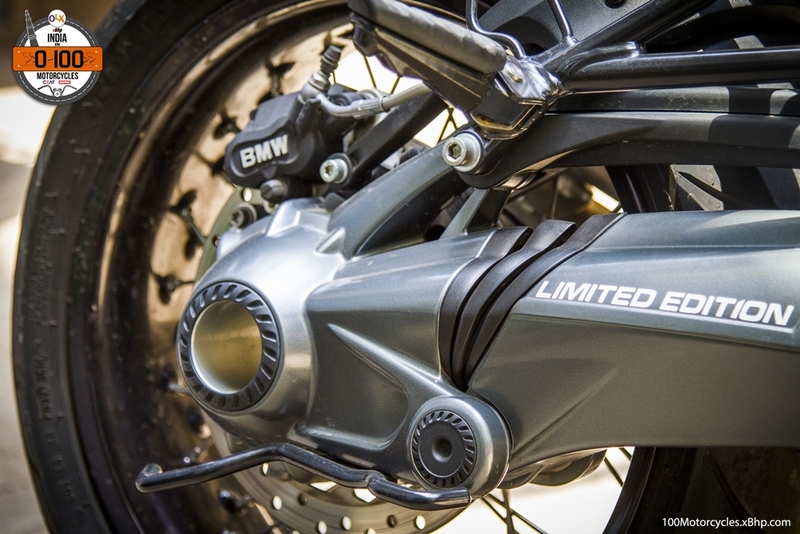 It is liquid-cooled as well and housed inside a revolutionary aluminium chassis. 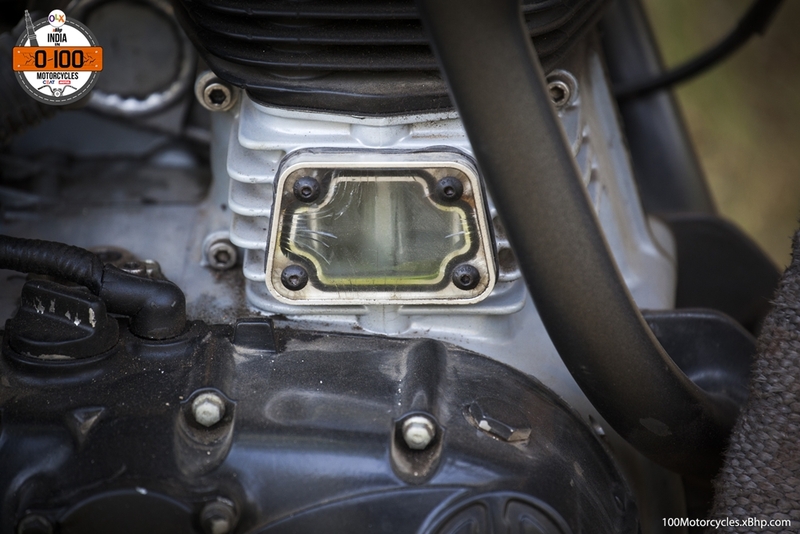 The motorcycle is small and compact and cleanly integrates the radiator housing at the front of the main frame. 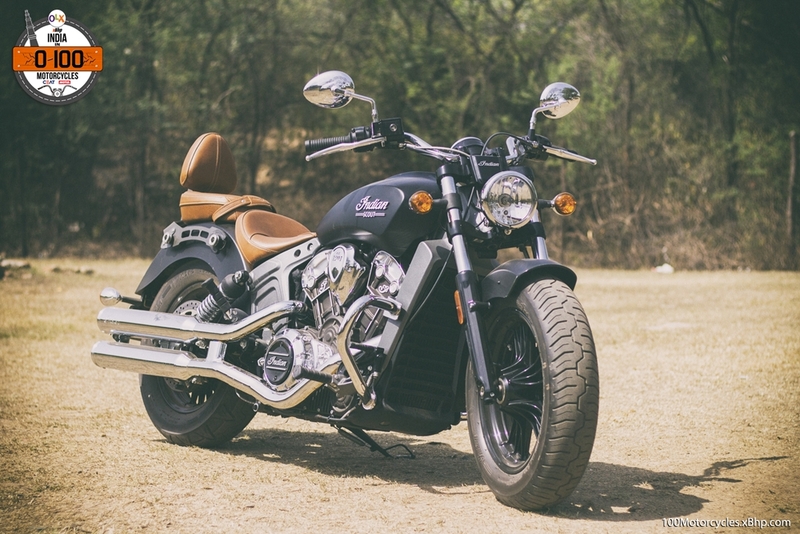 Scout has had a performance-oriented personality attached to it especially due to the speed records it made, and its latest incarnation is only better. 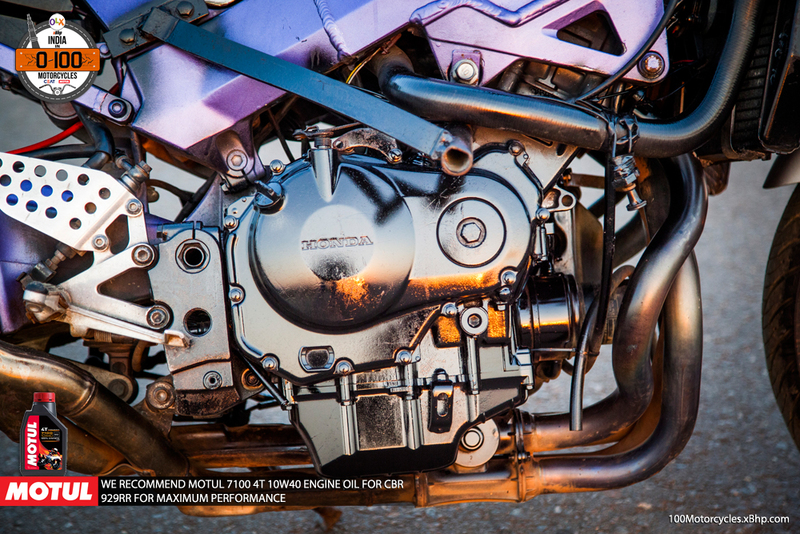 The motorcycle produces 100 horsepower (101 PS) from the 1130cc engine and 97.7 NM of torque at 5,900 RPM. It is fast and has decent lean angles of up to 31 degrees. Impressive for a motorcycle designed as a typical cruiser. 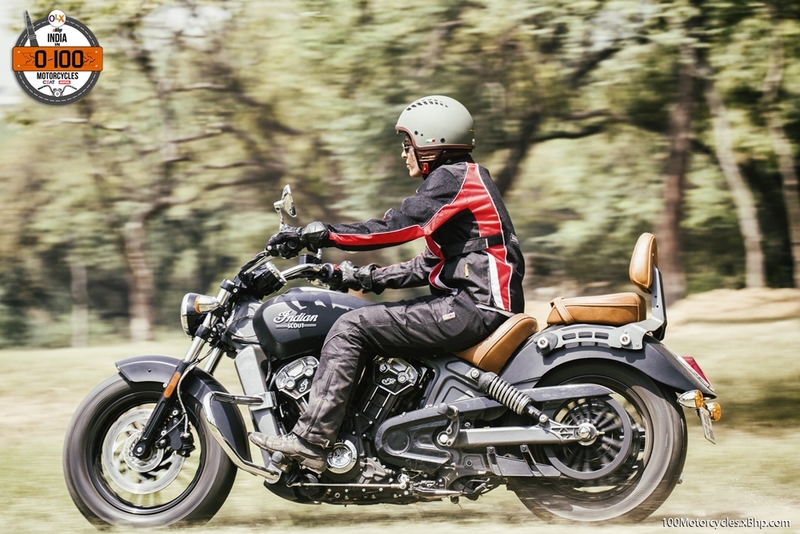 Recently, Indian has also launched the 999cc variant called the Scout Sixty. 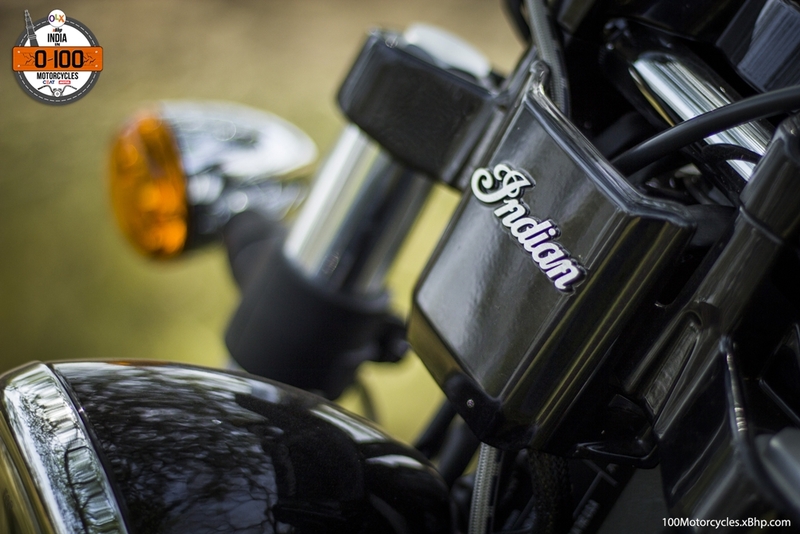 It is the most affordable motorcycle in Indian’s lineup. 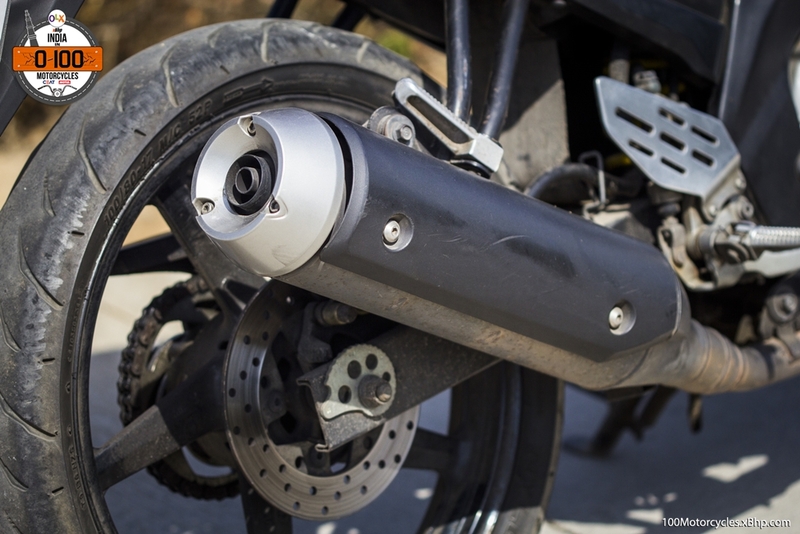 The market of second-hand motorcycles is thriving as well with more and more manufacturers coming in. 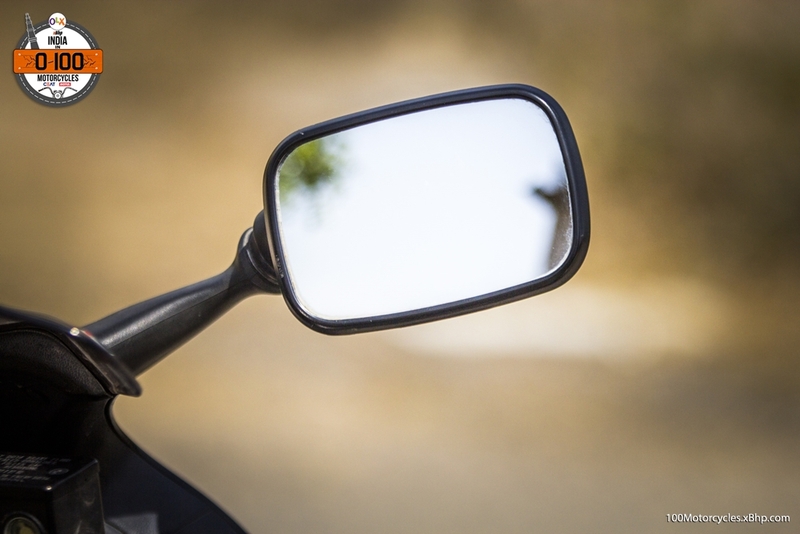 if you’re on the lookout for one then try OLX, and you might get lucky. 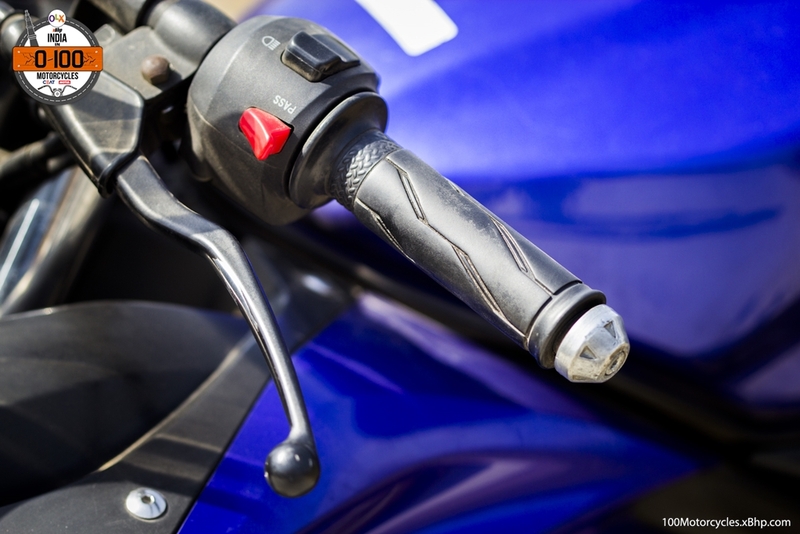 Buy a used Yamaha YZF-R15 from OLX. The YZF-R15 isn’t just Yamaha’s best affordable performance motorcycle in India (unless you want to give that title to YZF-R3 now), it is also a story in itself about Yamaha’s revival and the heroic comeback in the Indian market. 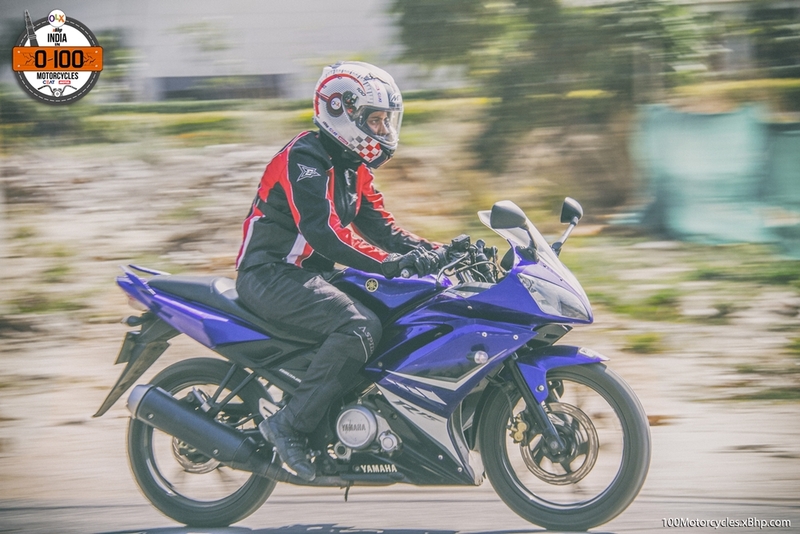 In the late 1990s and the early 2000s, when the 2-stroke motorcycles were slowly and surely being phased out of production, Yamaha India was struggling to keep up in the market especially against the unstoppable rise of the Hero Honda Splendor. Along with the partnership with Escorts, the Japanese giant did try to please the crowd with their cruiser-styled Enticer, 125cc motorcycle, but it didn’t nearly work for die-hard Yamaha fans and motorcycle enthusiasts in general. 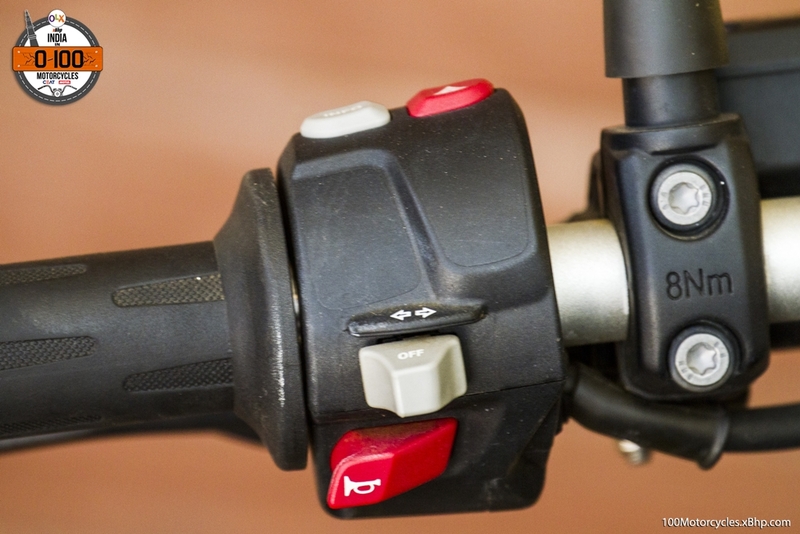 Their 100cc commuters like the Crux series was also only received with mediocre success. 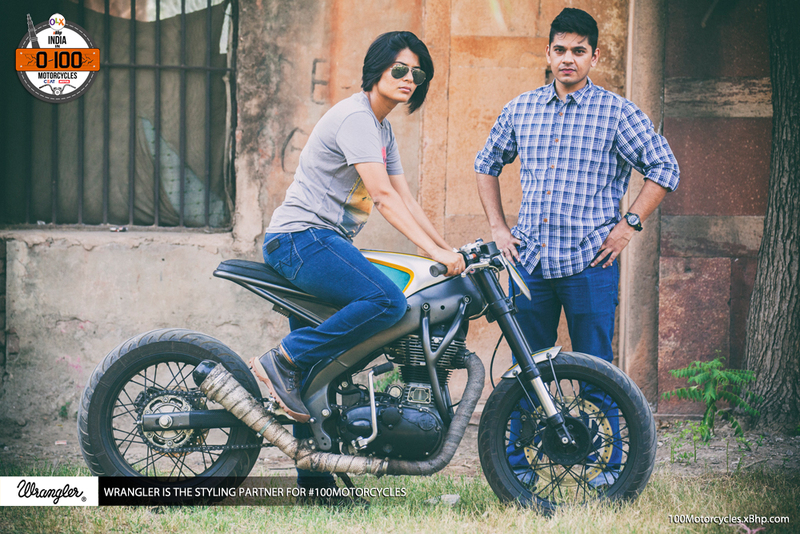 Riders wanted more, something truly performance oriented and with typical Yamaha genes and ideology. 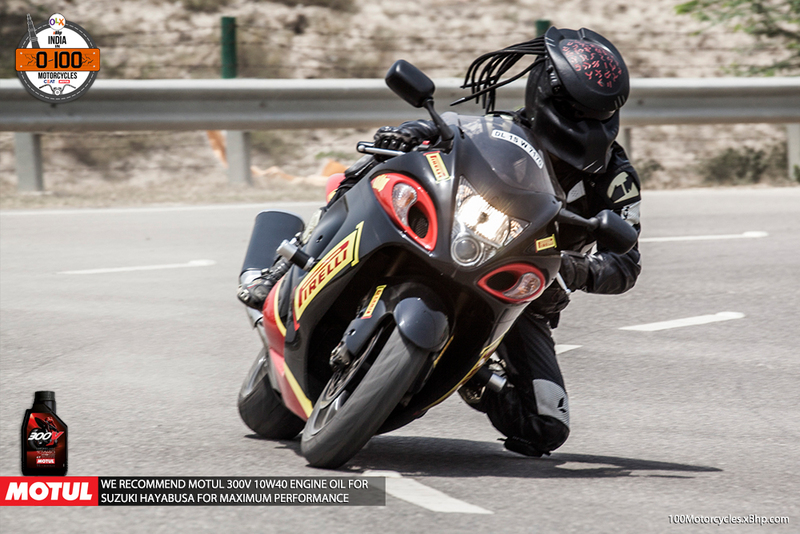 Yamaha is synonymous with performance after all. Things began to change in the second half of the decade 2000. 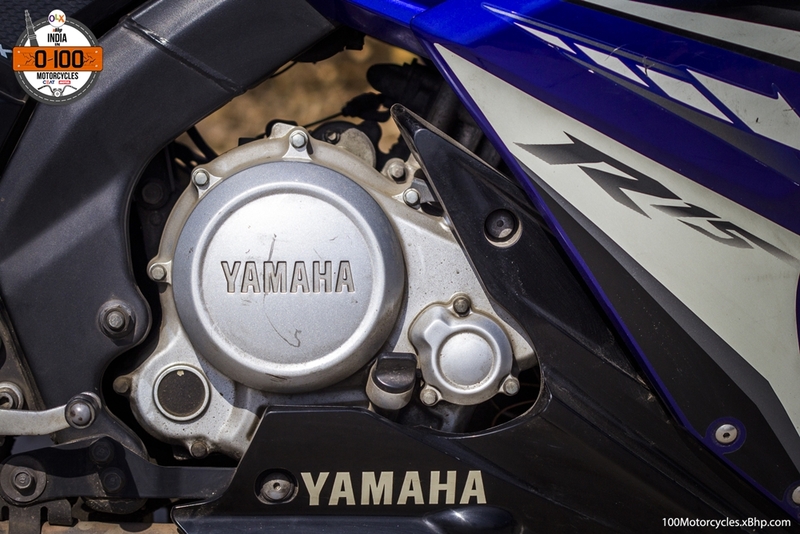 Realizing that their strategy till now wasn’t the right way to go, the company took things into its own hands and started working on completely rebuilding the Yamaha brand. They didn’t just need a competitive product, but also something truly revolutionary and game changing. Why? 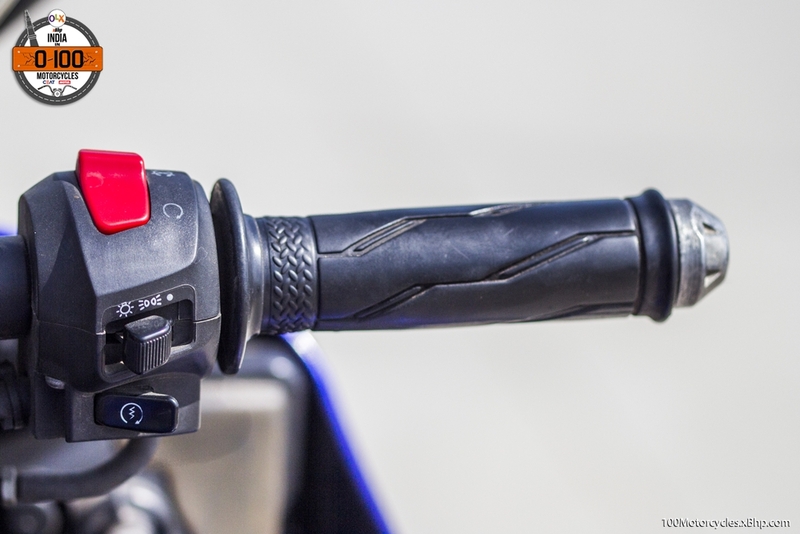 Because it’s Yamaha and we always have huge expectations from bike makers like these. Secondly, it became quite clear that trying to beat HH Splendor was going to be of no use other than wasting resources. 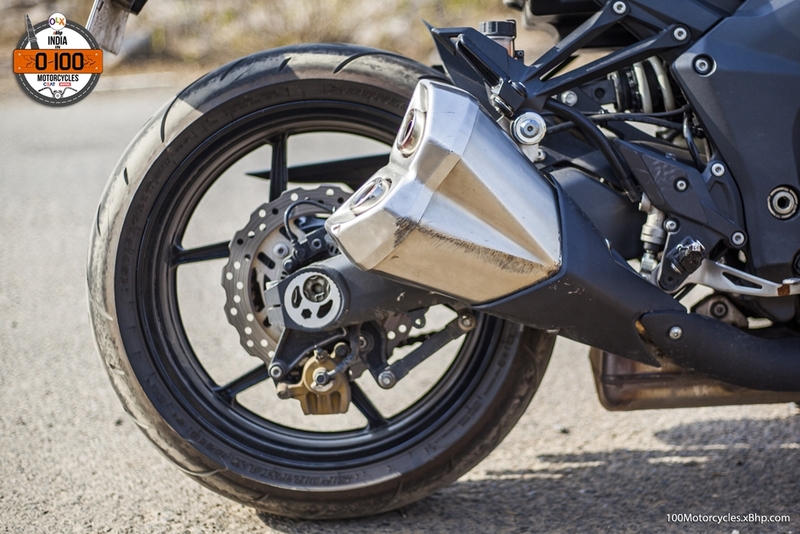 So, Yamaha did what we really didn’t think it would until they made their intentions clear and that several spy shots of their certain full-faired sportbike started to appear online. 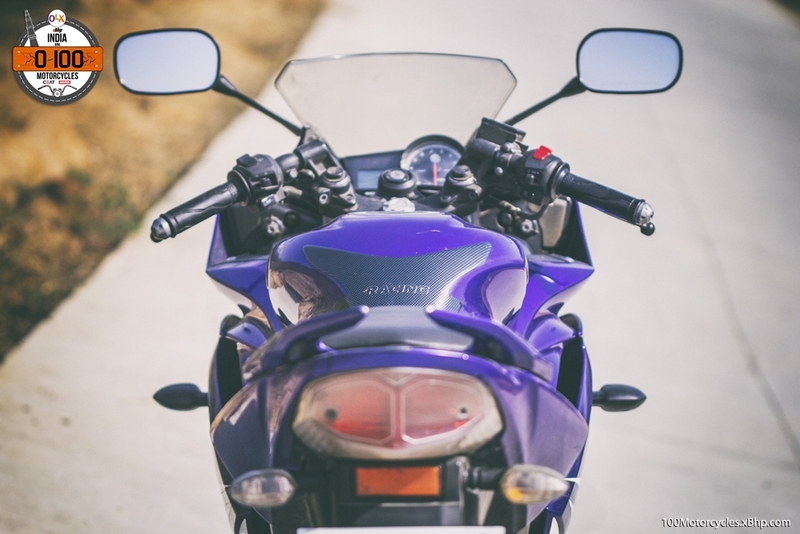 Yamaha launched their first proper 150cc sportbike, YZF-R15, in 2008 and changed the dynamics of the market forever. 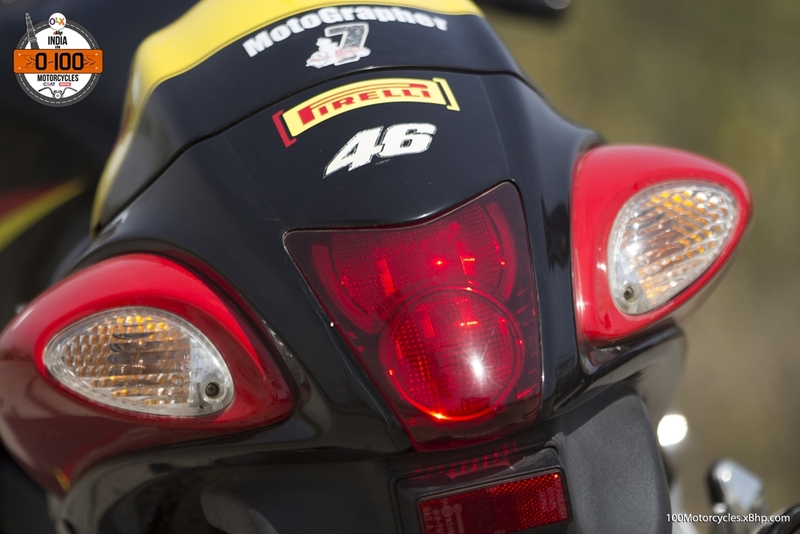 In fact, the R15 was the first proper sportbike up to 200cc category. 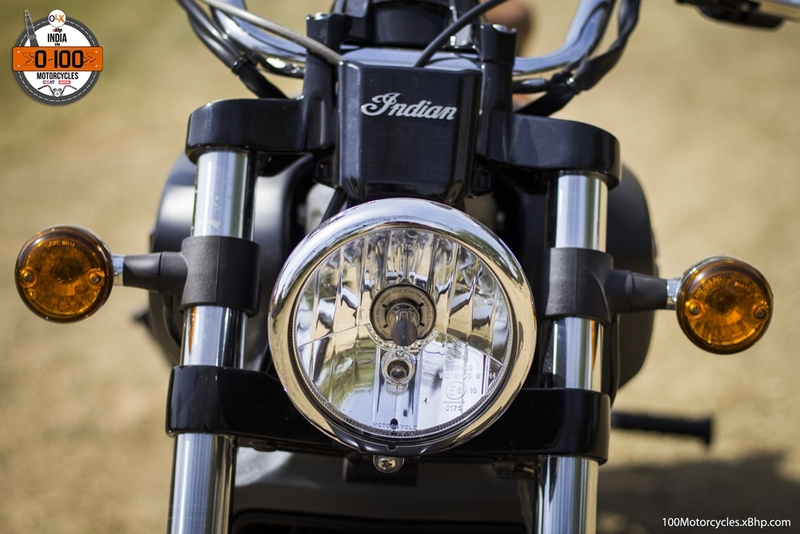 If the HH CBZ instilled a feeling of sportiness in the modern 4-stroke era in the Indian motorcycle industry, the R15 made it real. 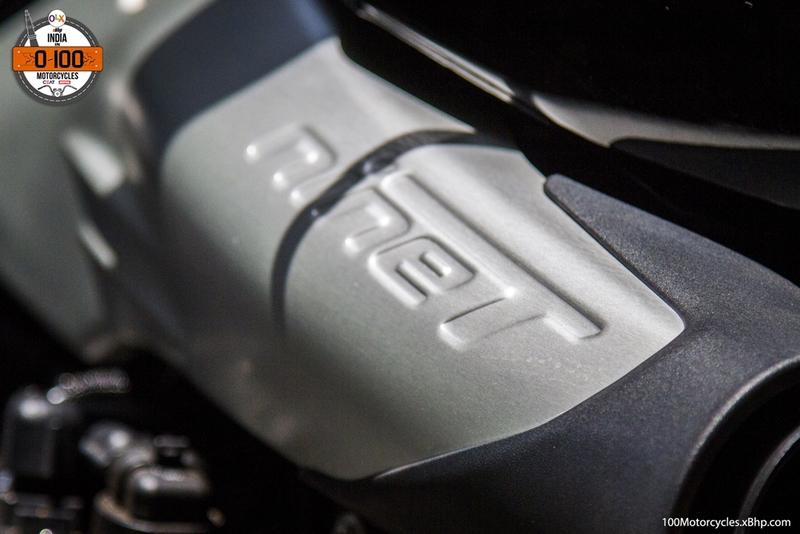 Everything about the YZF-R15 is about performance. 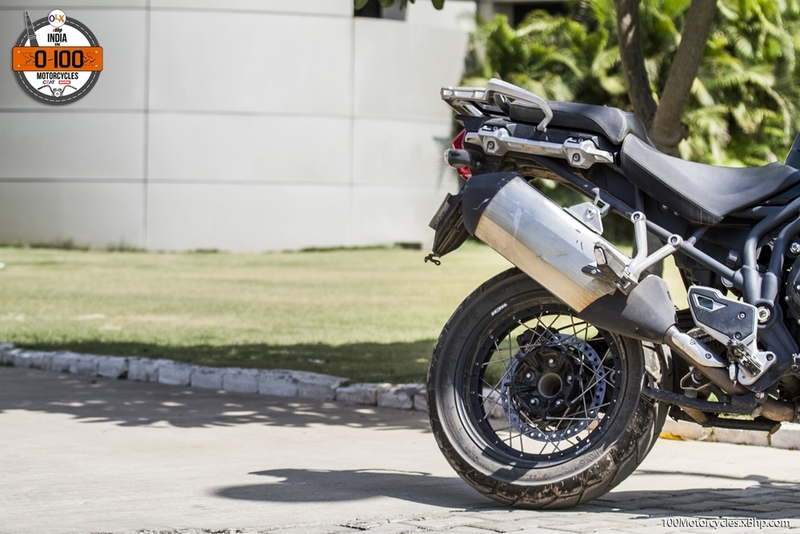 From the first-in-class liquid cooled engine to the delta-box chassis and the link-type mono-suspension at the back, the R15 has been designed to churn out the best performance from its 150cc mill. 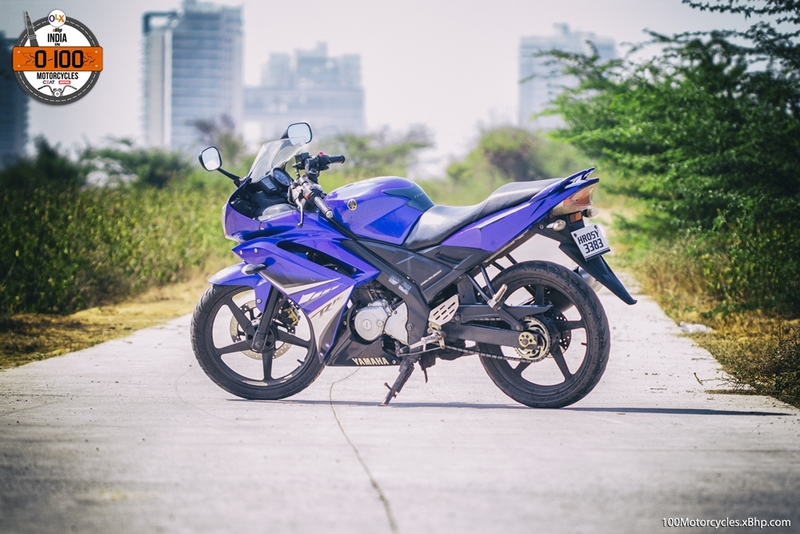 The R15 is a revolutionary motorcycle in India. 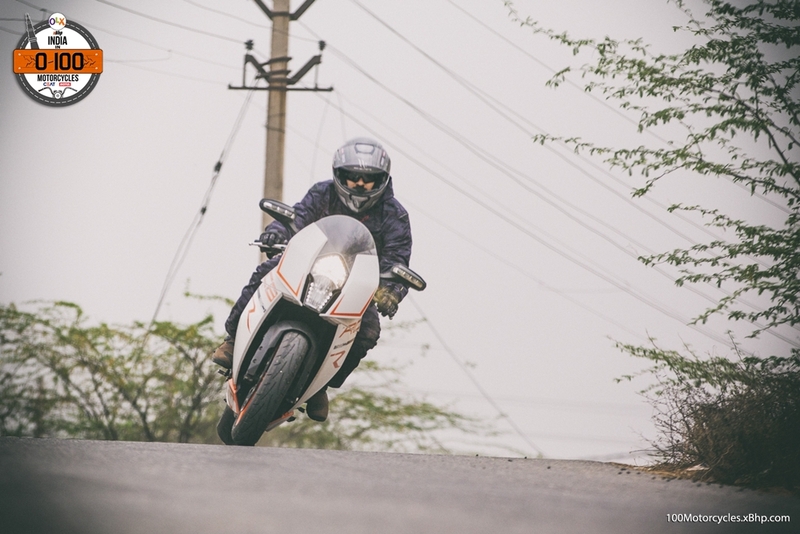 When most of us were going ga-ga over the likes of Karizma and Pulsars, Yamaha showed what a real performance motorcycle should look and ride like. They showed that you need not have a big motorcycle to have fun. 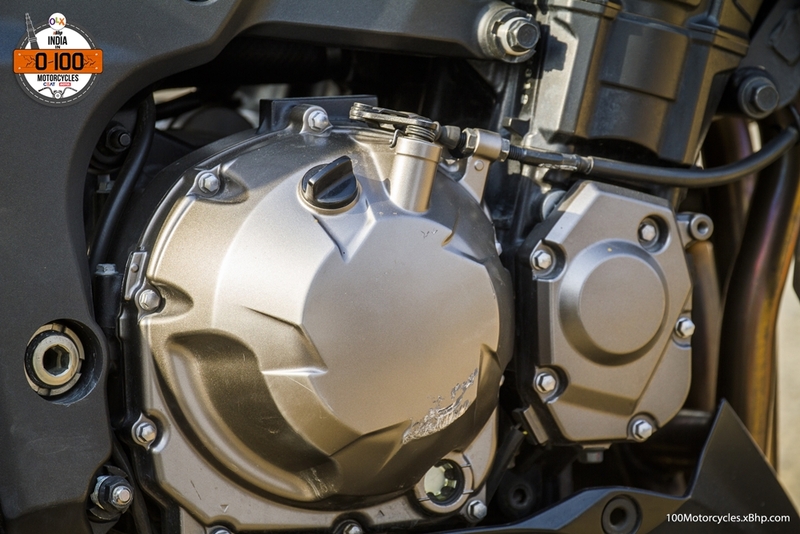 A liquid-cooled 149cc engine with forged pistons and diaSIL cylinder brought world-class technology closer to more people in India for the first time. But that was only the beginning – fuel injection, delta box frame, full-faired aerodynamic bodywork, swing-arm with link-type mono-suspension at the back, ensured that the R15 went better than anything up to 200cc category when it was launched. 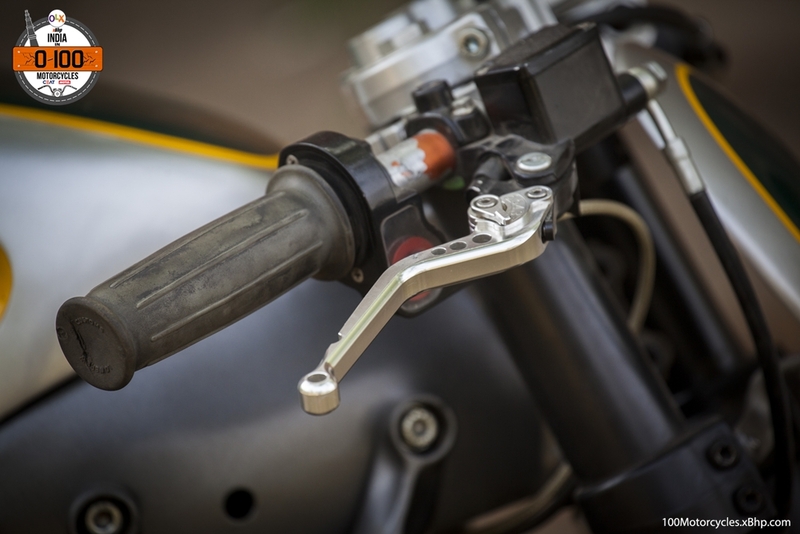 It is, to this day, one of the best handling motorcycles in the country. 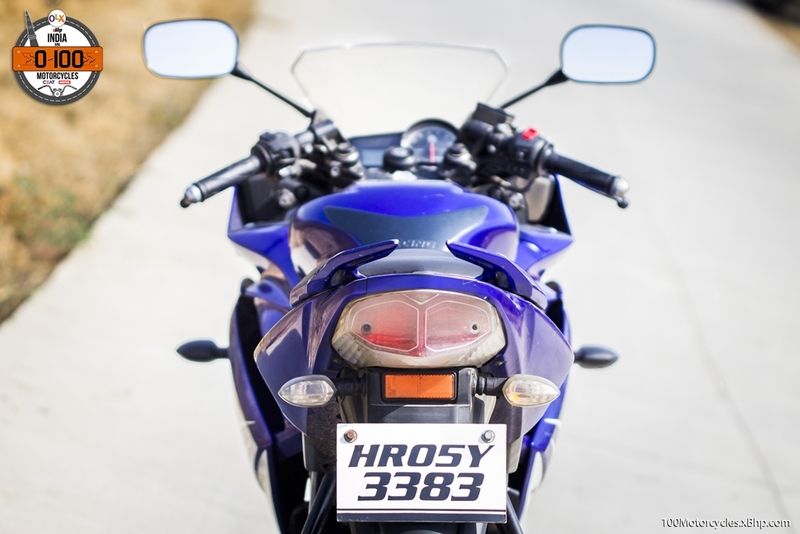 But performance aside, it was the point Yamaha made with the introduction of the R15. 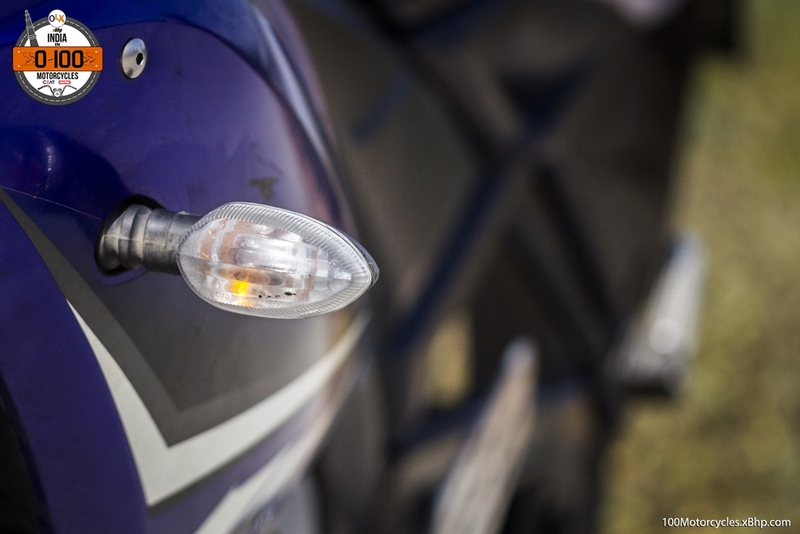 Retailing at over a lakh rupee on-road in Delhi, the R15 broke all traditions existing in the 150cc segment. 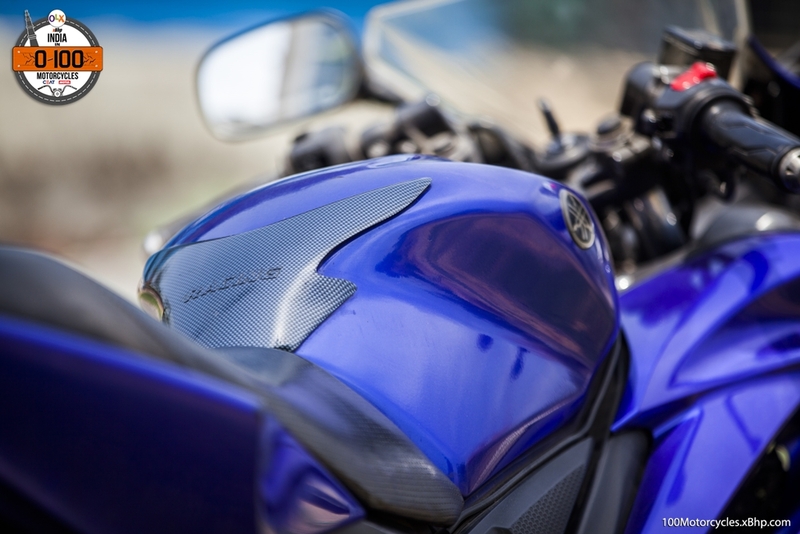 Yamaha made India ready for purpose built sportbikes in a small capacity segment. 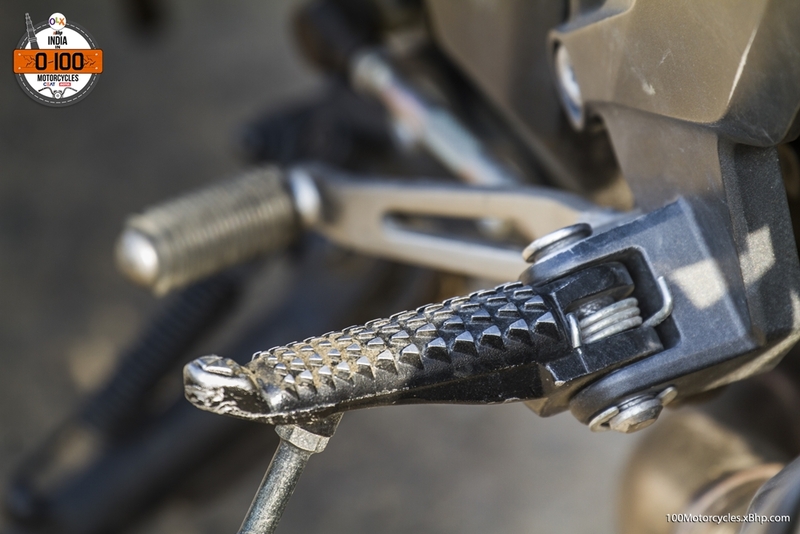 People began to realize that it is worth spending that much money on a small capacity motorcycle. No wonder the motorcycle sold like hot cakes. 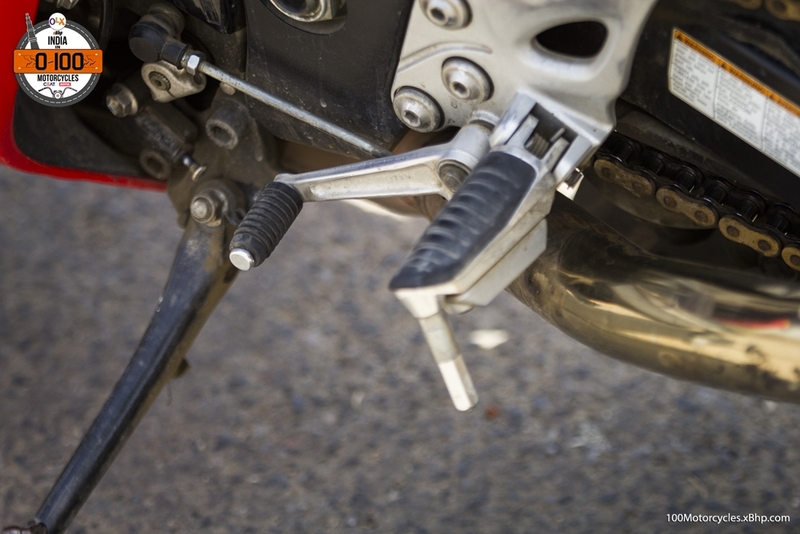 Enthusiasts around the country found a perfect tool to genuinely learn about sportbike riding on a genuine sportbike without burning holes in their pockets. 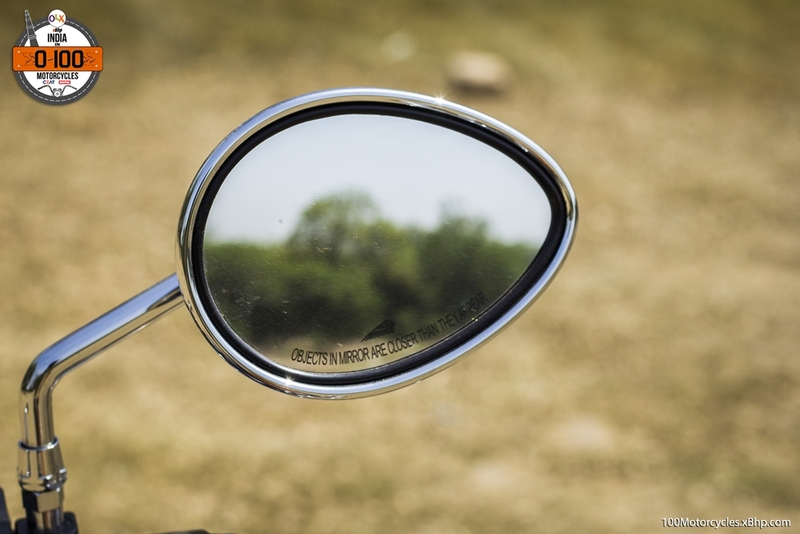 The motorcycle went around corners like no other motorcycle made in India. 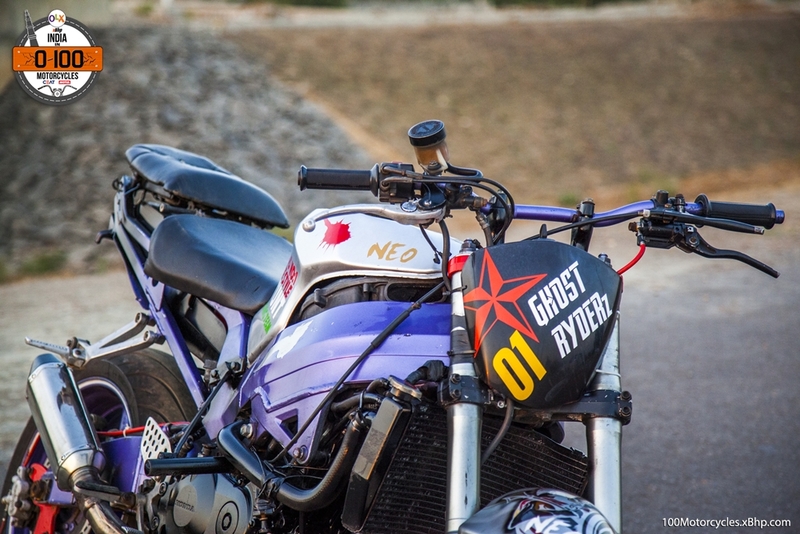 People were reminded of Yamaha’s racing heritage and their inclination towards total performance. 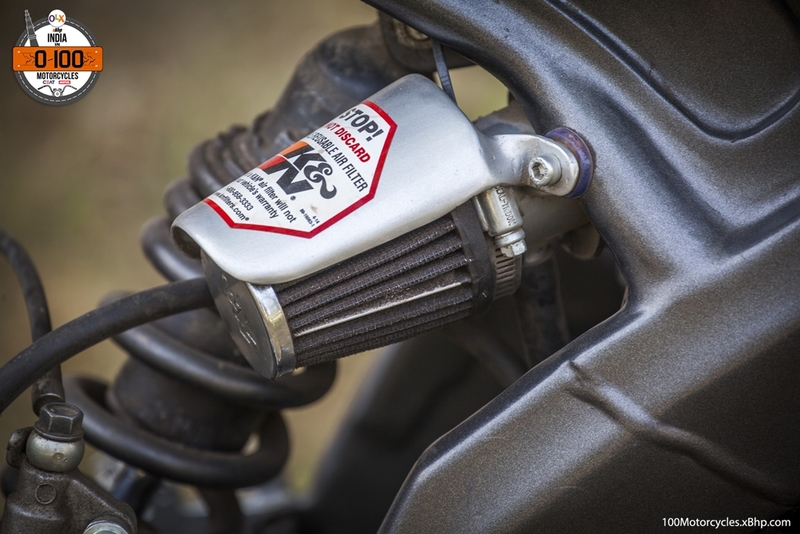 However, the R15’s only downside with respect to performance was its poor low-end torque. 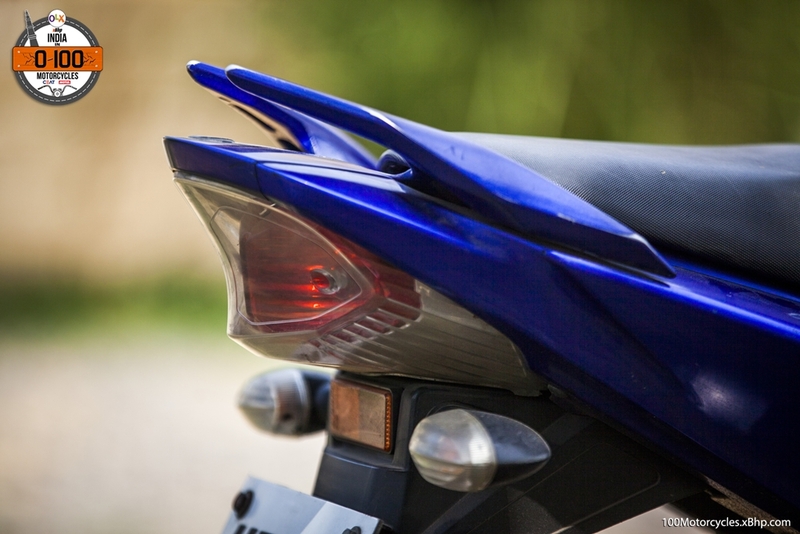 To fix this, Yamaha launched the YZF-R15 version 2.0 in 2011 with re-tuned ECU (Engine Control Unit) which increased the torque to up to 15 NM while the original engine specification and power remained same at 149cc and 17 PS. But version 2.0 was quite heavily revised in other areas as well. 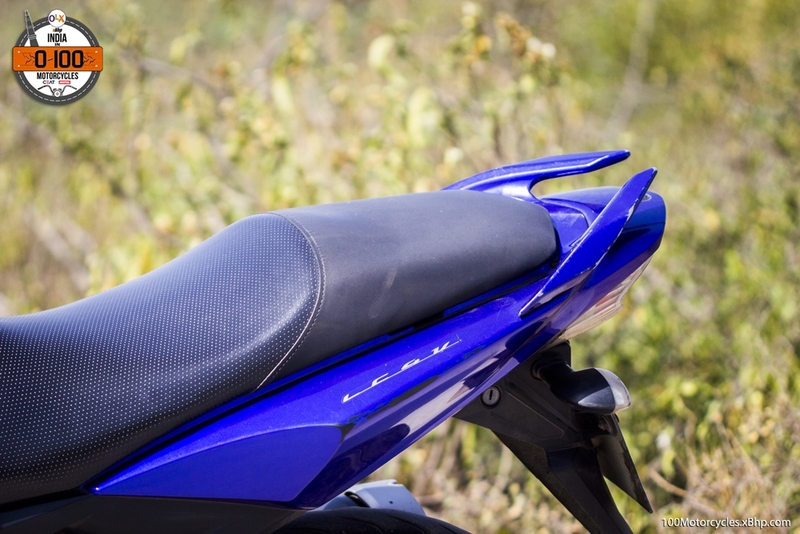 The whole middle and rear section was redesigned with split seat and raised tail section to make the motorcycle look like the proper miniature version of the YZF-R6 Supersport. 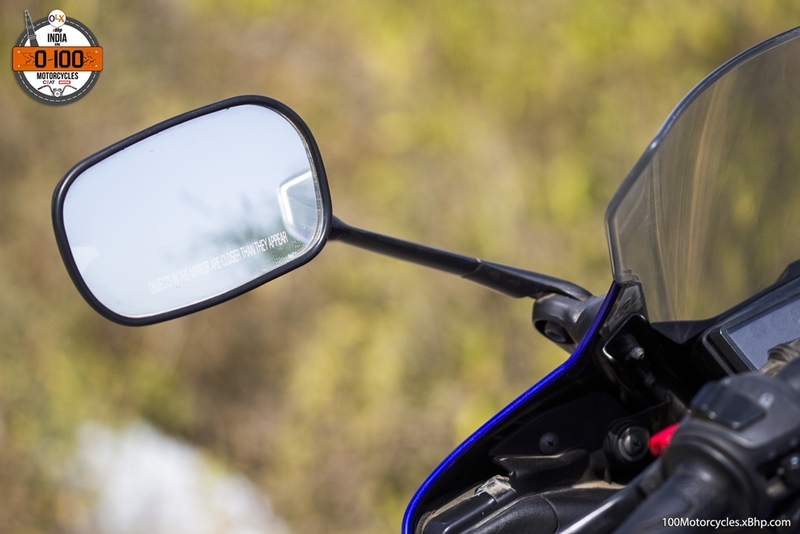 The rectangular steel swing-arm from the original R15 was replaced by the longer aluminium swing-arm which is said to be taken from the YZF-R125 which Yamaha sells in Europe. 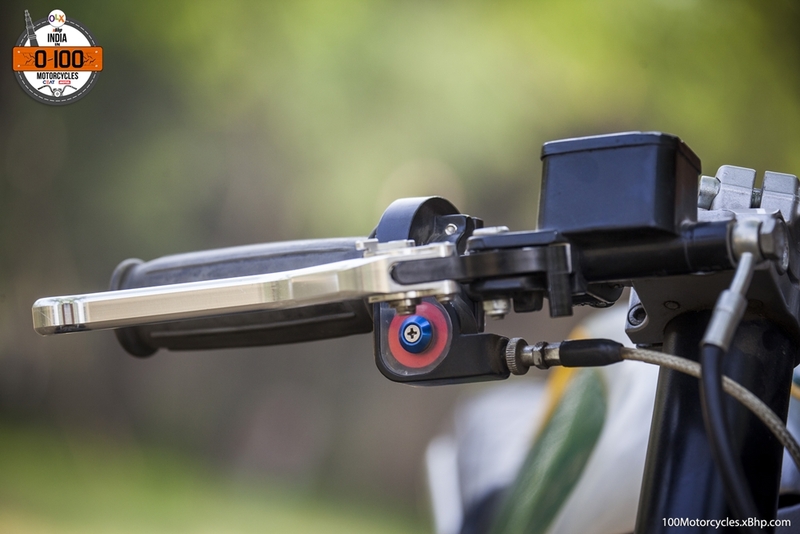 The longer swing-arm took some flick-ability away while making the bike more stable at all speeds. 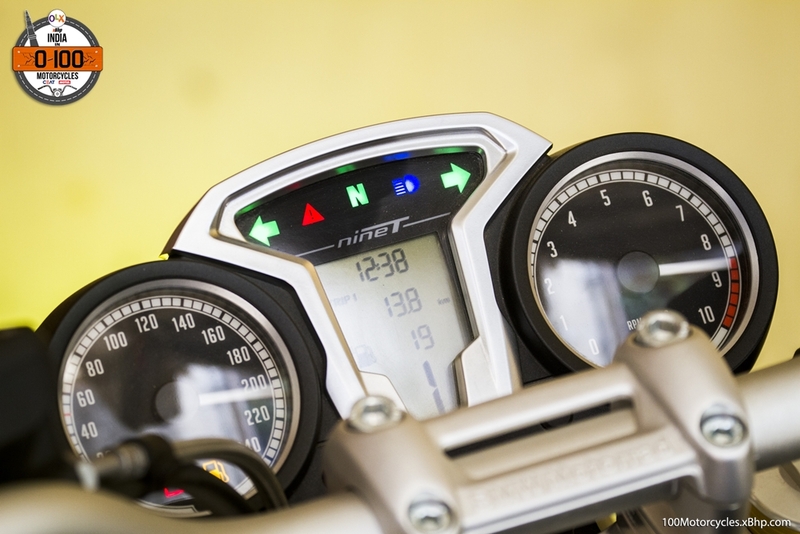 This combined with better acceleration response from low and mid-range RPMs, the R15 became an overall better motorcycle to ride. But we Indians are interesting enough, we do not accept non-contemporary designs easily. 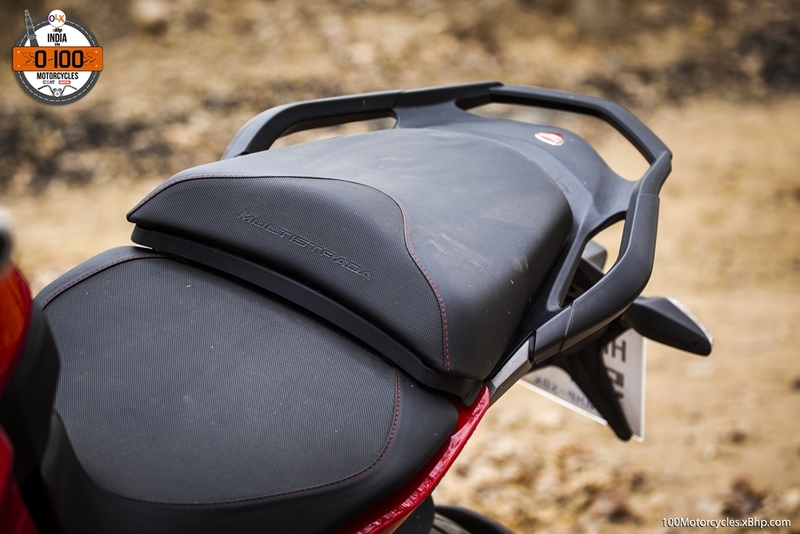 The rear seat on version 2.0 was quite impractical for a person to sit on like on most full-faired sportbikes. 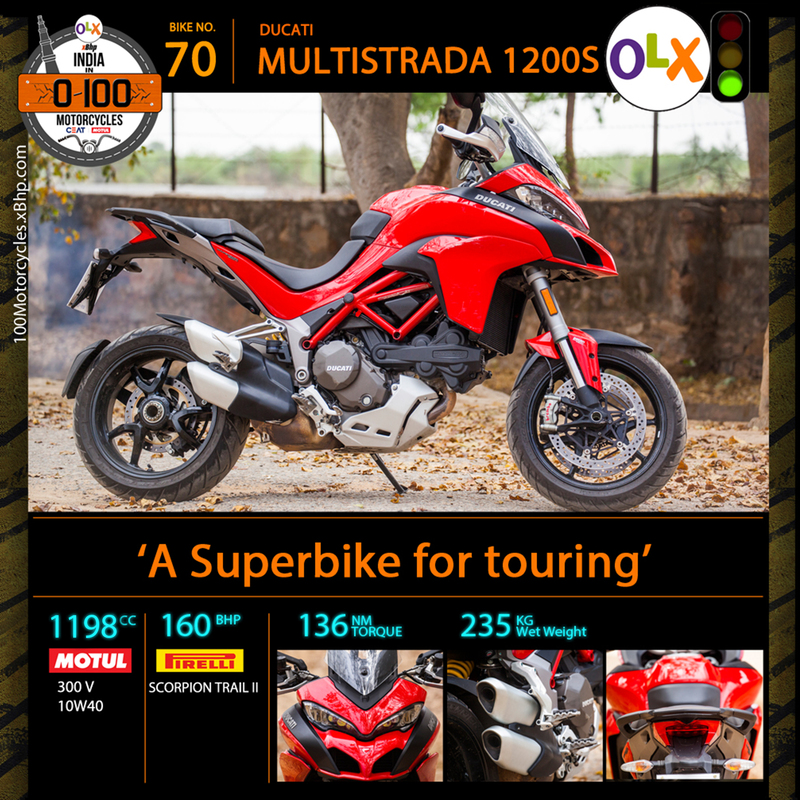 So much so that it started affecting the bike’s sales. 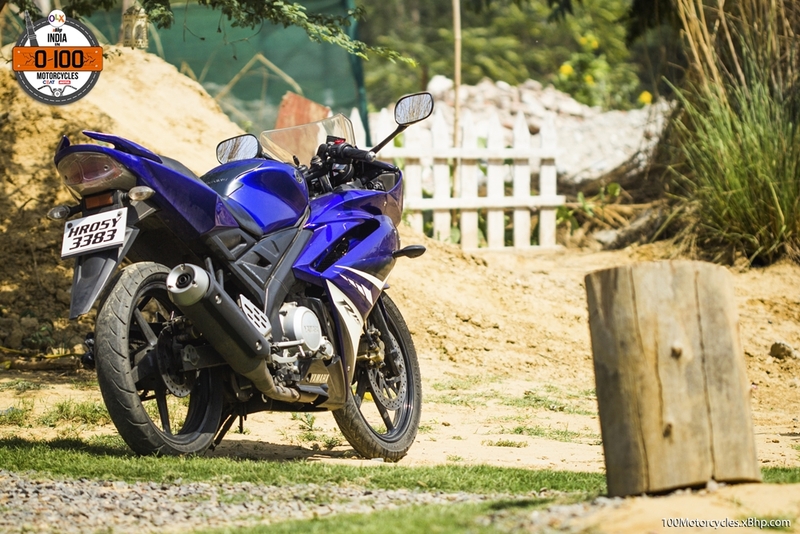 Hence, in came the YZF-R15S which is a nice mix of the version 2.0 and the original R15. 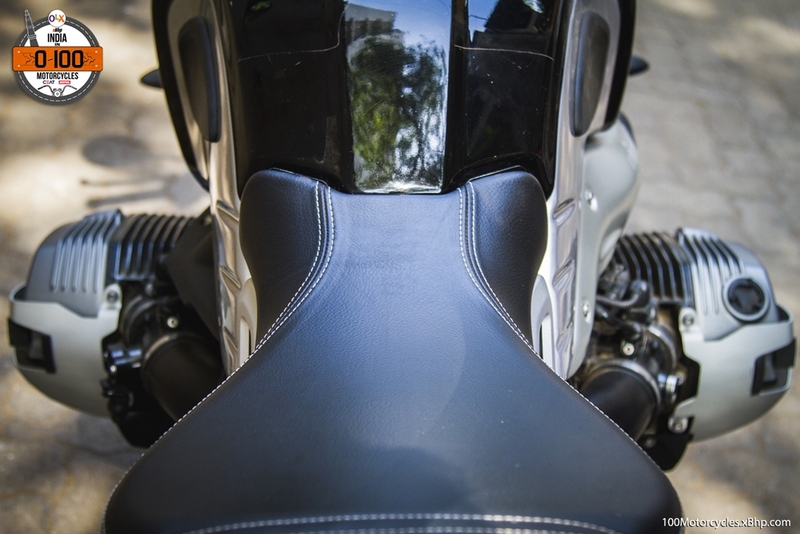 While the swing-arm and engine improvements are the same as the version 2.0, the seat and the tail section is from the version 1. 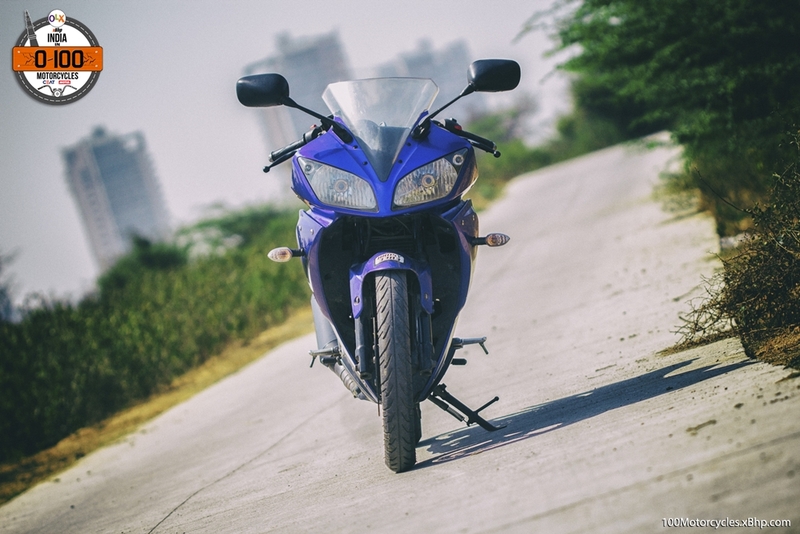 The YZF-R15 single-handedly changed the fortunes of Yamaha in India towards the end of the 2000s. 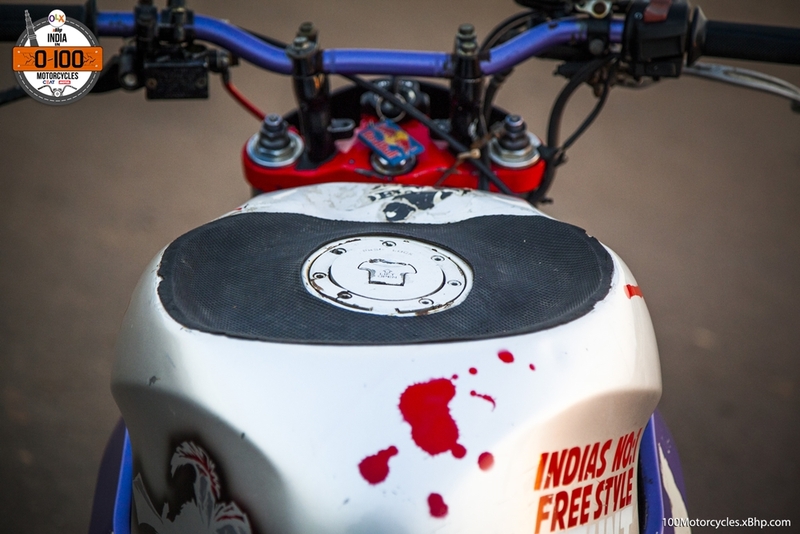 It brought Yamaha right back into the game and put up an unmatchable challenge for the competitors. 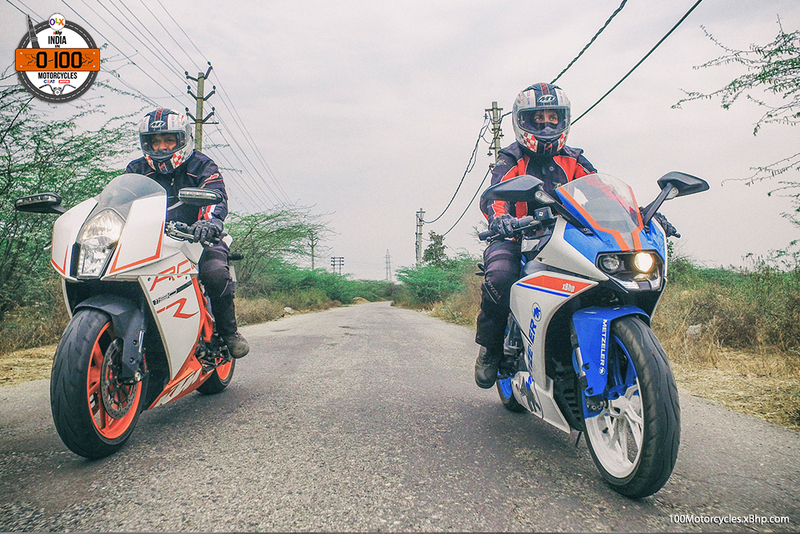 Clearly, someone with similar racing history and experience could produce a worthy opponent and it was Honda with their CBR150R. 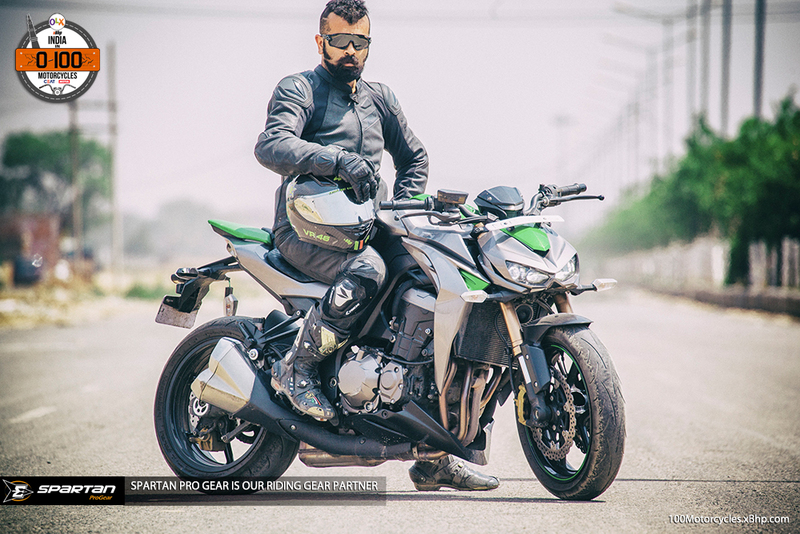 Since the days of the first R15, Yamaha has been thriving in the Indian market, although, that has a lot to do with the success of the FZ-16 lineup as well. 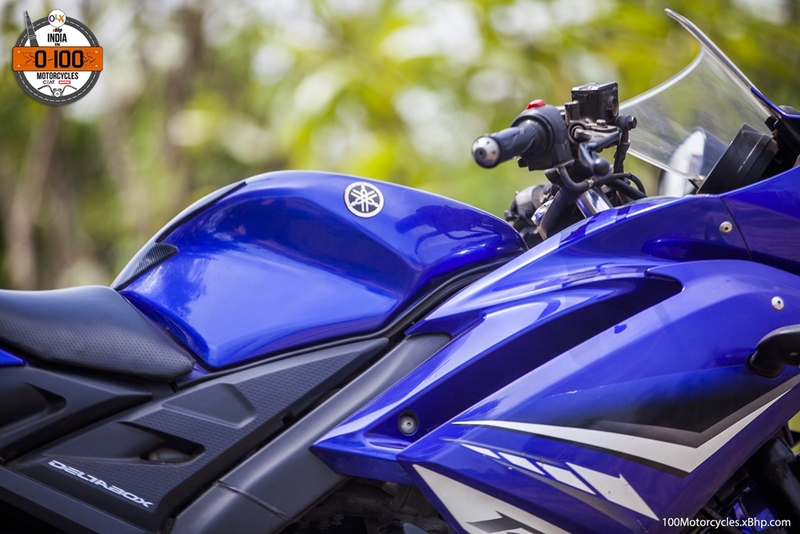 But the credit must go the YZF-R15 because it was a brave move by Yamaha to launch a motorcycle which was not meant for the masses and so the company risked sales in favour of exclusivity. And boy did it work for Yamaha and how! 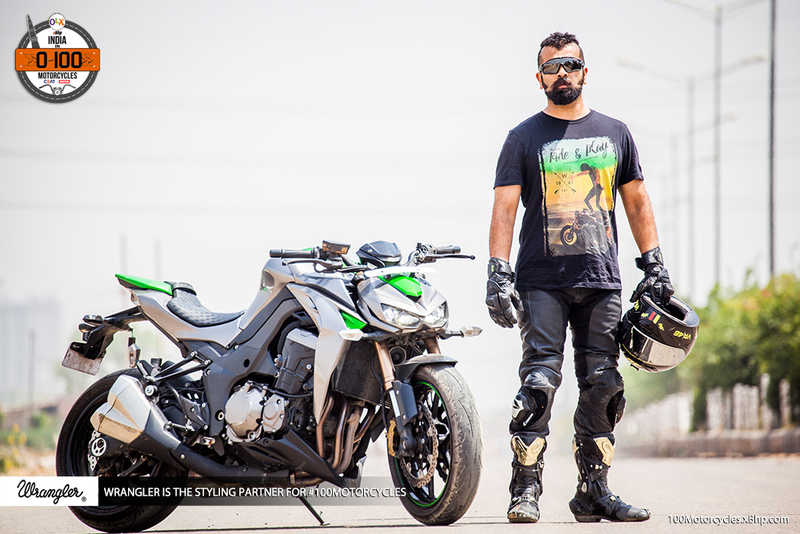 We would like to thank Mr. Abhishek Arora for letting us spend some valuable time with his version 1 YZF-R15. It served as a perfect reminder as to how Yamaha did it. And while you can find a touch version 1 in the R15S, you can still find the original one on OLX. 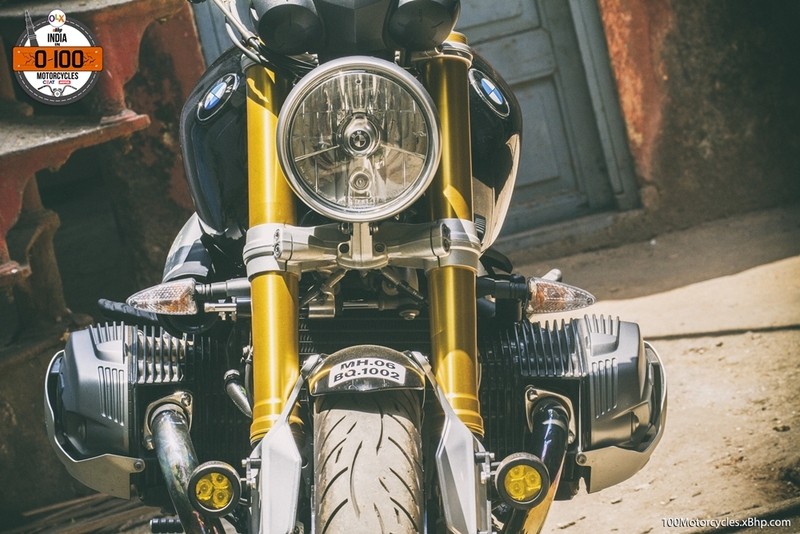 Need cash to buy BMW R nineT? 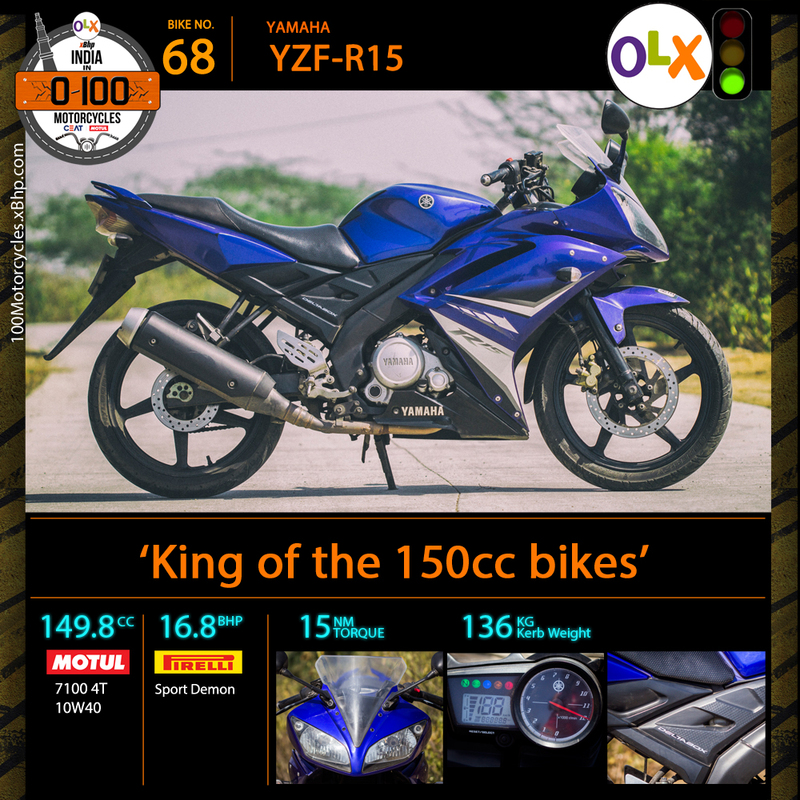 Sell your old bike on OLX. 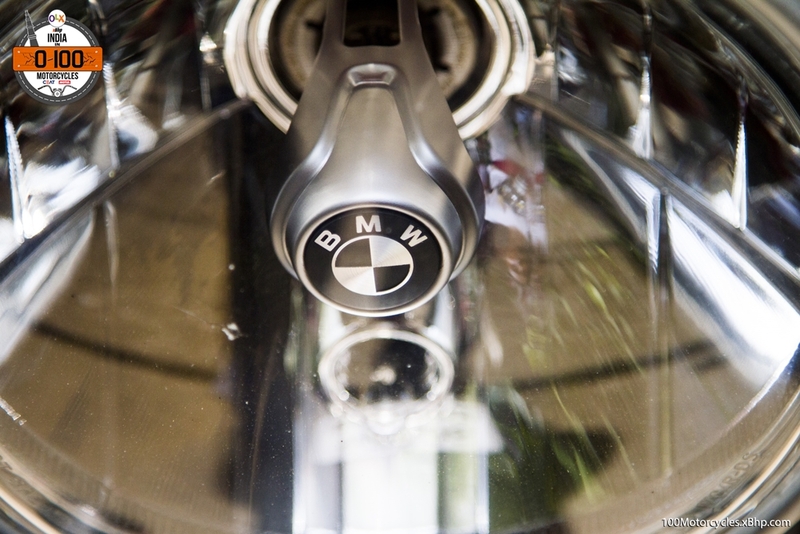 BMW is a prominent and one of the mainstream automobile manufacturers in the world. 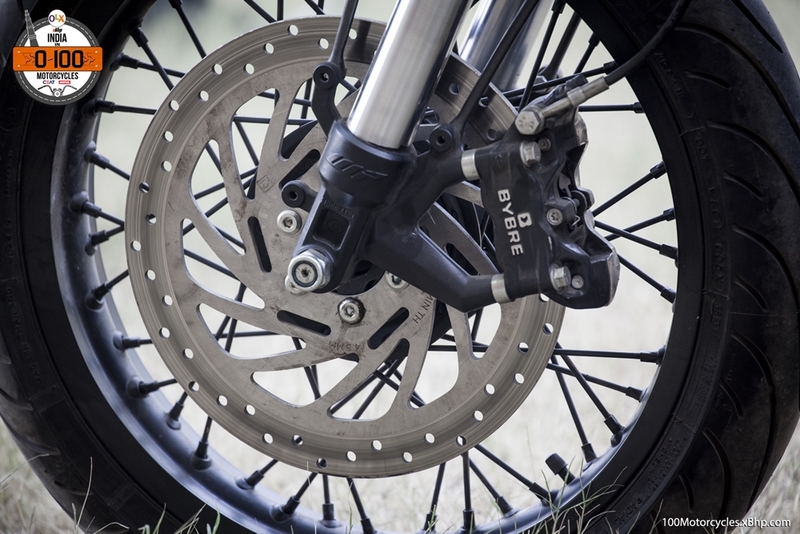 Yet, they are known to do things differently especially when it comes to motorcycles. Falling short on cash? 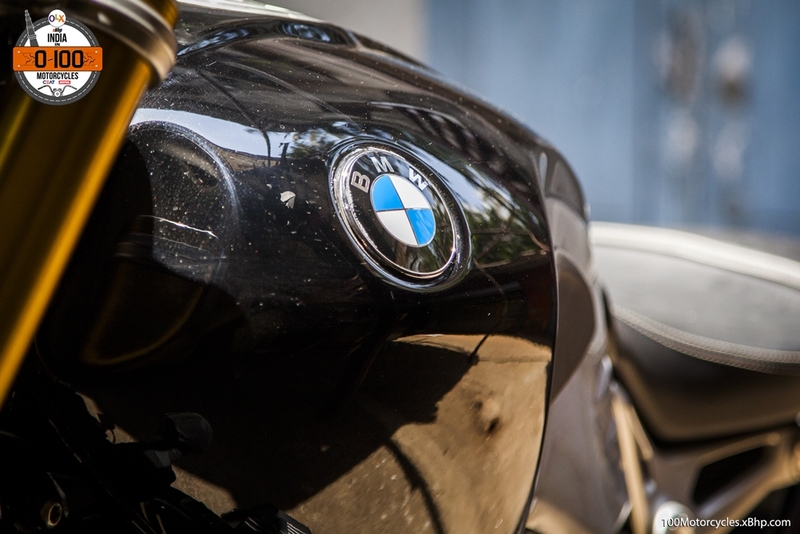 Find your favorite BMW Motorcycle listed on OLX. 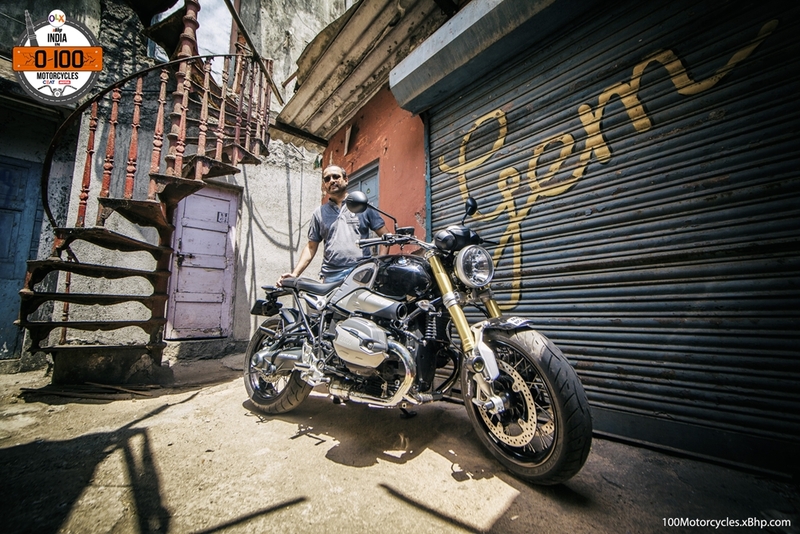 Having one of the widest product ranges among all bike makers, BMW Motorrad caters to all segments barring only a few (example cruisers). 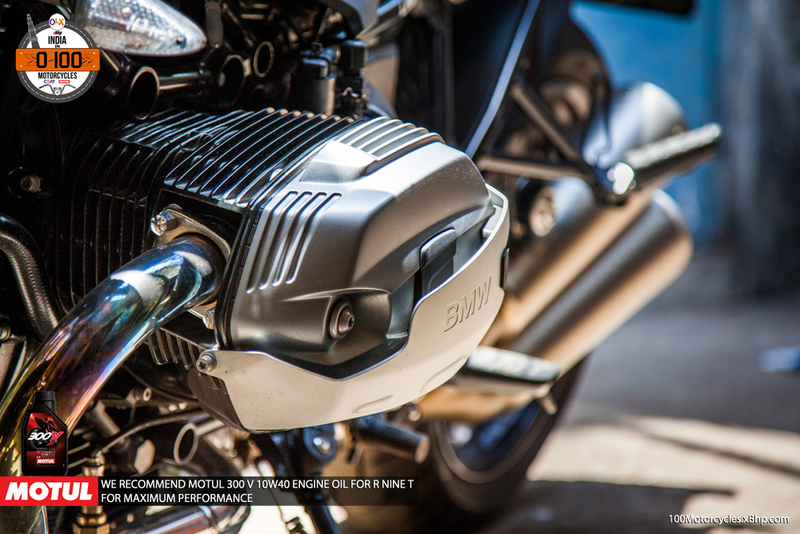 The uniqueness in their motorcycles lies with the boxer-twin engines which is one of the longest running engine architectures that we have ever seen. No doubt it is a testament to its reliability. 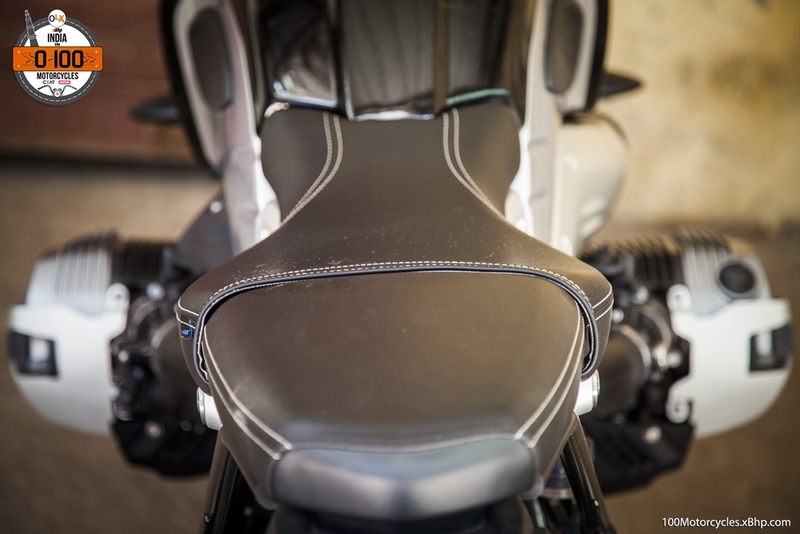 The boxer-twin is also extremely flexible in the sense that BMW has used it in a variety of motorcycles like streetfighters, faired sportbikes, tourers and even cruisers (R1200C, 1997 – 2004). 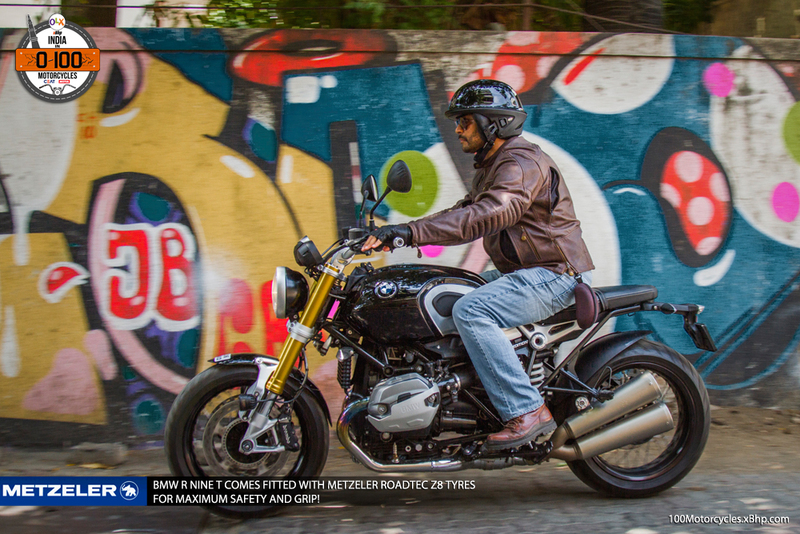 Now, BMW has further expanded the user of this engine in a modern-classic, R nineT, which they launched in 2014. Looks are quite interesting as well. 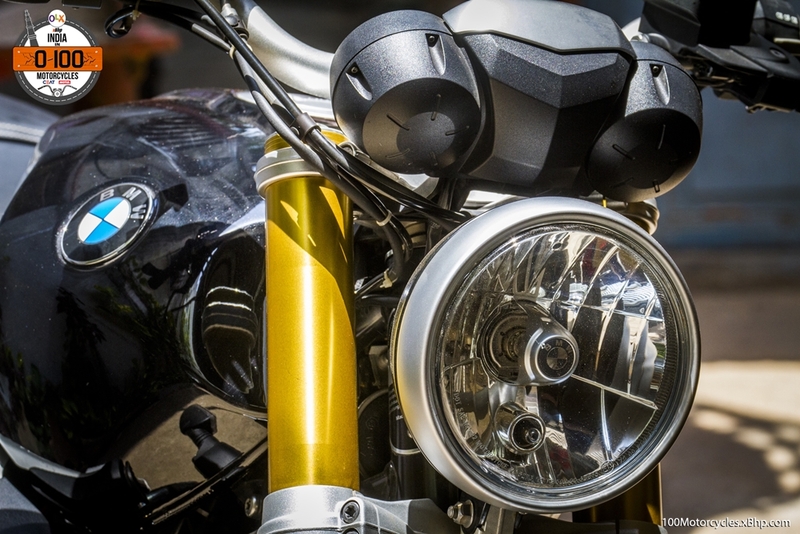 From the front, it looks like a typical standard with a round headlight and wide single-piece handlebar but there are upside-down forks with a pair of 320 mm discs that add to the sportiness and performance oriented approach. 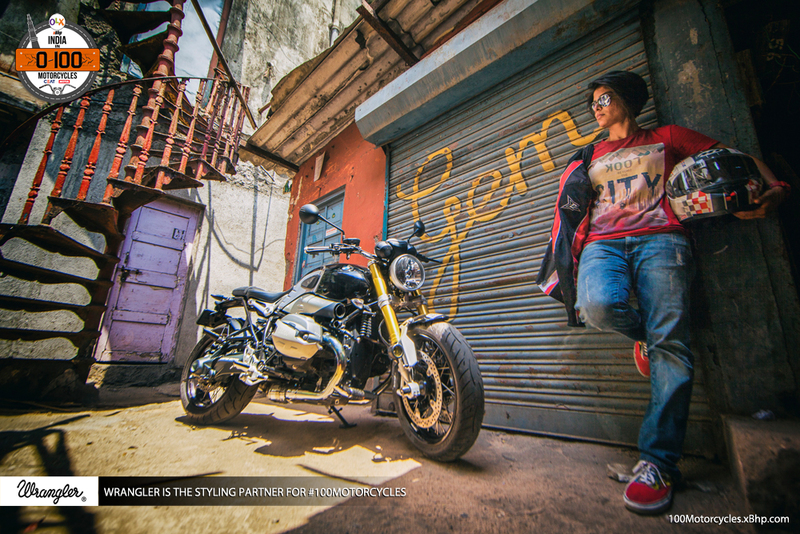 From there on, right to the tail section, the Beemer has certain unique elements to it. 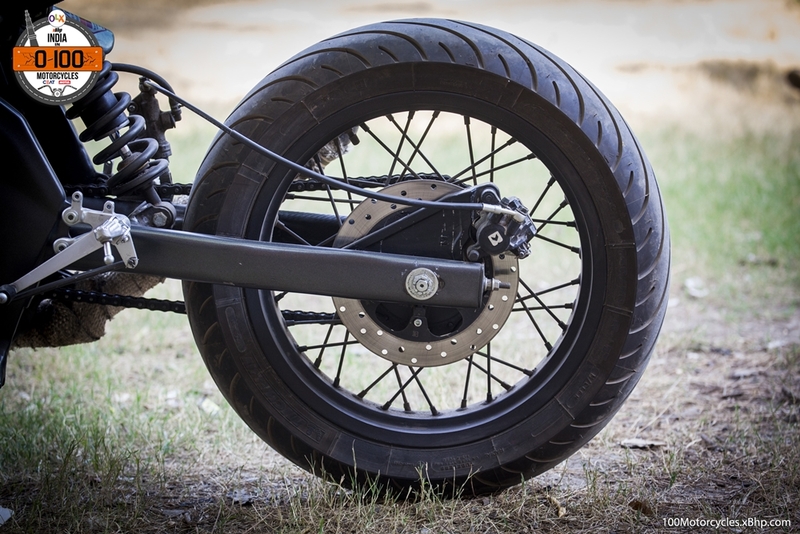 The power to the rear wheel is transferred via a shaft drive and the whole middle to the rear part is without any bodywork. 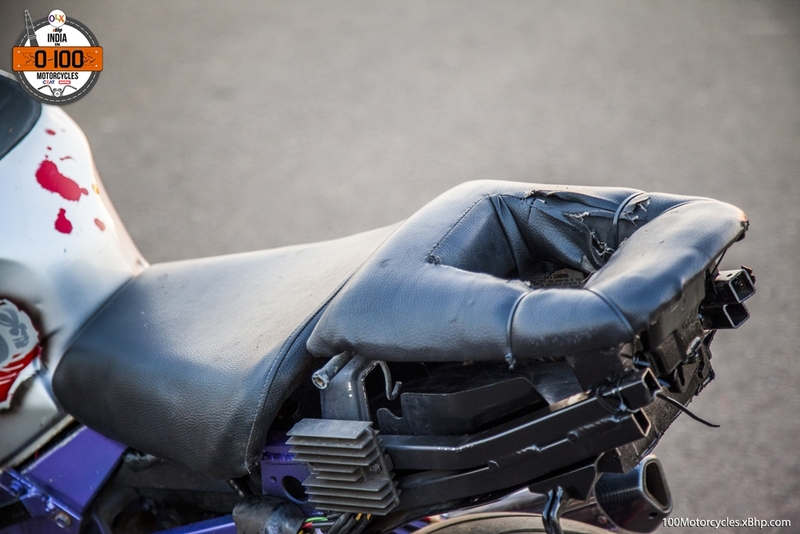 In fact, whatever bodywork is there are the fuel tank and its extensions. 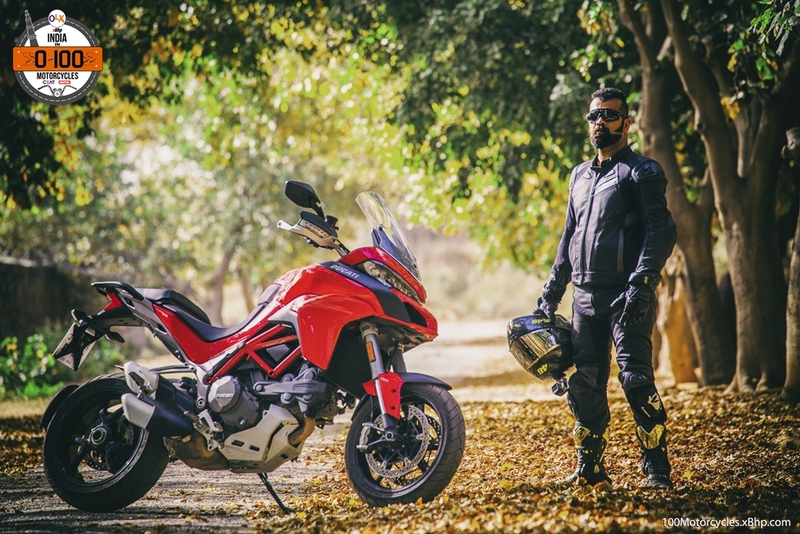 We had a wonderful time on it and wholeheartedly thank Mr. Monish Thakoor for sparing his time and allowing us to spend some time with his motorcycle. 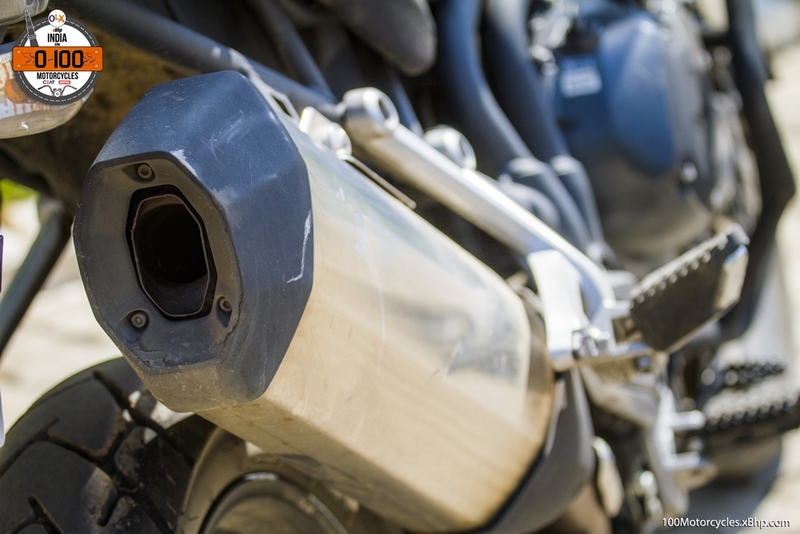 Adding to its rugged personality is the rumbling sound coming out of the twin-exhaust setup. 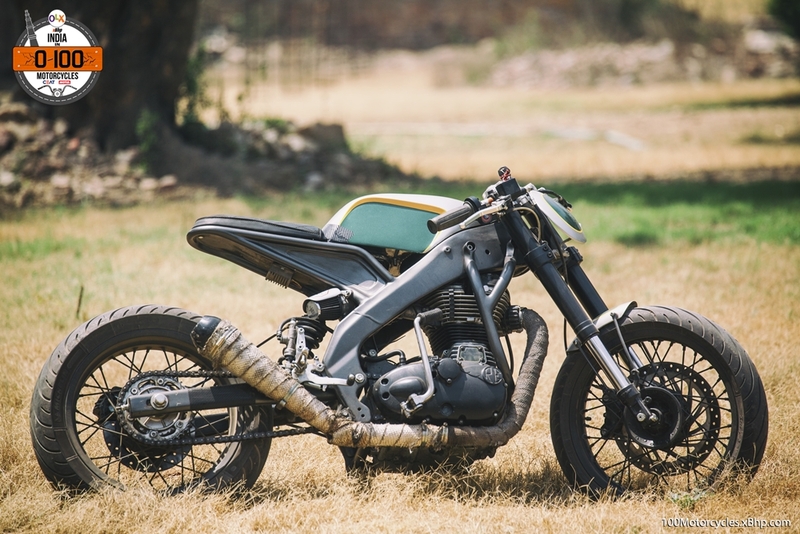 It is one of the few bare-minimum motorcycles that exist today. 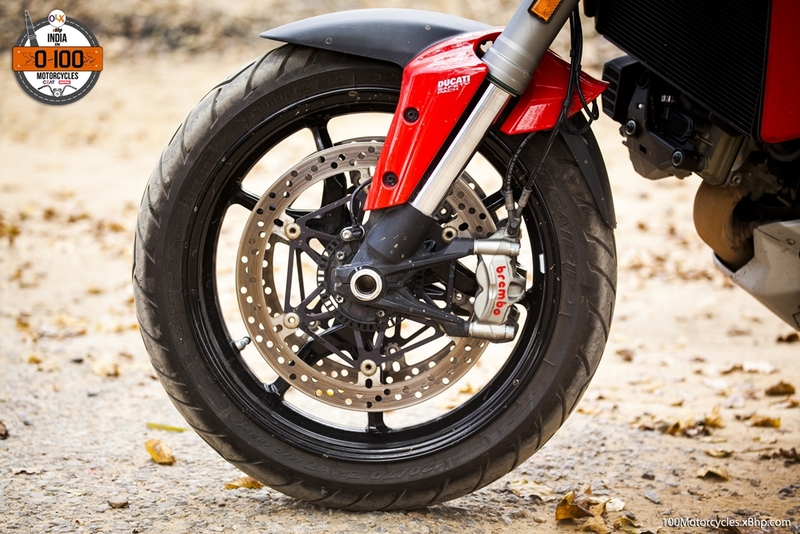 It comes only with ABS which is more or less a mandatory requirement in almost all two-wheelers. 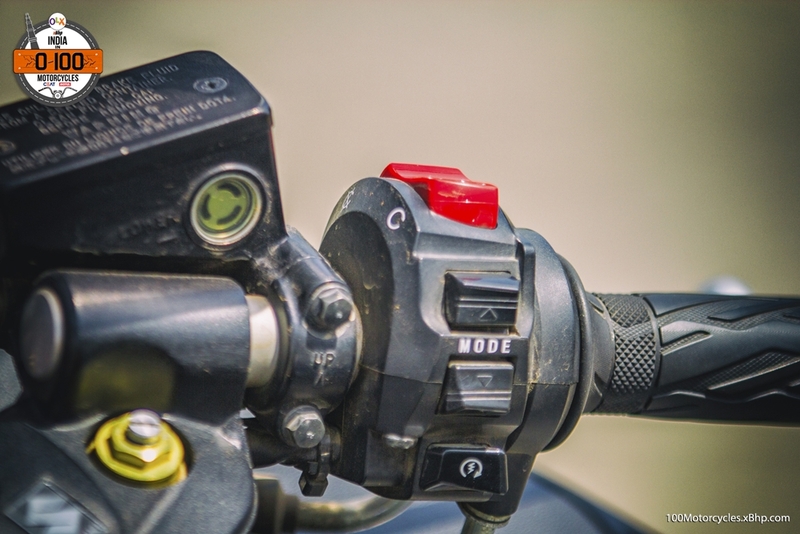 There are no electronics that we have come to see in many other motorcycles. 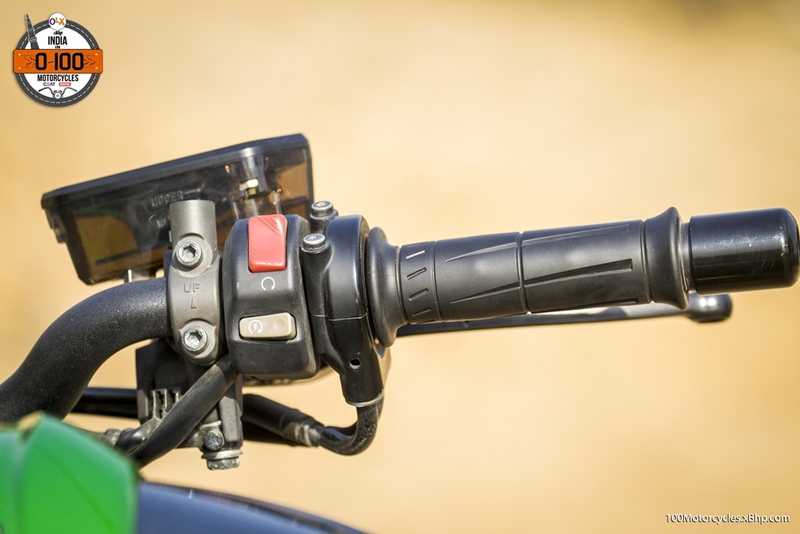 Inside your right wrist is where all the riding modes and traction control lies. 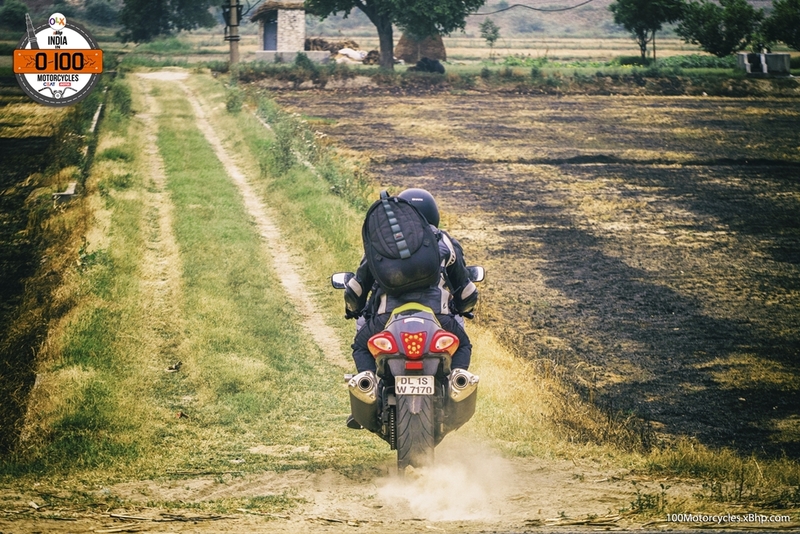 And like a good modern-day motorcycle, it is great to ride everywhere. 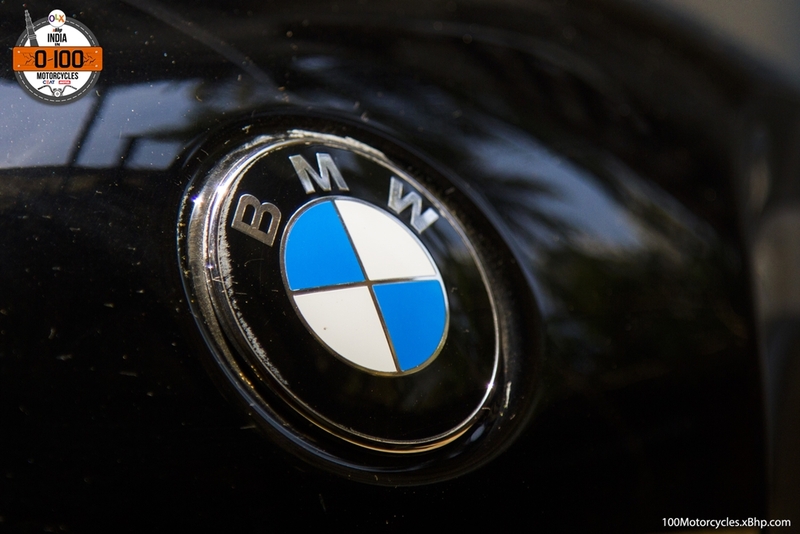 BMWs don’t come cheap, and for this reason, it won’t be a bad idea to try and find your desired BMW motorcycle on OLX. Who knows you might get lucky with the price. 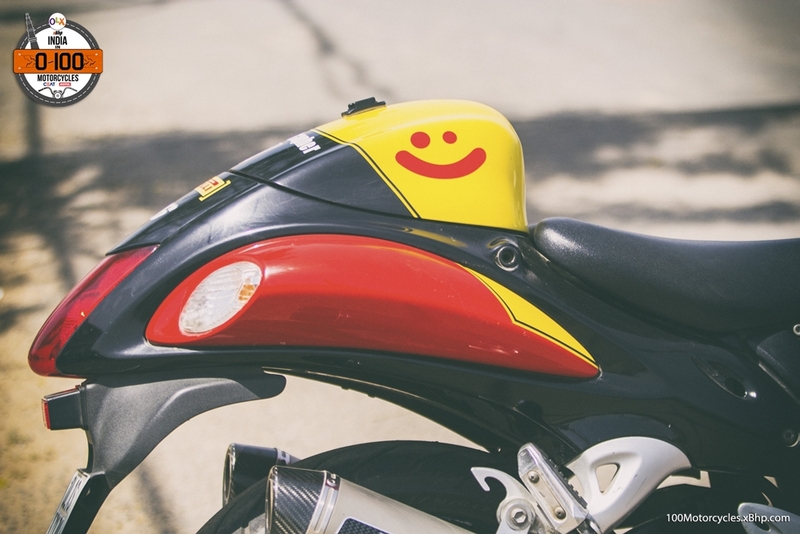 Find your favorite Honda Motorcycle listed for sale on OLX. Fireblade is one of the most popular and successful Superbike lineups in the world. 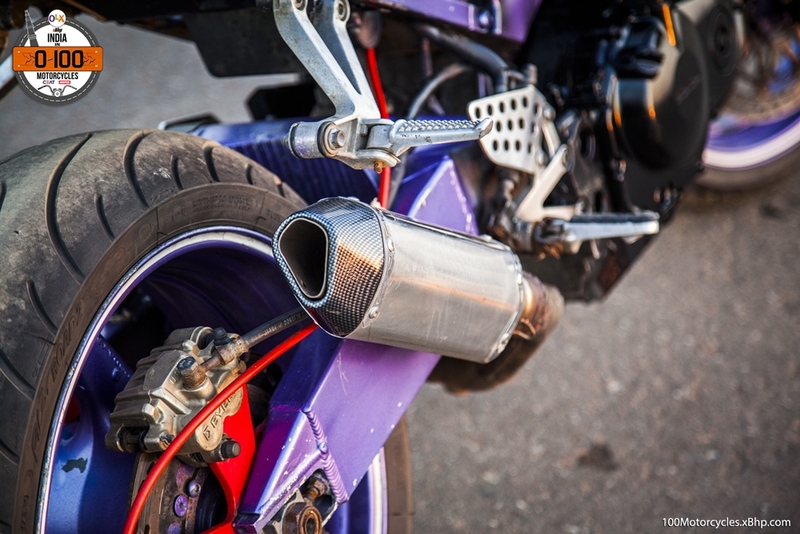 It all started in 1992 when a certain CBR900RR was launched by Honda as their first Superbike with the RR moniker. 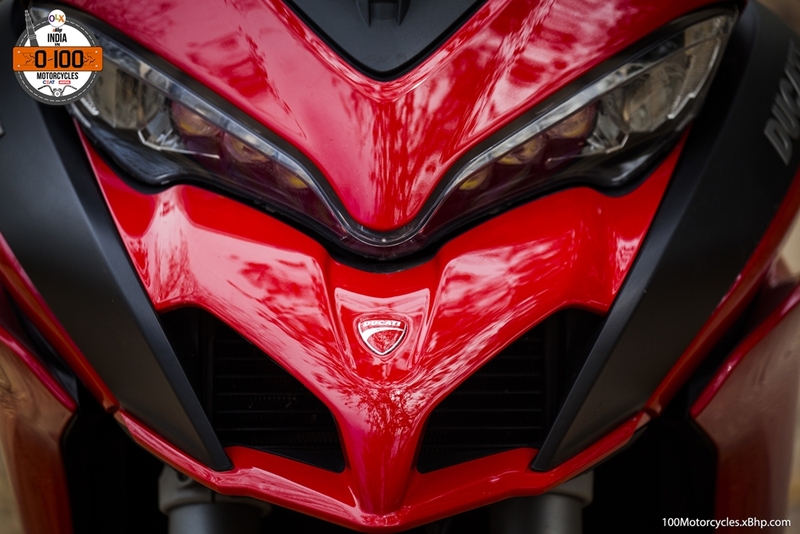 It was also their first Superbike to be called the ‘Fireblade’. Just thinking about it raises all the hair on the skin, isn’t it?! 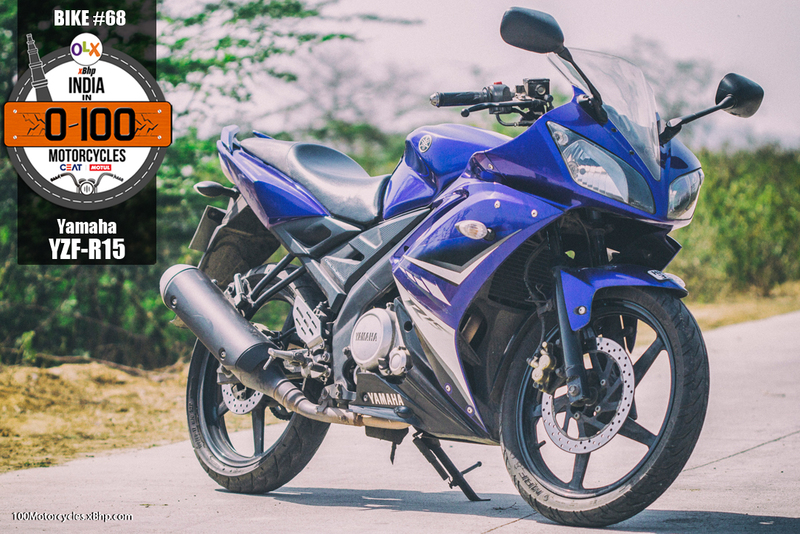 Find your favorite Honda Motorcycles listed on OLX for sale and you might find an interesting deal that fits your budget. 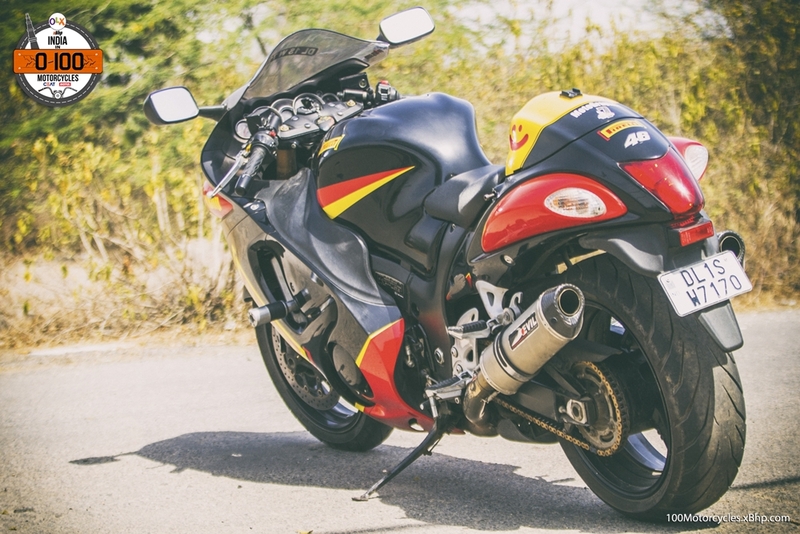 While we couldn’t get a CBR900RR, what we could get our hands on is one of the earliest Fireblades, the CBR929RR, which is basically Honda’s third Fireblade. It was launched in the year 2000. 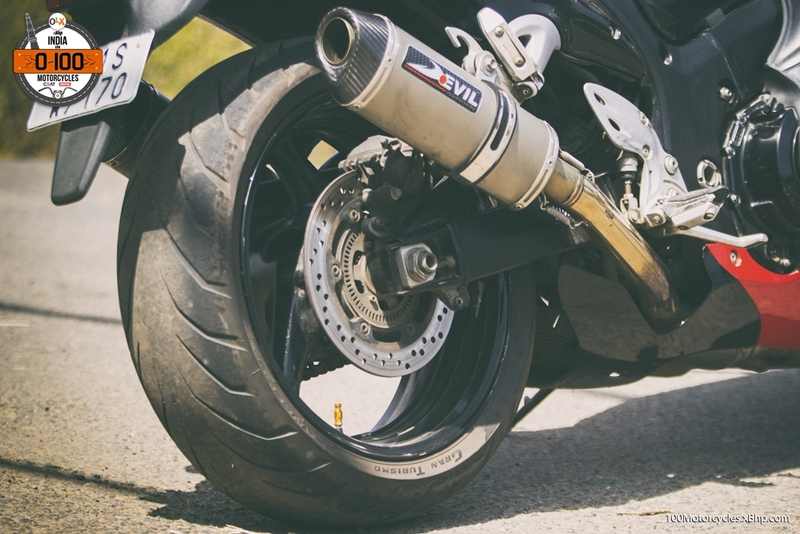 The CBR929RR marked a remarkable improvement over the first two Fireblades, it was the first in the series to come with the fuel-injection and lighter aluminium chassis which brought down the wet weight of the motorcycle to under 200 kg. 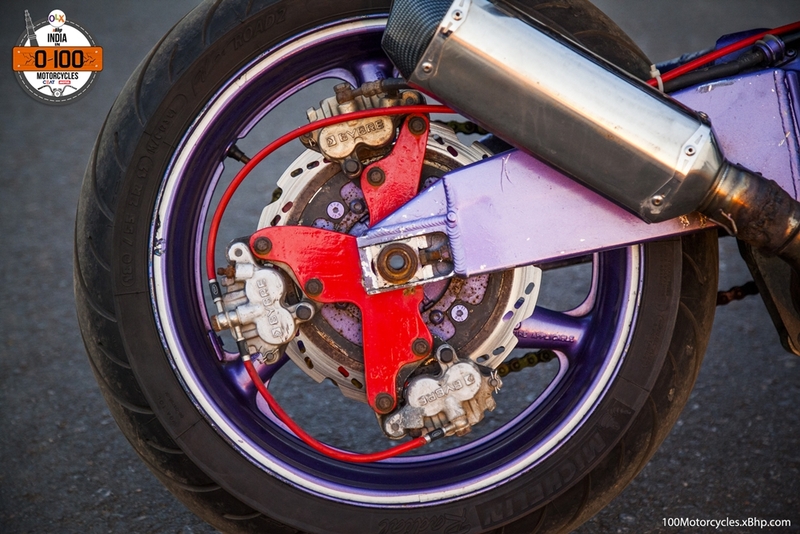 In a way, the 929RR was the first step by Honda in making major updates to the Fireblade. 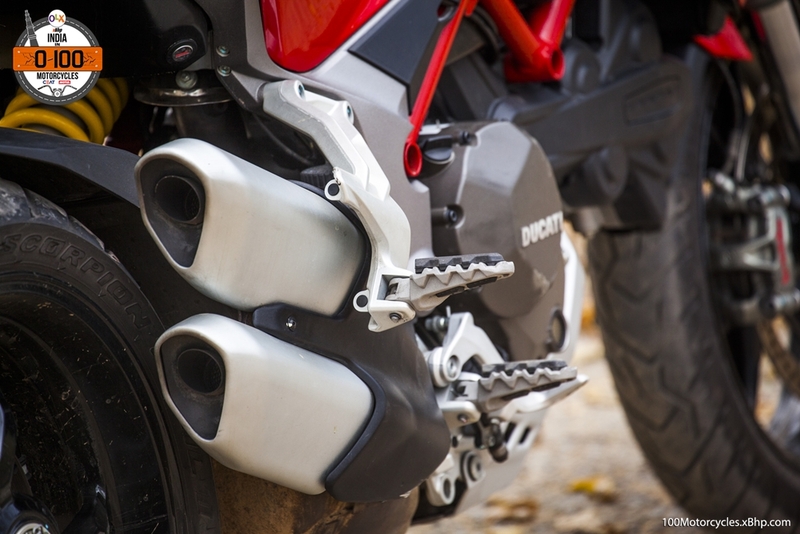 The exhaust system was also new and made of Titanium to save weight. 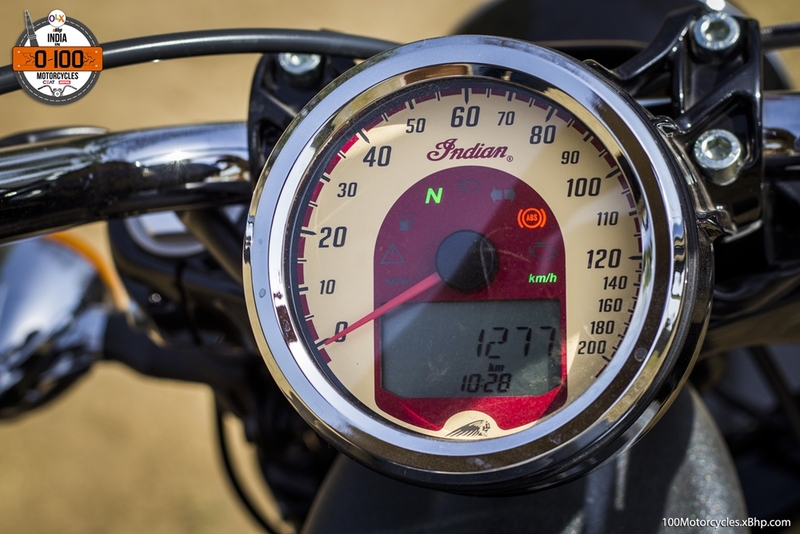 The motorcycle had a top speed of around 283 km/h. 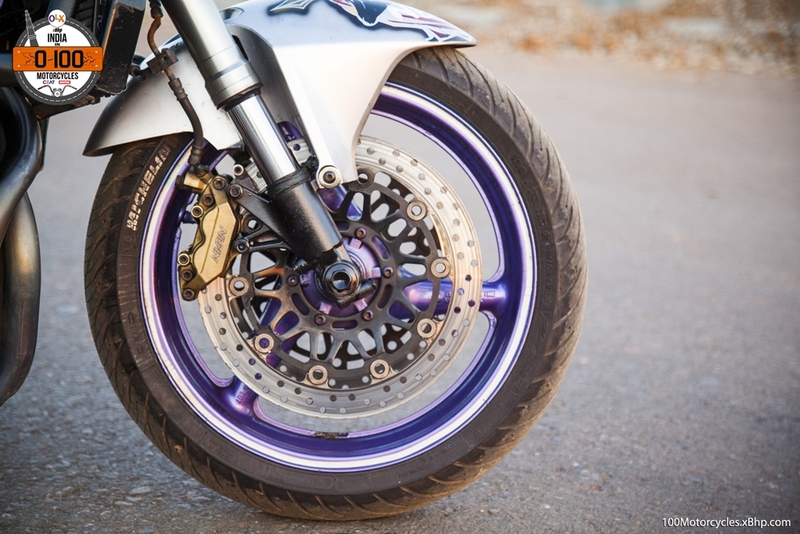 The series starter, CBR900RR, became famous for its low weight which added to its performance. The 929RR was even lighter. 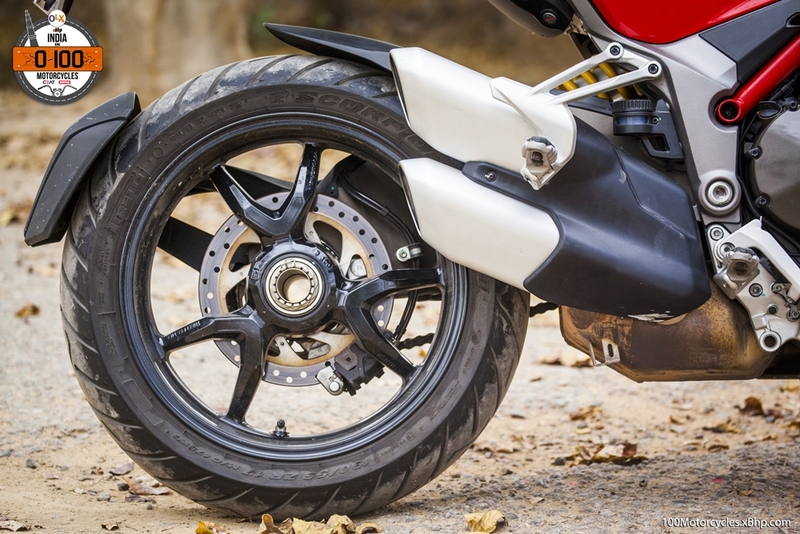 Honda’s biggest quest was always to keep the weight of the Fireblade as low as possible. 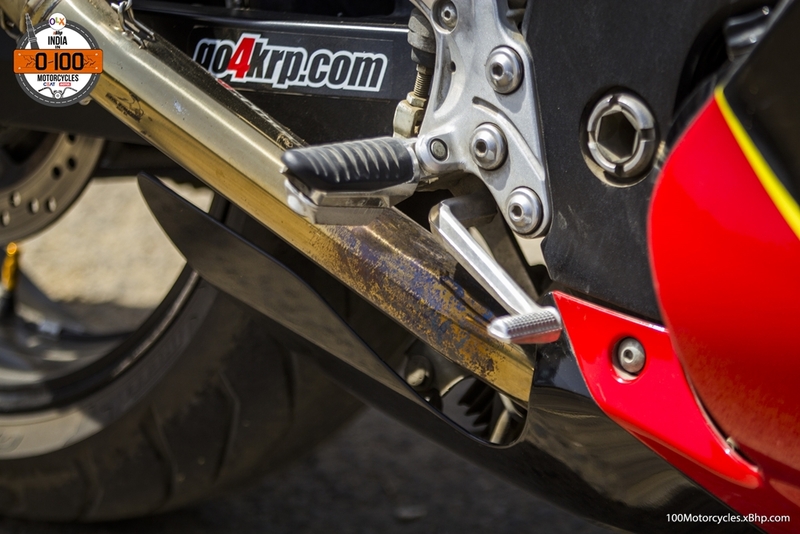 The 929RR we spent time with was far from a stock motorcycle. 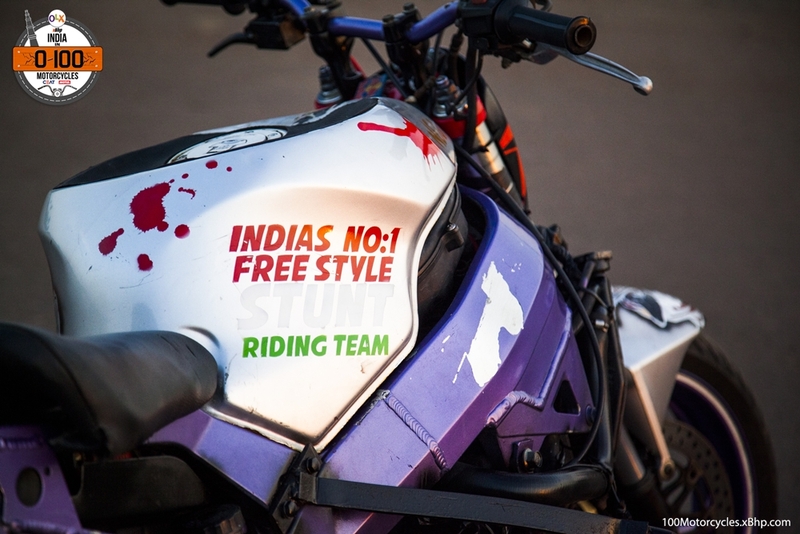 It’s ridden and used by the Ghost Ryderz which is one of the most popular motorcycle stunting groups in India. 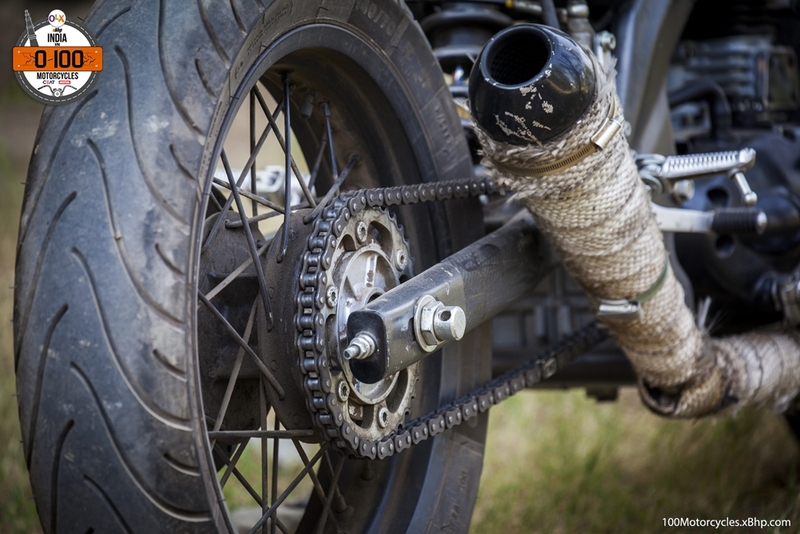 The motorcycle they use is modified to suit their requirements. 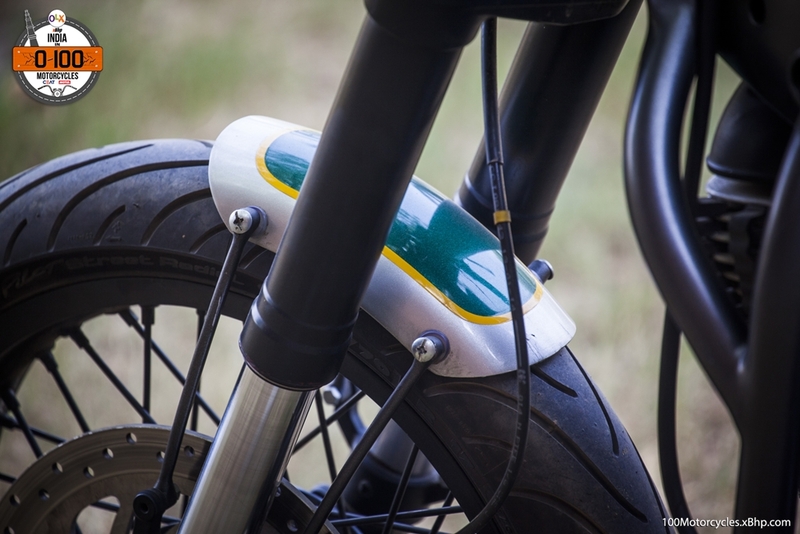 The fairing has been removed to reduce weight because a lighter motorcycle is easier to throw around. 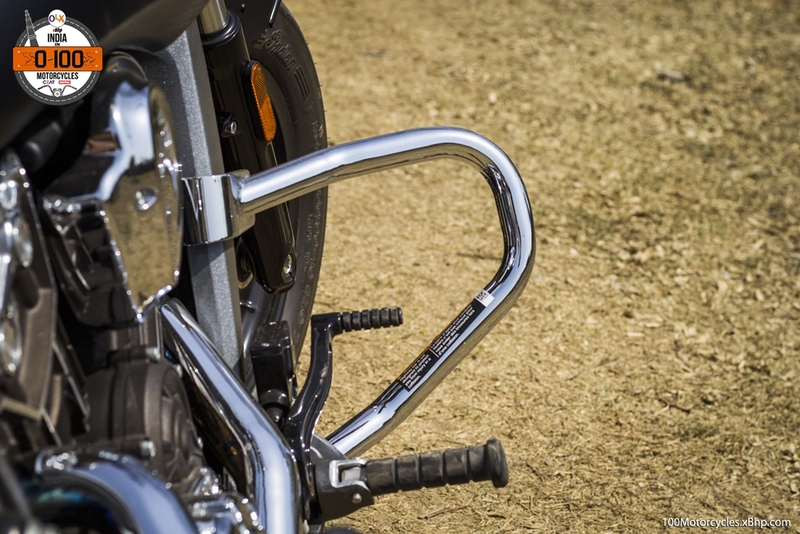 Then there’s the flat single-piece handlebar in place of the 2-piece unit. 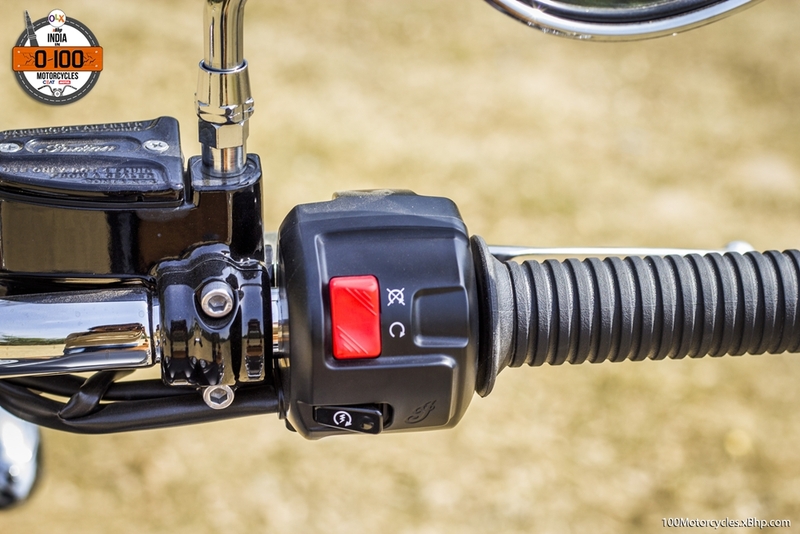 On the left hand side of the handlebar, there’s a custom rear brake lever. 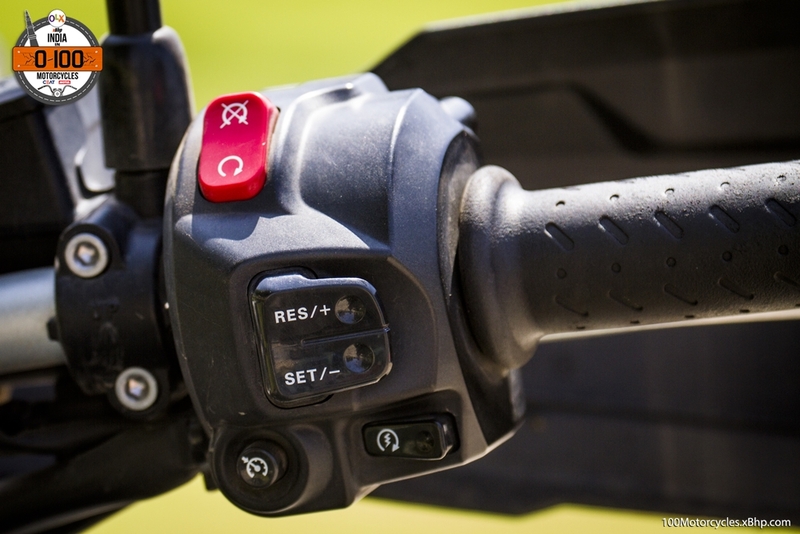 This makes it easier to operate the brake when doing certain stunts. 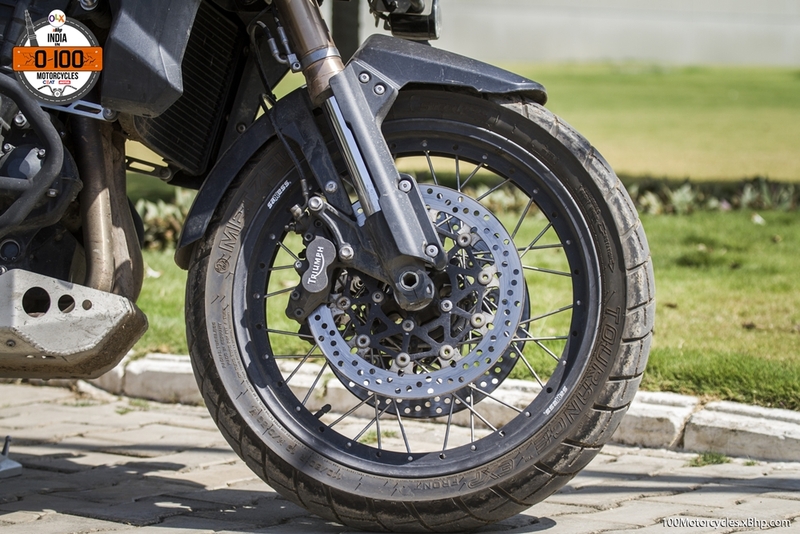 Also, the rear sprocket is much bigger to increase the initial torque to the rear wheel resulting in easier wheelies. This is all fine, though. 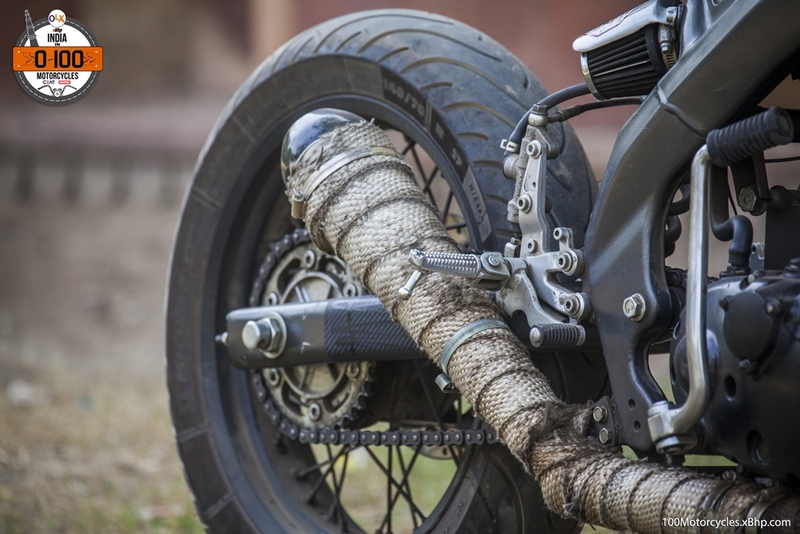 What’s important here is to realize the longevity of this motorcycle given the manner it is being used. 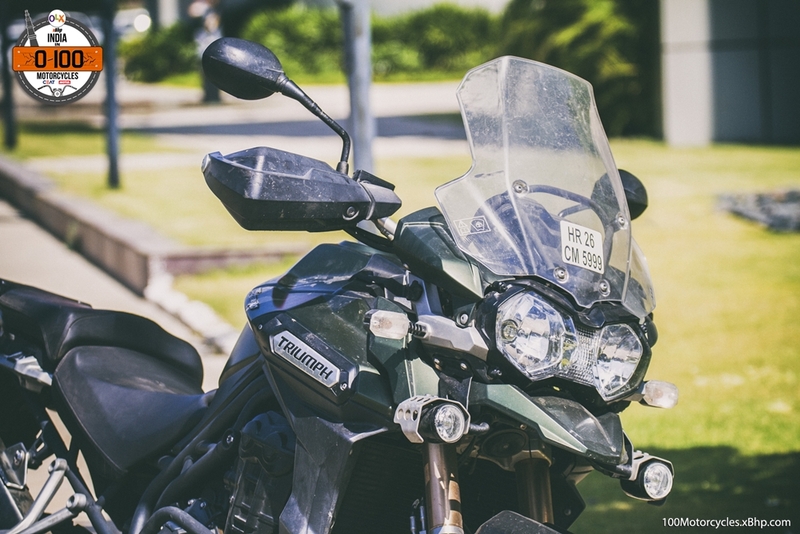 By all means, it would be considered an absolutely outdated motorcycle today, however, that it is still considered as the motorcycle to have by many people is a testament to its quality, reliability and above all, performance. 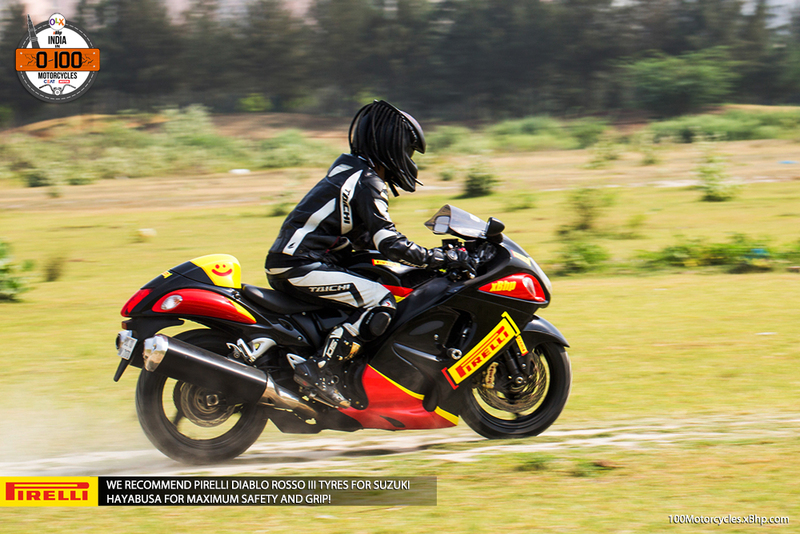 Keeping a motorcycle like the CBR929RR has its own flavours as long as you can maintain it well. 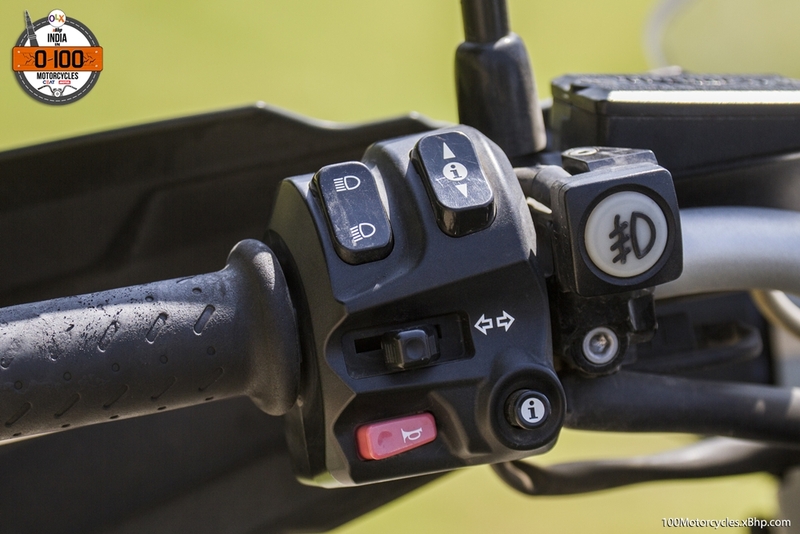 It is like going back to the basics of Superbiking. 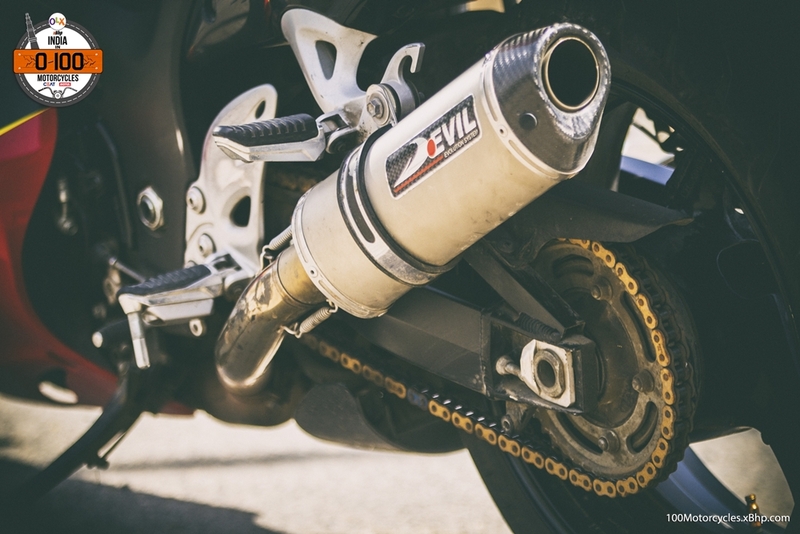 While it’s a relic compared to any modern day litre-class sportbike, the performance is still more than satisfactory by all means of logic or no logic. I mean, let’s get real, 0 to 100 acceleration that could rip the arms off the shoulders, a quarter-mile time of less than 11 seconds and a top speed of over 280 km/h. These performance numbers can’t be considered as relic even by today’s standards. 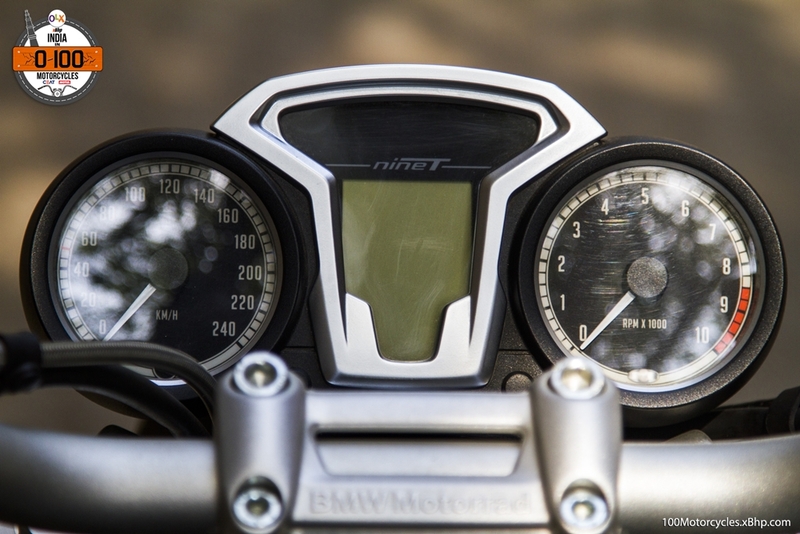 Another perk of owning the 929RR is the unadulterated performance. 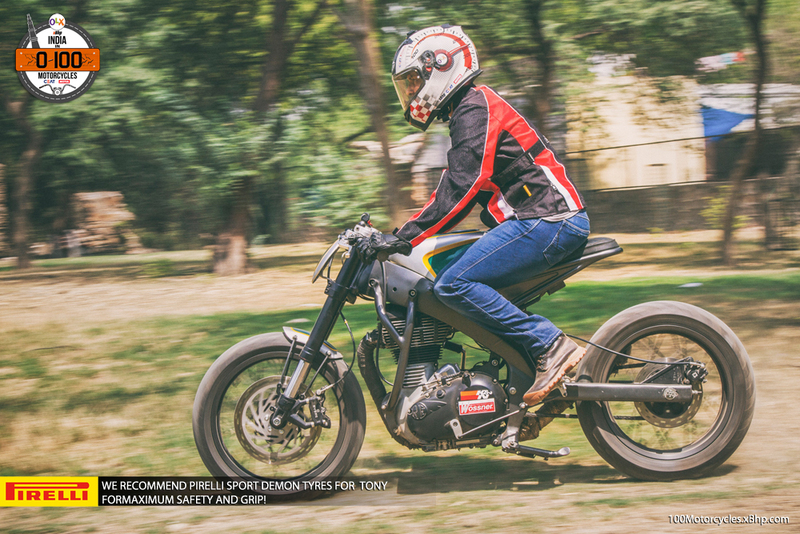 No Traction Control, no ABS, no ride by wire and definitely no riding modes – it’s as close to being raw as it can get. 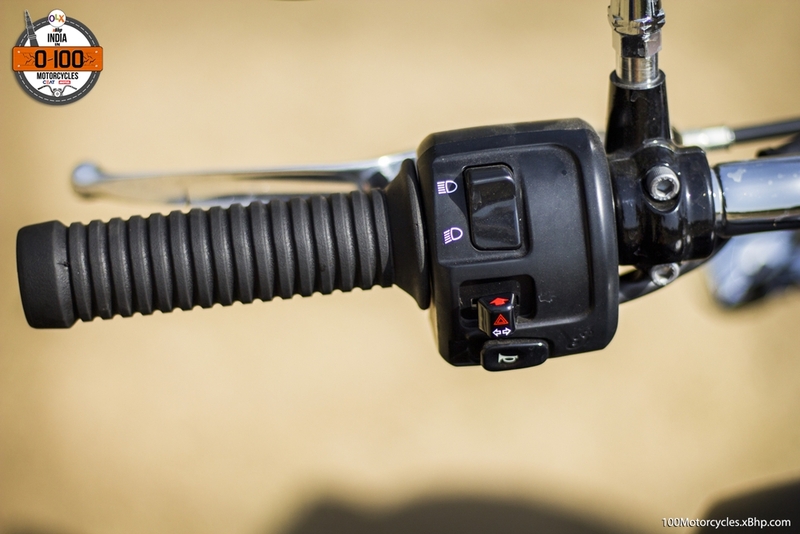 If you can master this bike, you’re a very good rider indeed. It will also likely not hurt very much in your pocket if you drop it. And then there’s the ever-present feeling of old school – nostalgia. It is like a father who has been there and seen it all, full of exposure, rugged by the experience it’s got. You’d want to listen to it when it tells you something. 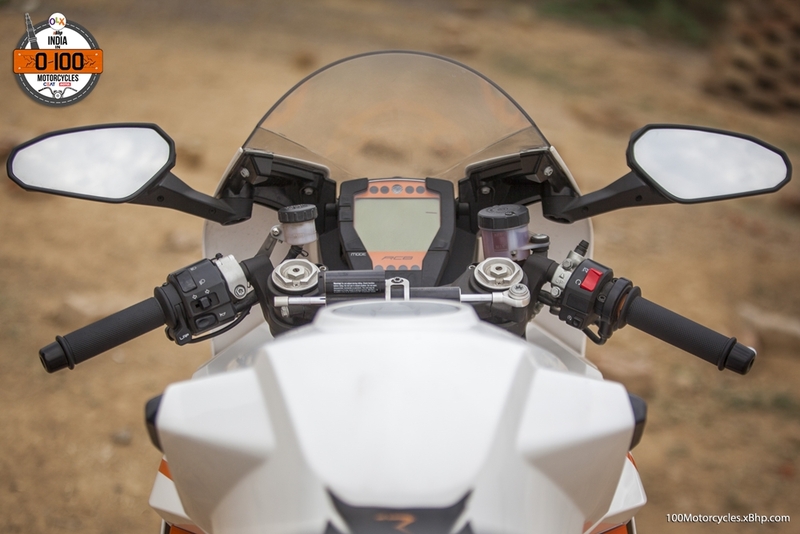 It is a no-brainer that the CBR929RR is long gone. 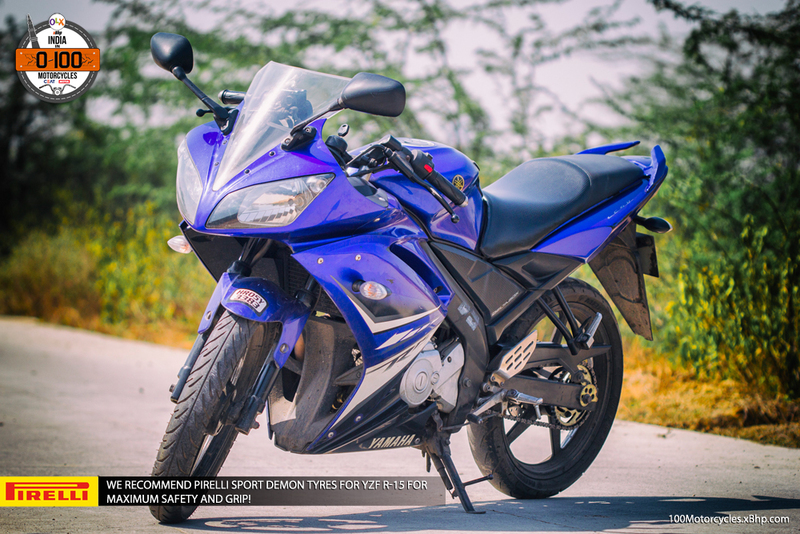 But the market of second-hand bikes is always there and today getting an old one is easier than before, thanks to OLX. So try finding one on OLX and you just might get lucky. 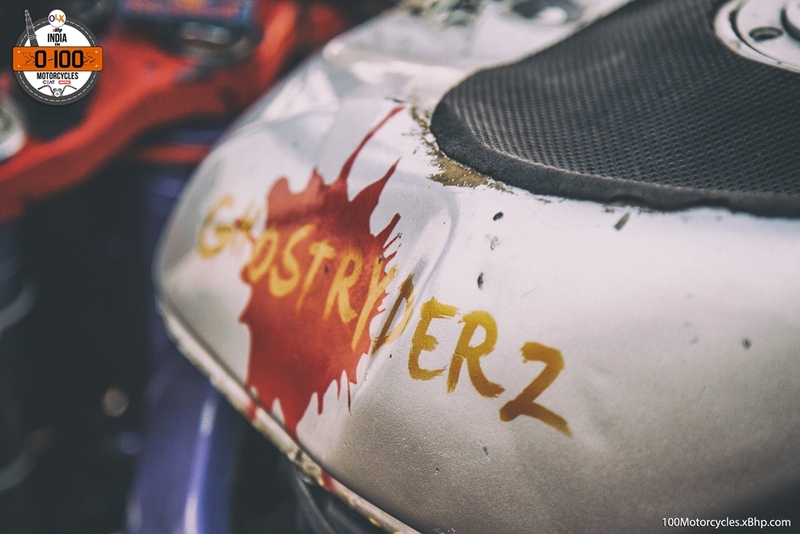 Lastly, we would like to thank Ghost Ryderz group for their time and letting us spend time with a special Honda CBR929RR. 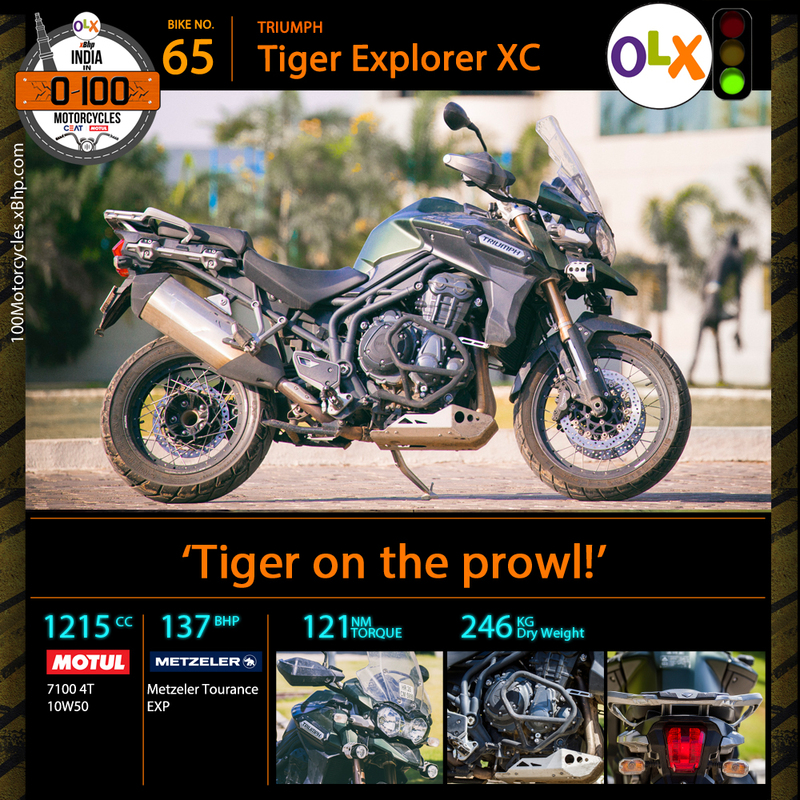 65Triumph Tiger Explorer – Tiger on the prowl! 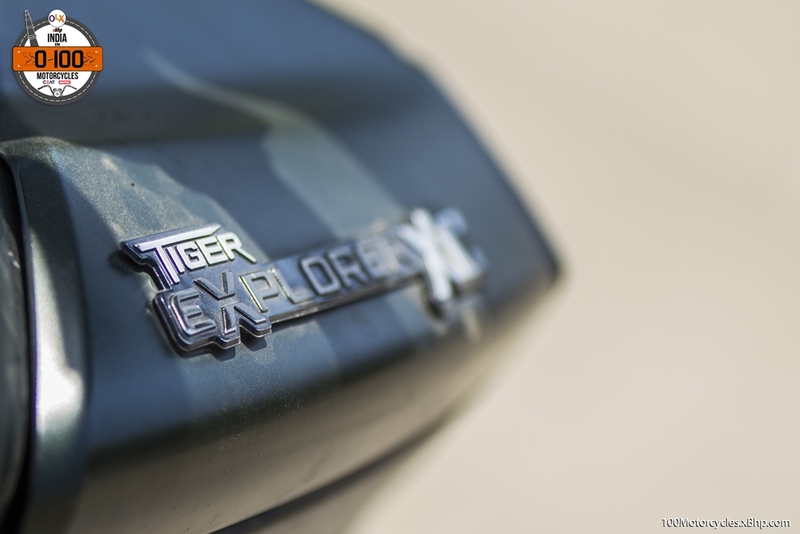 Need cash to buy Tiger Explorer XC? 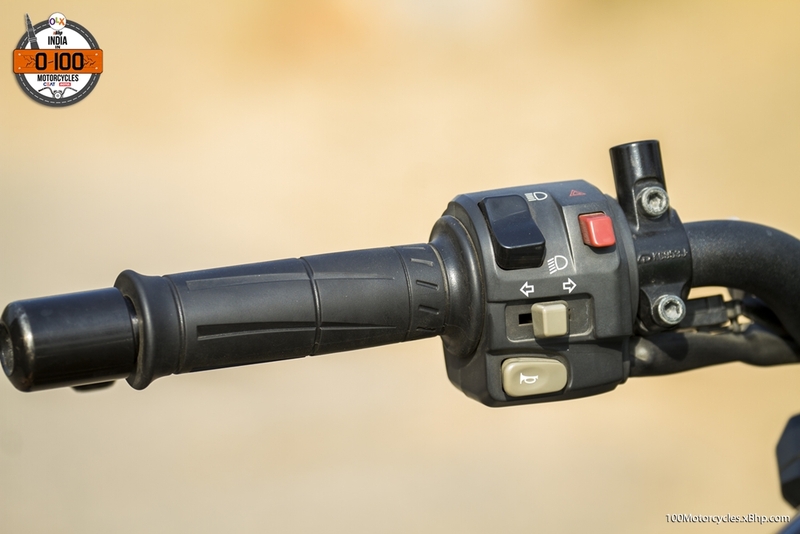 Sell your old bike on OLX. It is as if like it was always there, we just didn’t know it was. Or more likely, we knew about it all along but we just didn’t realize it. 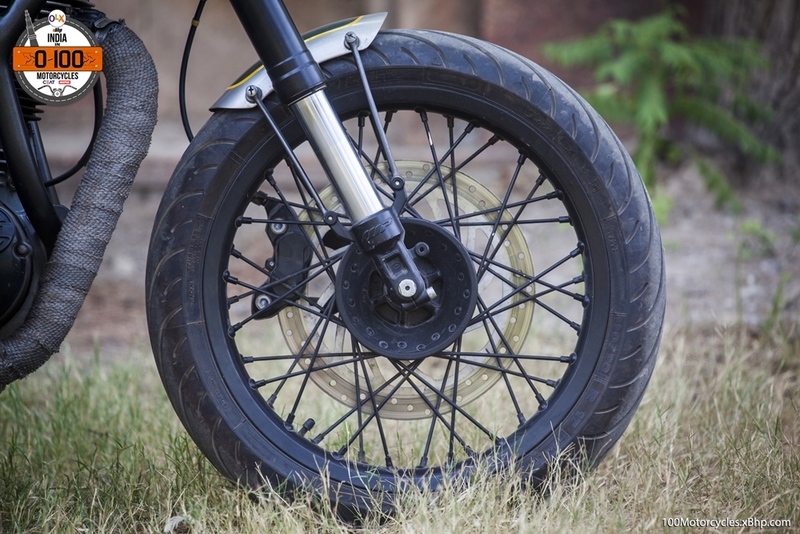 And where we are getting with this fits both to the buyers and motorcycle manufacturers. Perhaps, a wee bit more for manufacturers. Falling short on cash? 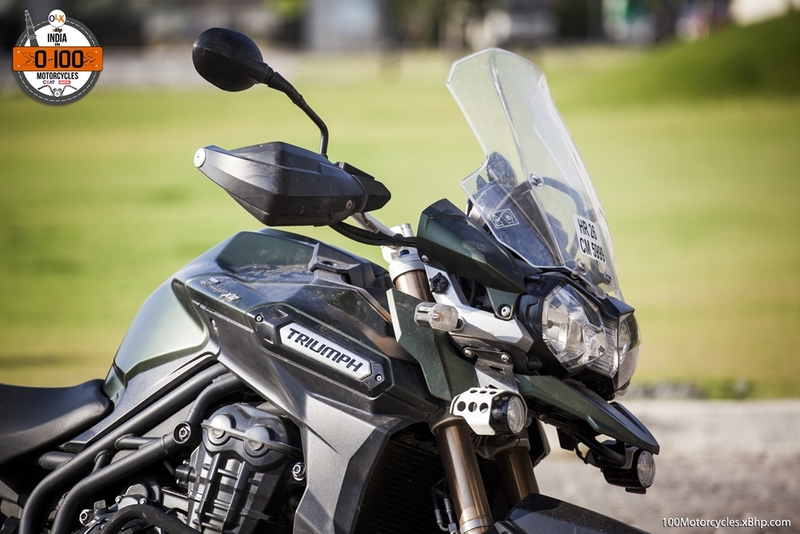 Find your favorite Triumph Motorcycle listed on OLX. 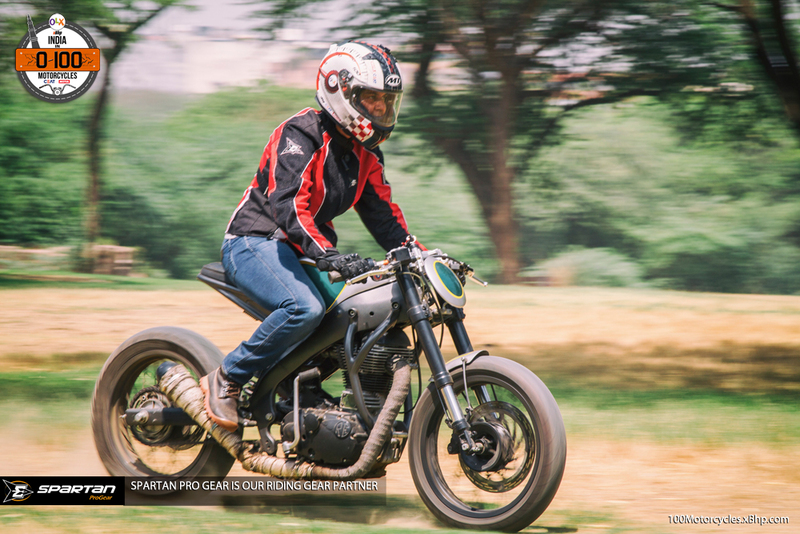 For long, Royal Enfields were synonymous with touring even with all their shortcomings – faulty electrical, unreliable clutch/throttle cables, a bit too lazy engine, tube tyres etc. 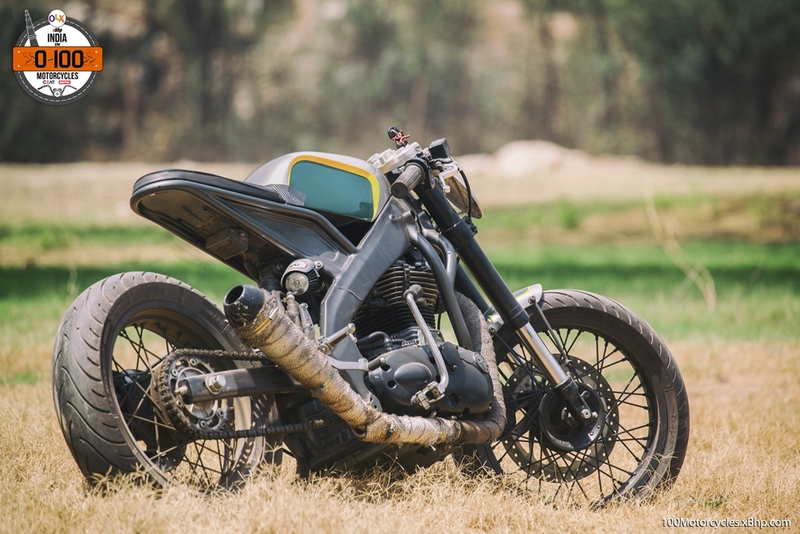 Part of it is because we didn’t really have any other option and Royal Enfield was the only “big” motorcycle with a “big” engine. 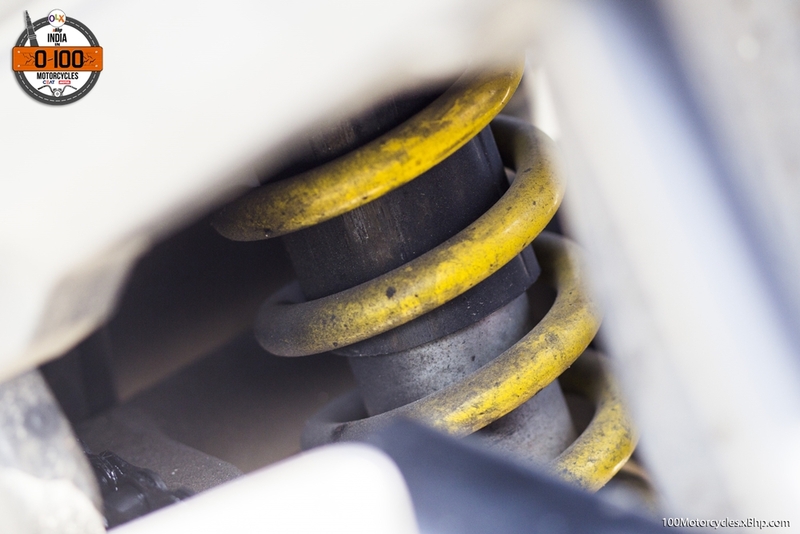 Given the price sensitive market that we are, we haven’t believed much in investing and knowing about what different chassis and suspension and their combination is capable of achieving, until now. 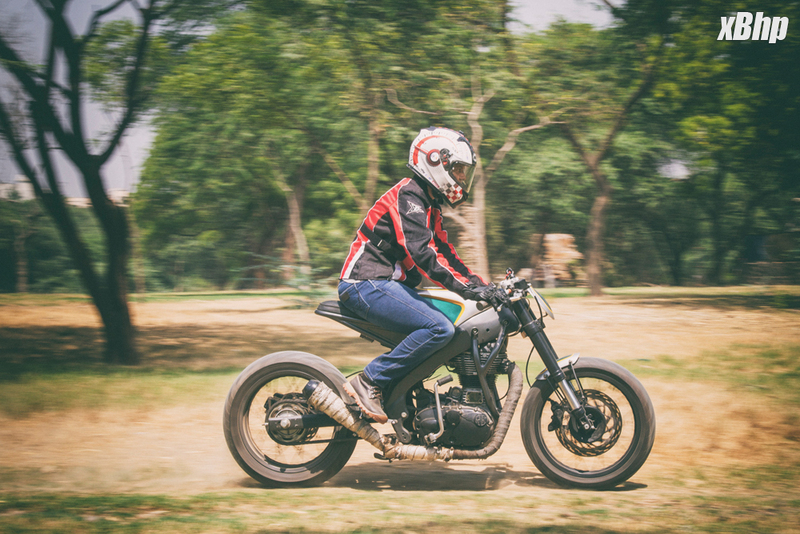 Secondly, we are not really used to spending much on purpose-built motorcycles. 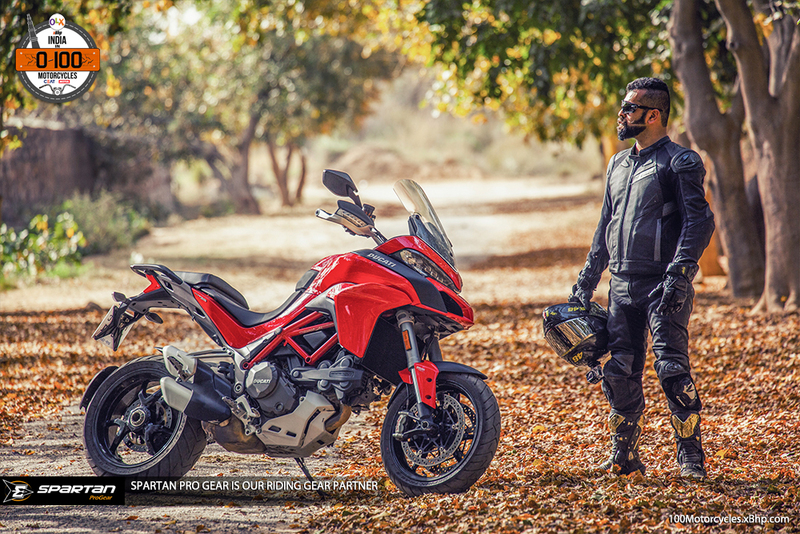 The bitter truth, most of us would be happy to get a Superbike and happily spend the next few years posing with it. 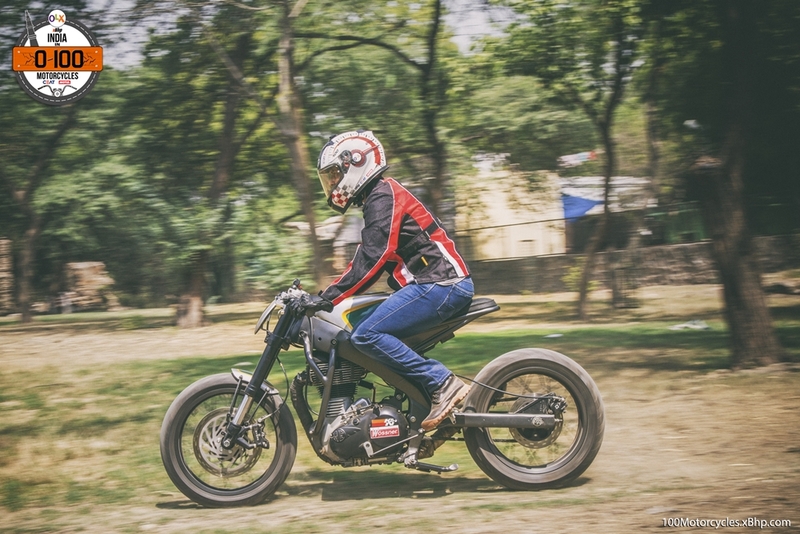 But things are changing, while we are few in numbers, the motorcycle market in India is now opening up for enthusiasts in ways like it never has. 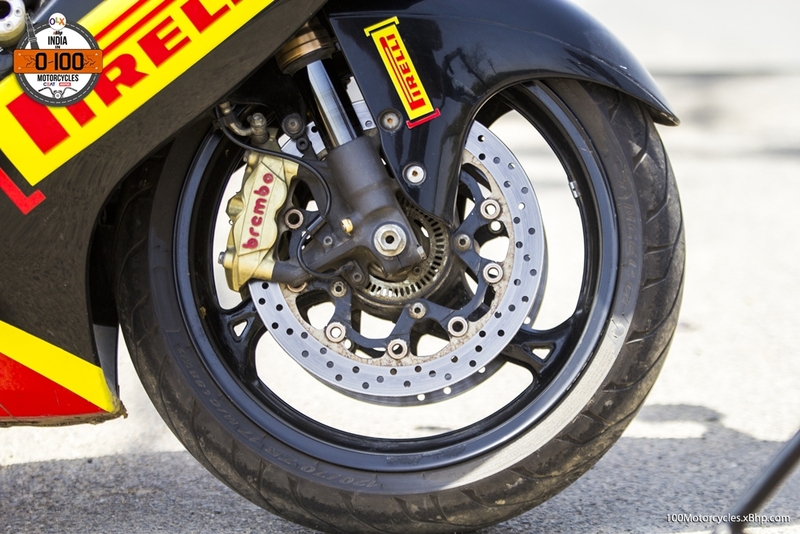 We not only have access to 200 BHP Superbikes today but also to the classics, sport-tourers, adventure-tourers and more. Companies are finally beginning to realize that mass-market motorcycles and expensive/purpose-built motorcycles can co-exist in our country. 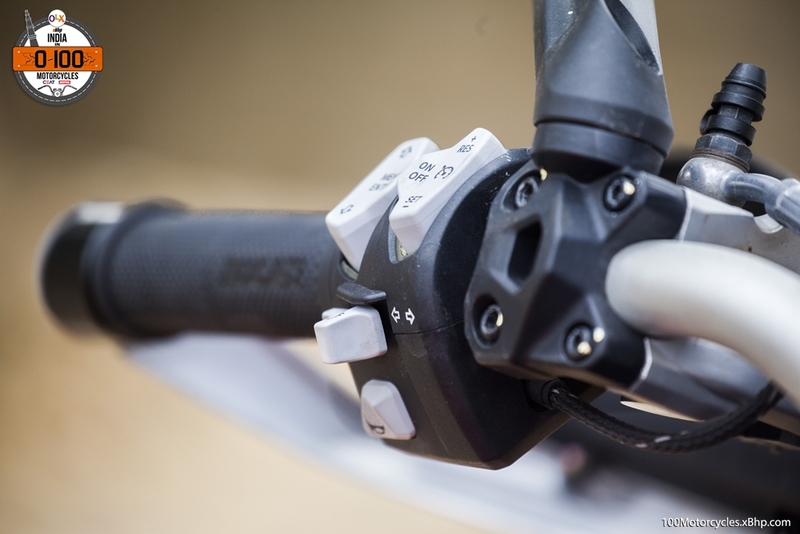 That also has to do with the changing mentality among riders as well. 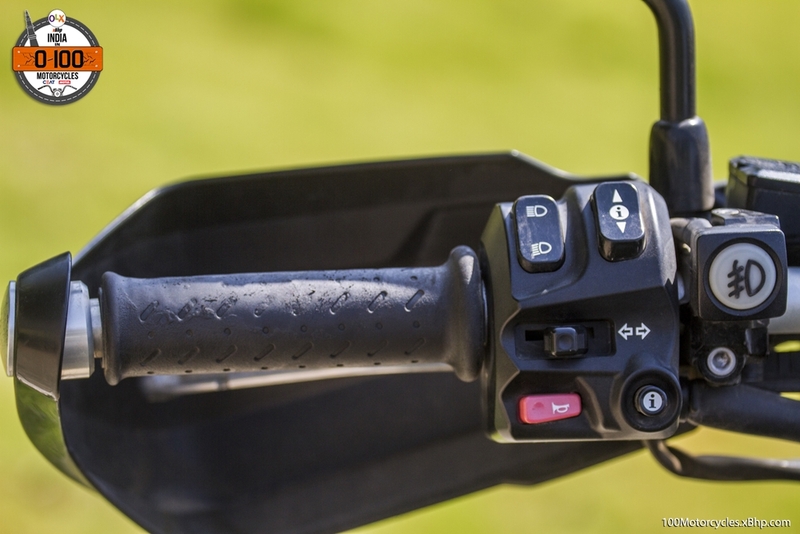 We are now more aware of different motorcycles and their usability. 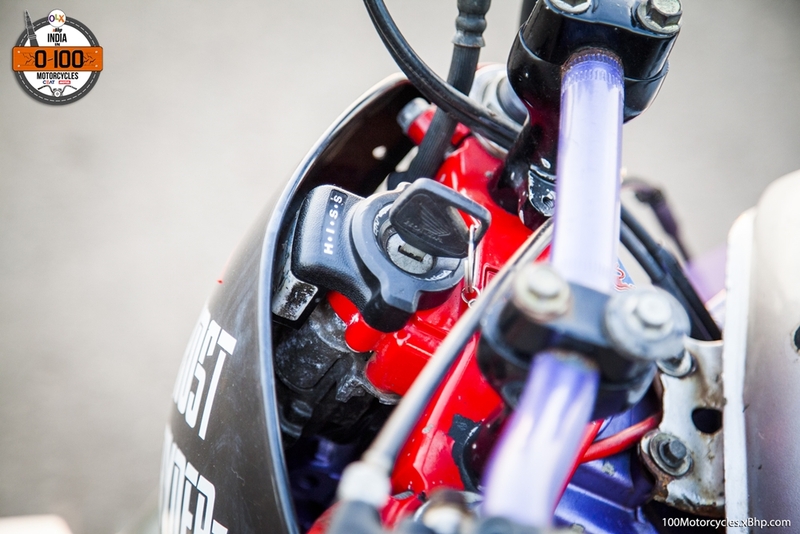 Also, the newer generation of riders is well aware as well thanks to the guidance they get from their elders and also because of better access to watching motorsports and information on the internet. 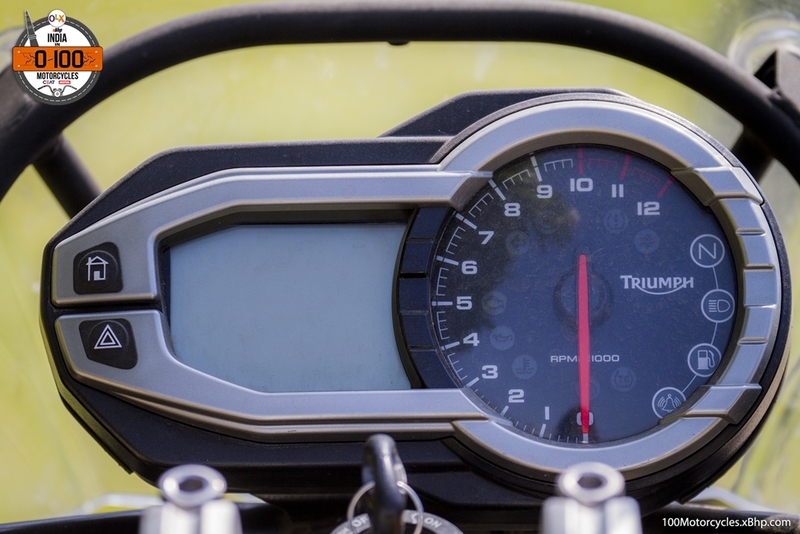 Triumph is one such international bike maker which has a wide range of motorcycles – from classics like Bonneville to the Supersports like Daytona and then there are adventure-tourers, streetfighters, cruisers, right up to the badass 2300cc Rocket III. The company has literally everything for everyone. 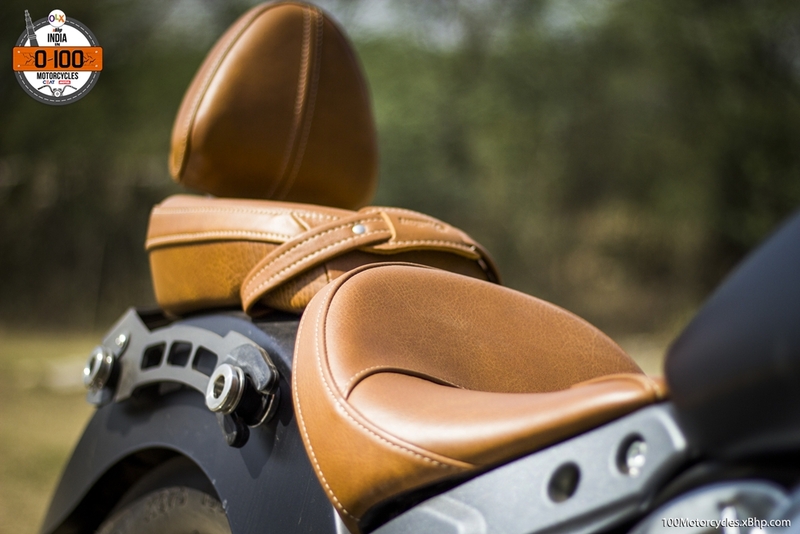 Now, one form of a motorcycle, in particular, is witnessing a great success in India and we are all so much happy about it. 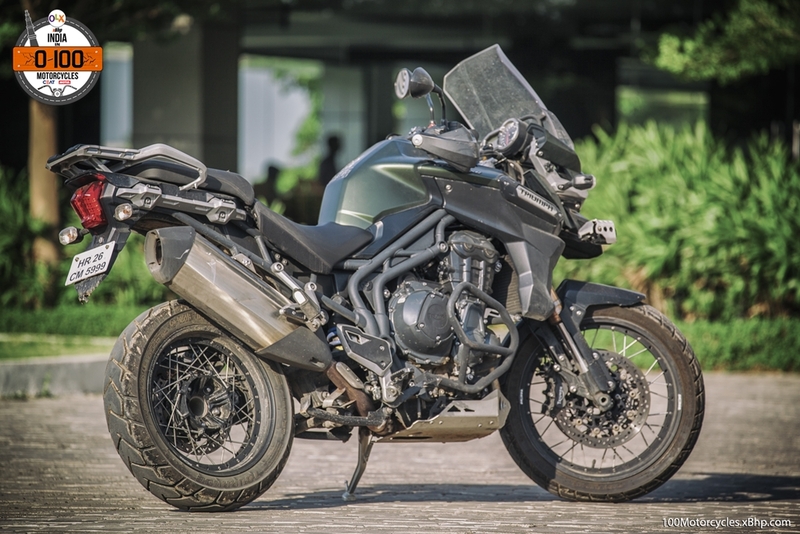 It is not the easier-to-guess Daytona 675 or the Street Triple, it is not even their cruiser, it is, in fact, their adventure-tourer – Tiger. 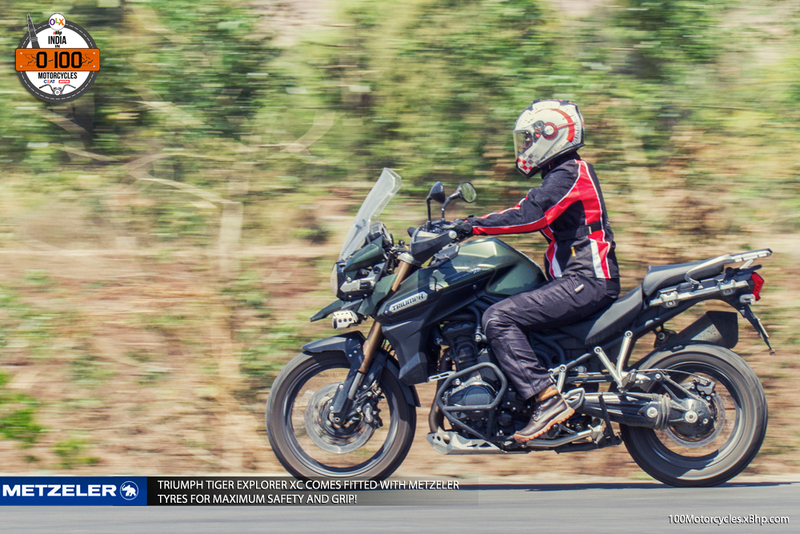 The Triumph Tiger has been one of the most successful motorcycle lineups since its launch in the Indian market. 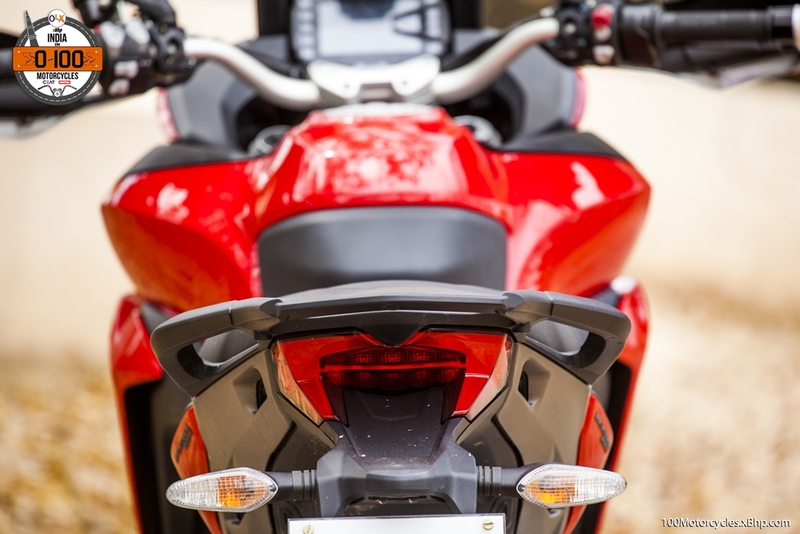 If it’s the versatility you’re looking for, this is one of the best motorcycles to have. 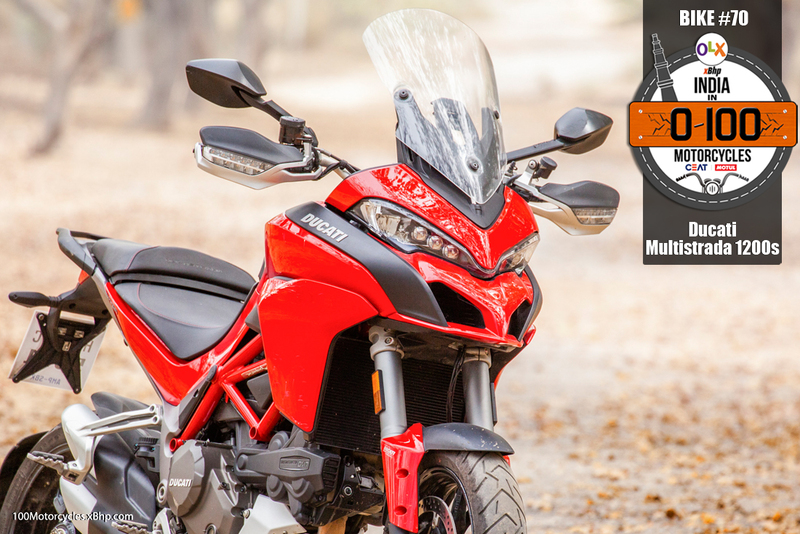 It is a good street motorcycle, excellent mile-muncher on highways and extremely capable off the road. 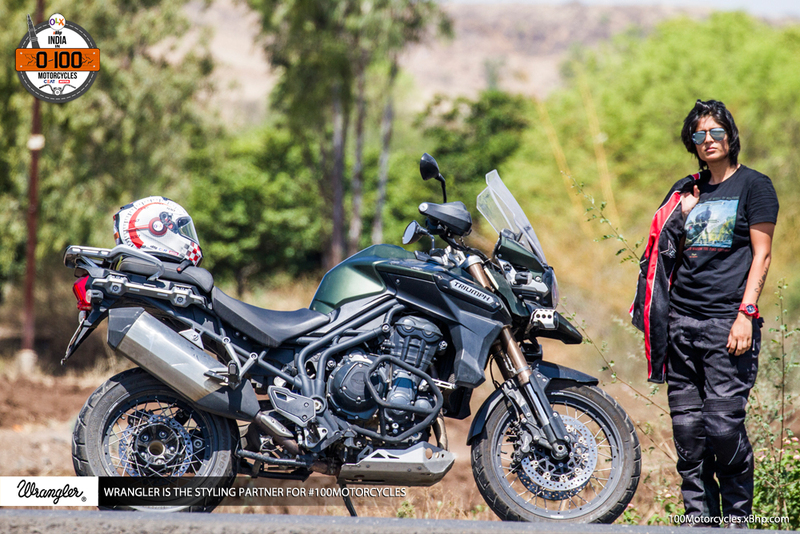 With the pillion or luggage or even both, the Tiger would carry everything happily all day long. 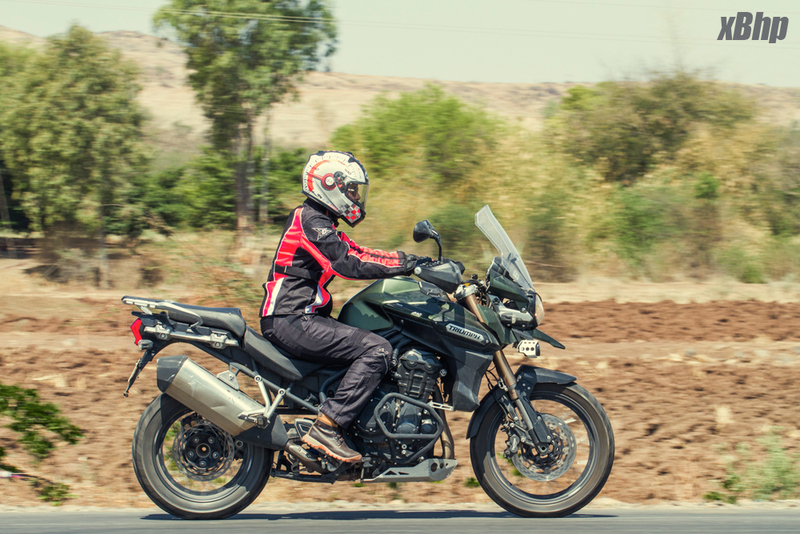 Tiger comes in two variants – 800cc and 1215cc – both inline 3 engines. 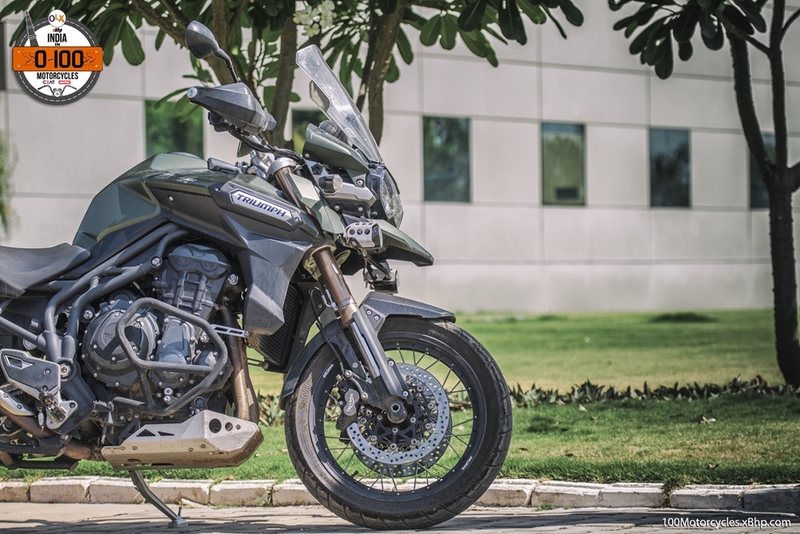 The Explorer is the top of the line Tiger and the one with the larger 1215cc engine churning out 137 PS of power at 9,300 RPM and 121 NM of torque at 6,400 RPM. 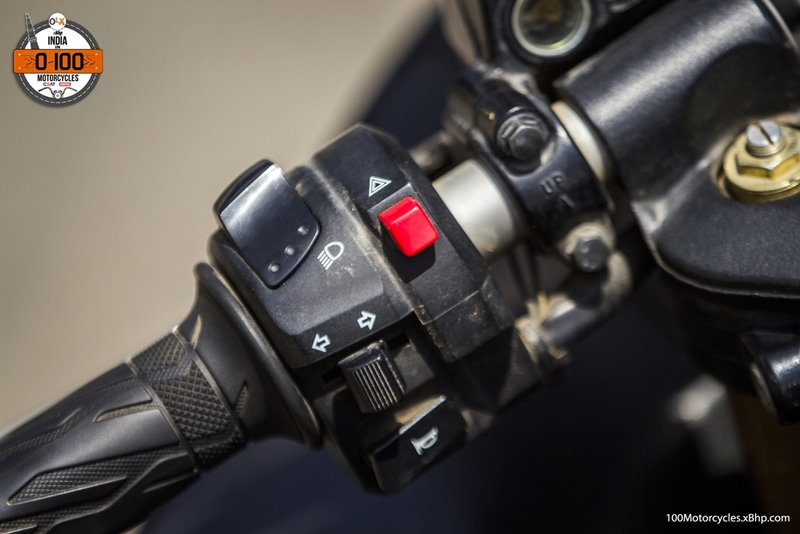 It’s quite loaded with technology which is a norm in performance motorcycles today. 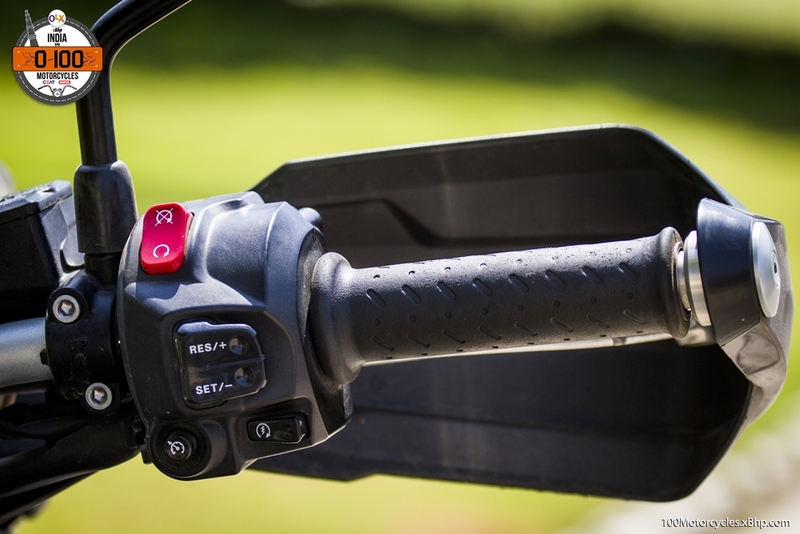 Stuff like Ride by Wire throttle, Traction Control, switchable ABS, Cruise Control and engine Immobilizer are standard features. 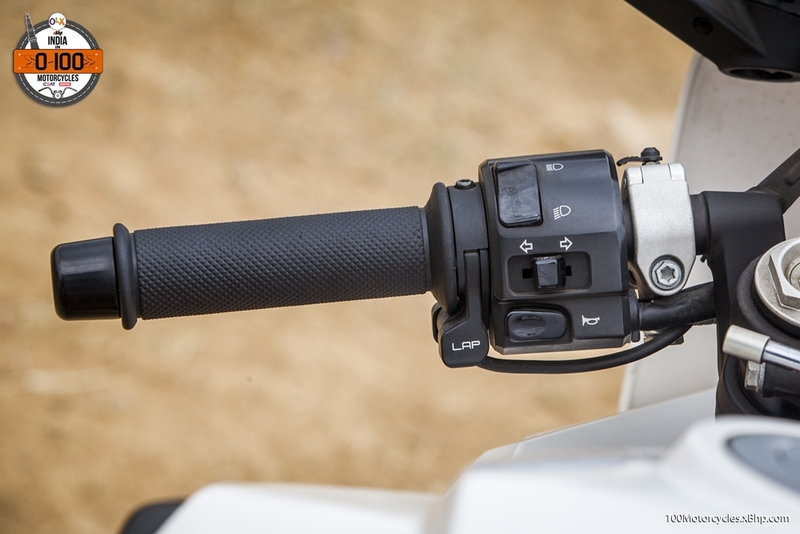 Also, the seat height is adjustable by 20 mm (837 mm to 857 mm), so is the handlebar position and windscreen. 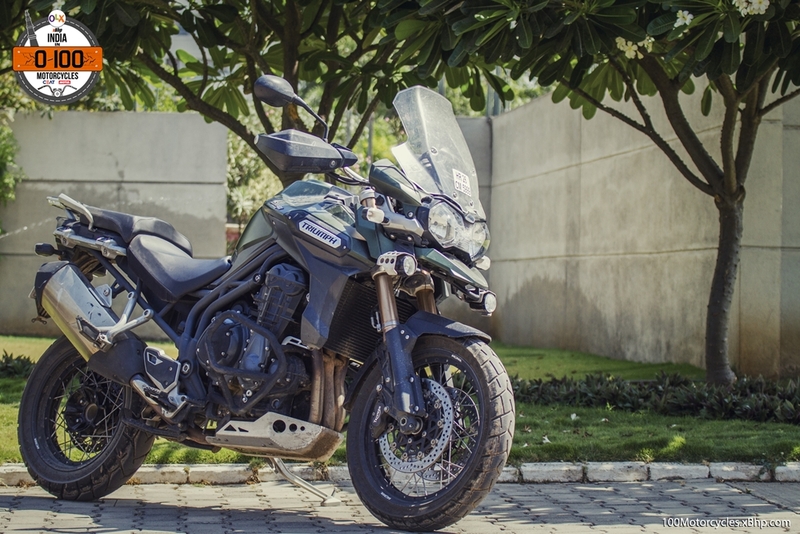 Triumph has two versions of the Explorer, the other one is called Explorer XC, and this is the one we get in India, not the standard Explorer. 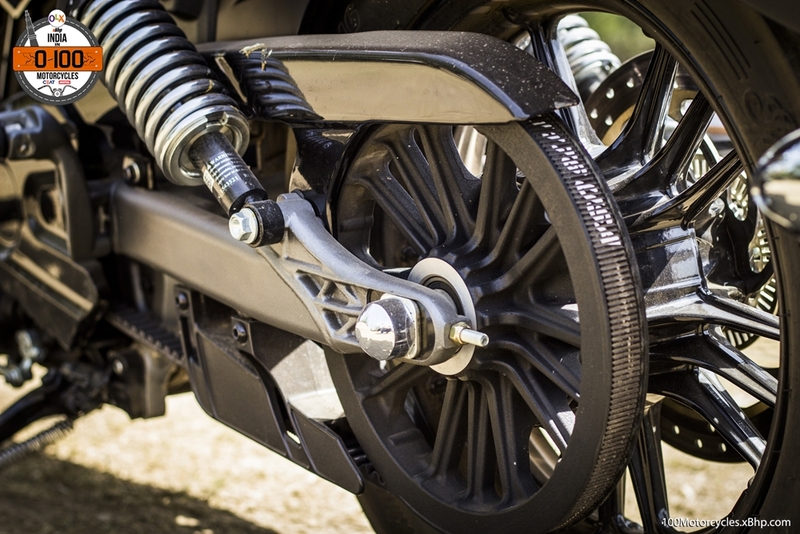 The Explorer XC is more adapt for going off the road as it has wire-spoke wheels. The tyres remain tubeless though which is great. 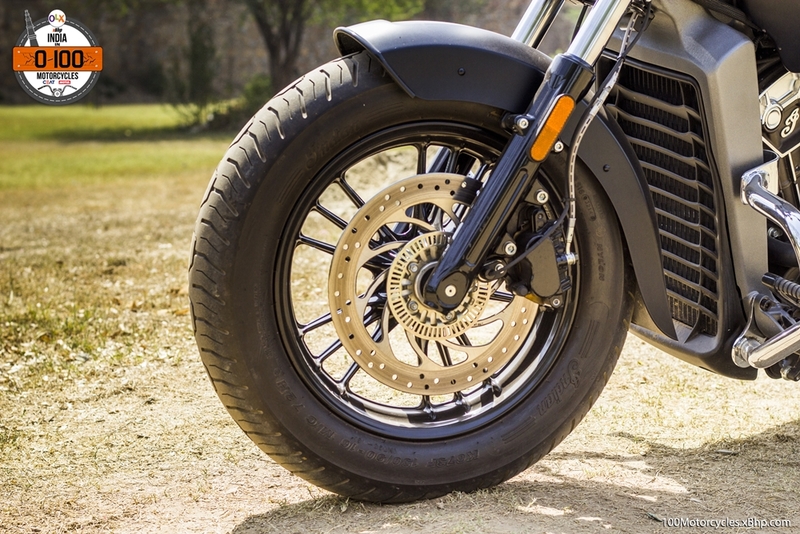 The rear is a 17-inch wheel while the front is a 19-inch one. Performance on the road from the big Tiger is very impressive. 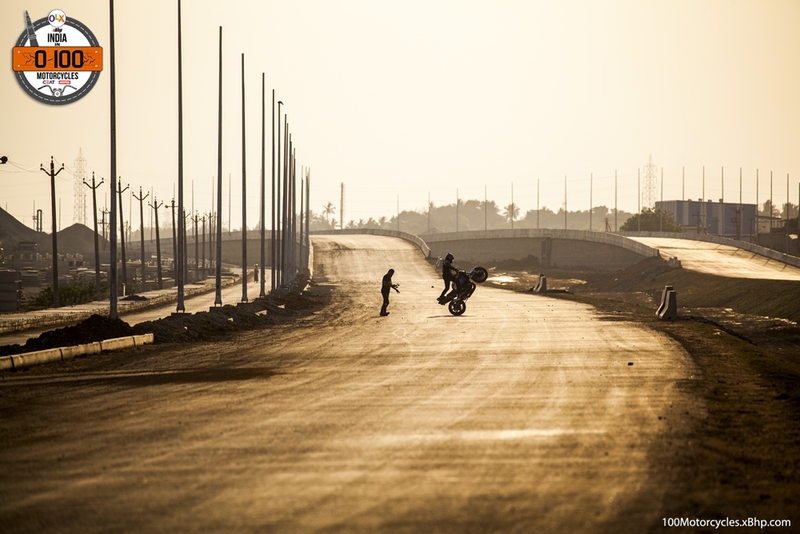 There’s no dearth of power even for the longest and emptiest highways. 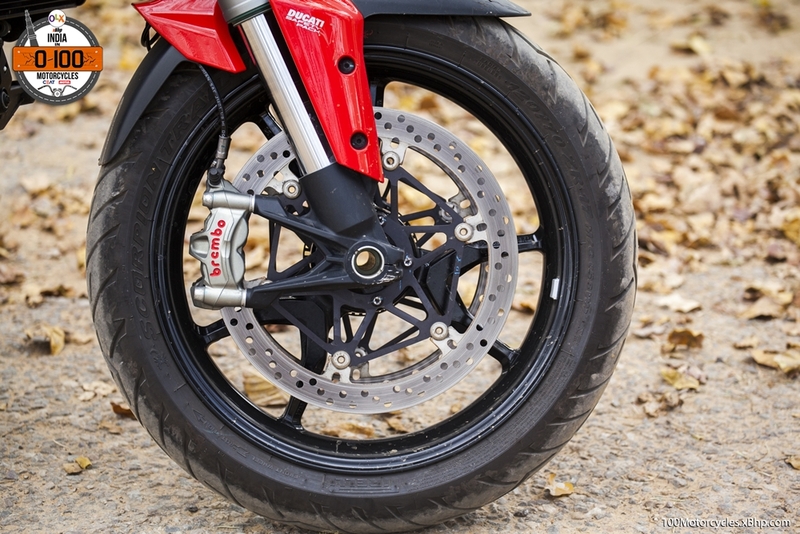 The traction control works fantastically well, it allows just a small amount of wheel spin if there’s too much throttle input from the rider making the experience joyful and safe at the same time. In the city, the Explorer is a mighty surprise. Some of us in the team were a bit apprehensive to ride it in city traffic as we thought it would be quite a handful and the tall seat height didn’t make us feel very good either. 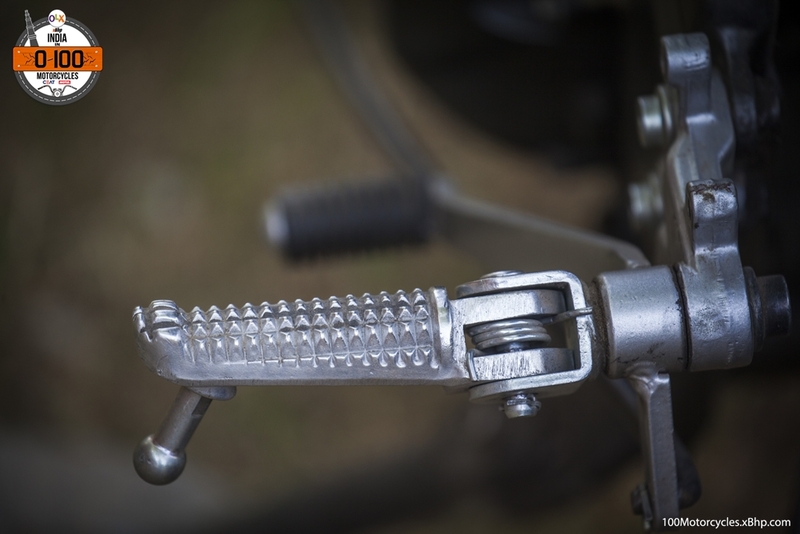 But we set the seat in its lowest position (837 mm), and even though it is still tall, the motorcycle became more manageable at almost dead speed. But the biggest surprise is its ability to cut through traffic and side to side flick-ability. It is no streetfighter but it was much better than we thought it would be and was just easy to ride through normal traffic. 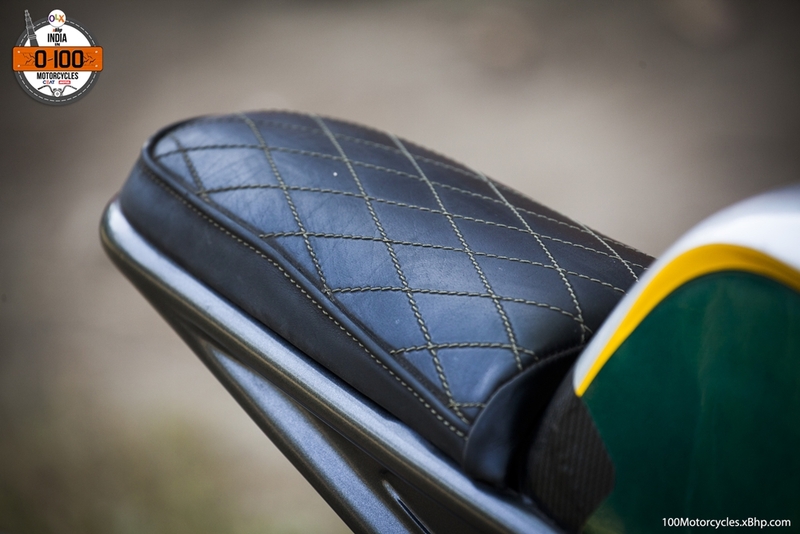 The comfortable riding position made things easier as well as we could completely concentrate on riding rather than worrying about ergonomics. Heating remained under control too, nothing irritating about it. But the Explorer belongs to the unpaved path. 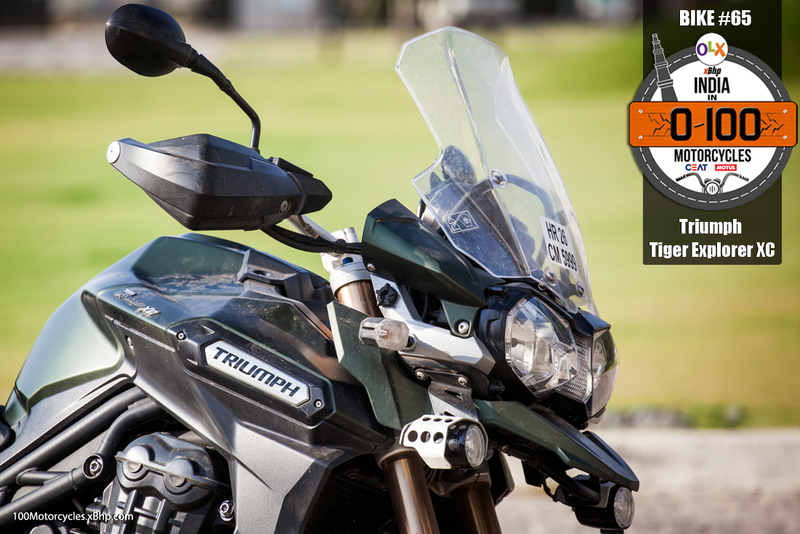 The big Tiger is one of the best motorcycles to go touring around the country in utmost comfort. 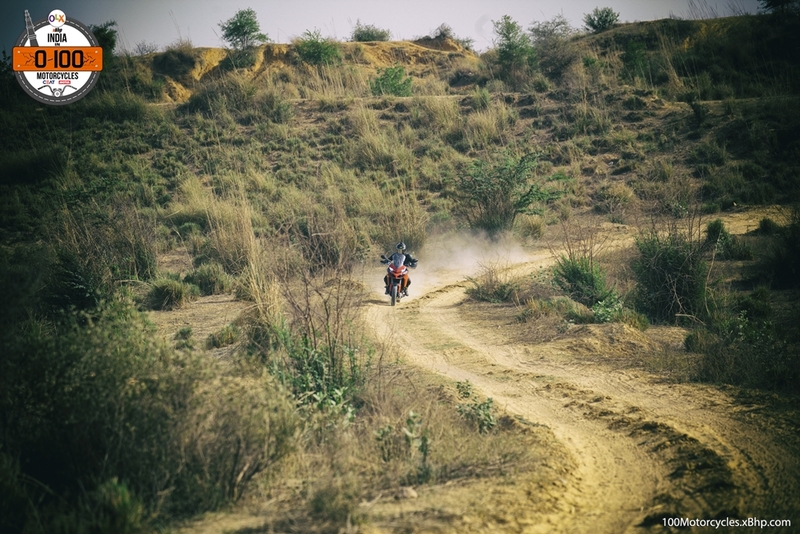 It can take on bad roads like they are nothing and can do off-roading as well as a big motorcycle that it is. It doesn’t come cheap, though, retailing at over 19 Lakhs on-road Delhi. And that is where platforms like OLX come to our rescue. 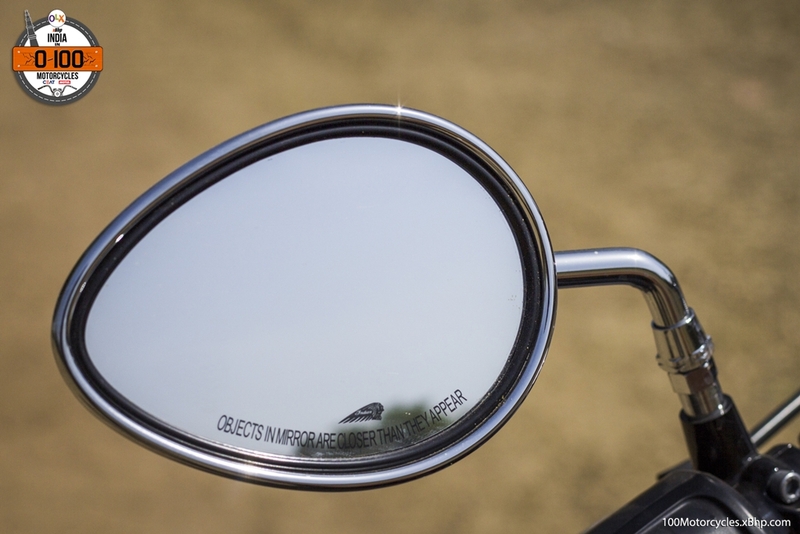 It is a great place to look for second-hand motorcycles. 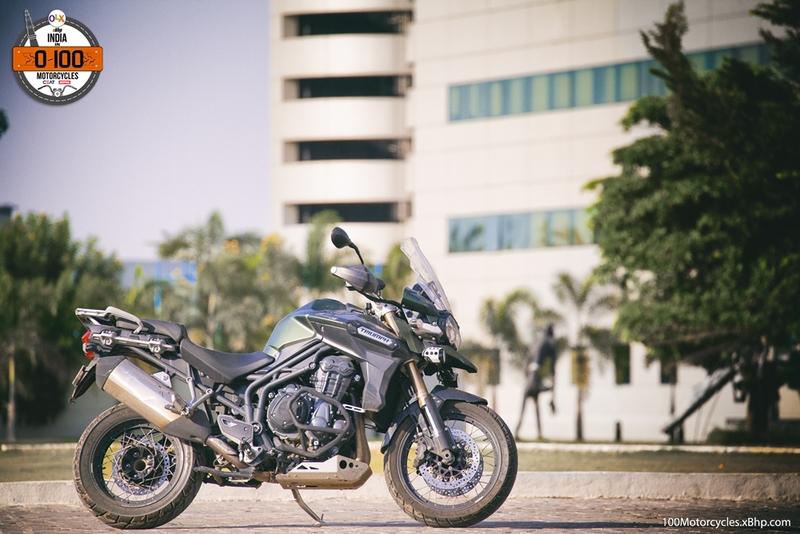 So try and look for a Triumph Tiger on OLX if you think that it is out of your budget brand new. 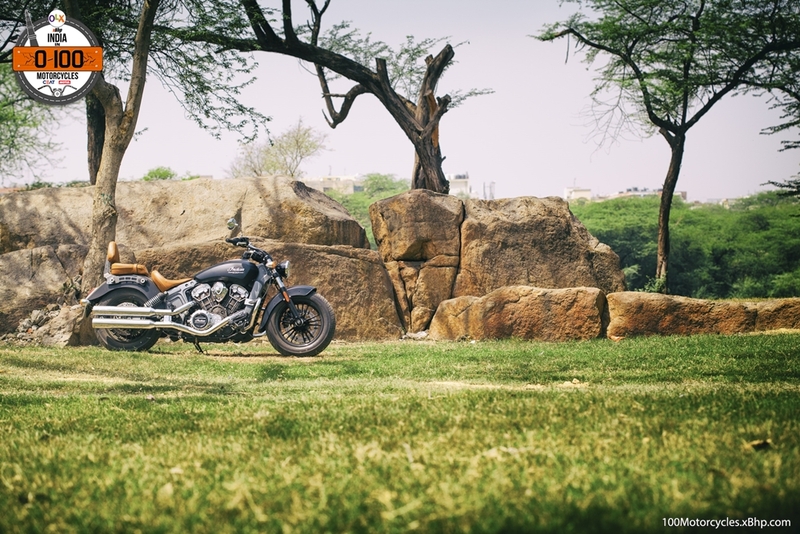 But whichever way you look at it, the Tiger Explorer is totally worth it and indeed the company deserves gratitude from us for this motorcycle in India and starting a trend in the premium motorcycle segment. 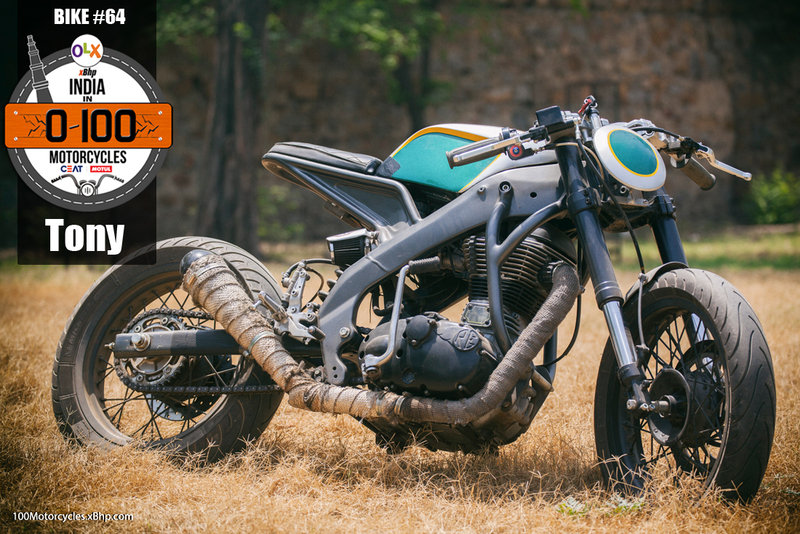 People are finally beginning to realize how wonderful these motorcycles are and it is pushing other manufacturers to enter the category. 64Tony - Yes, it’s a motorcycle! 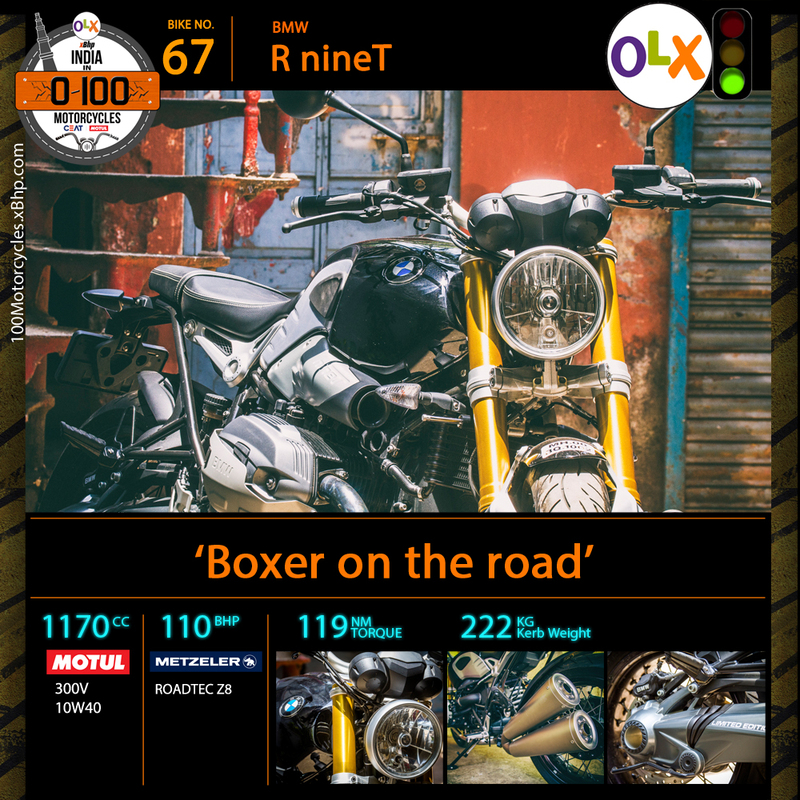 Buy a used motorcycle from OLX. 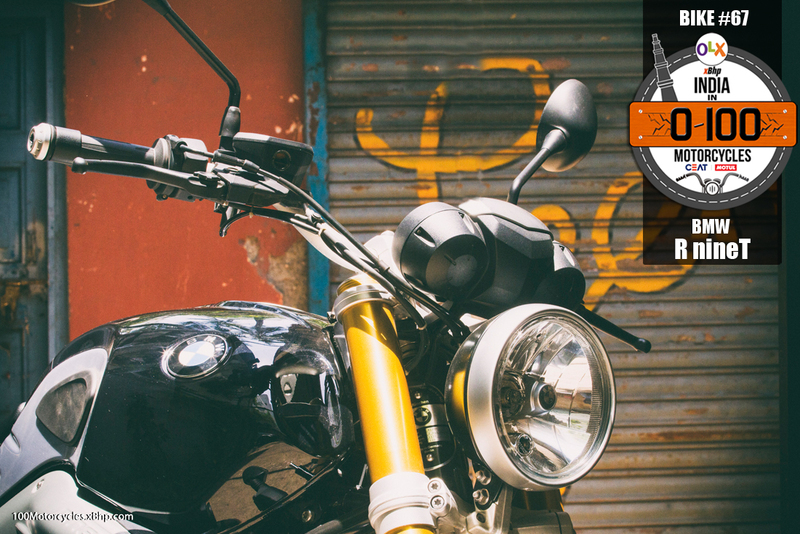 Buying a motorcycle is not just about paying money and getting a product, it is the beginning of a relationship, almost humanistic. 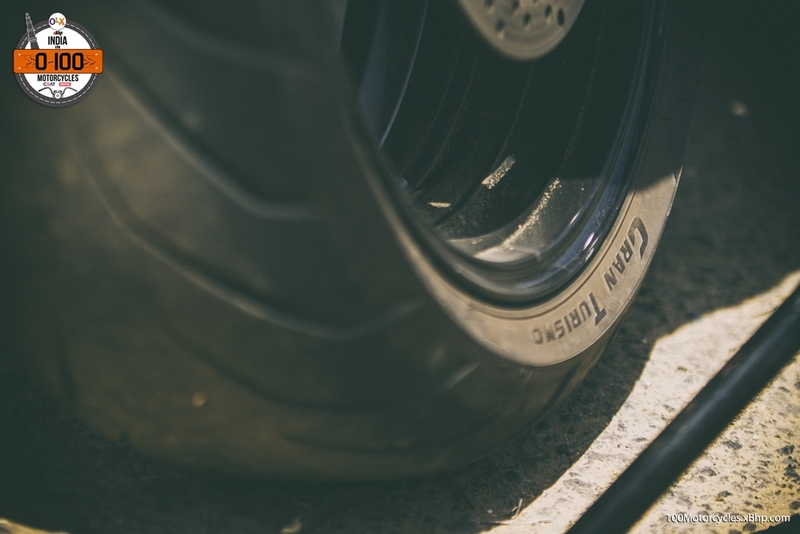 If you think of your bike as something more than just a tool to get you from A to B, you are likely to put more effort in taking care of it. You’d not just clean it with a cloth, you’d pet it. 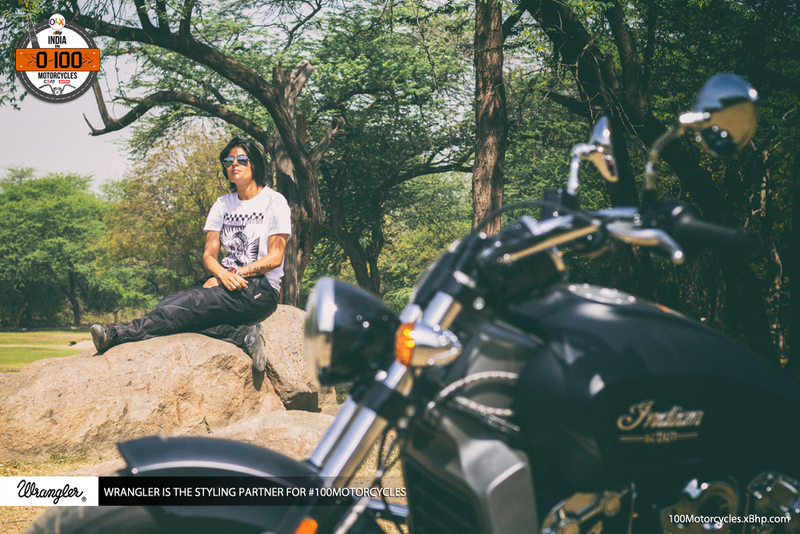 But the pride of owning a motorcycle comes in different ways. There are people who go beyond the conventions as the out-of-showroom vehicle just doesn’t cut it for them. It’s just not individual enough. That calls for customization which can be done at various scales – from just a simple sticker job to highly complex stuff which might even include totally different body parts! 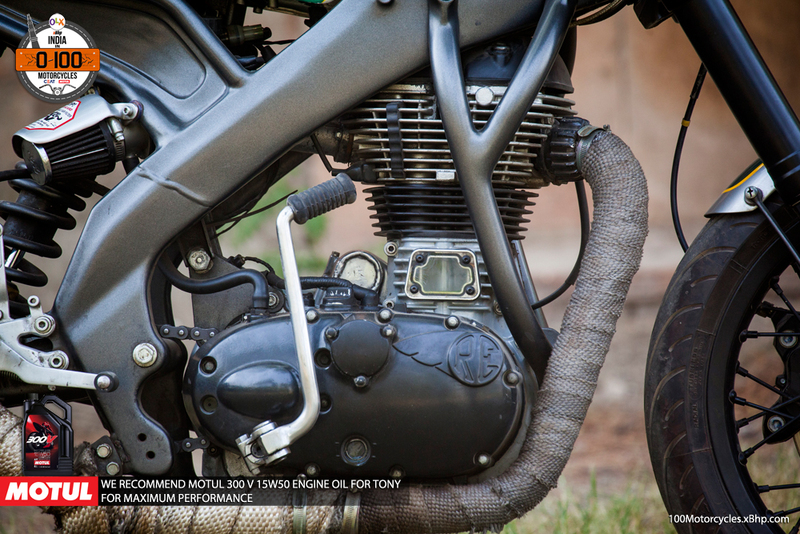 This time, we have a motorcycle which is the result of a similar complex idea and it’s called Tony. No, not the Marvel character. 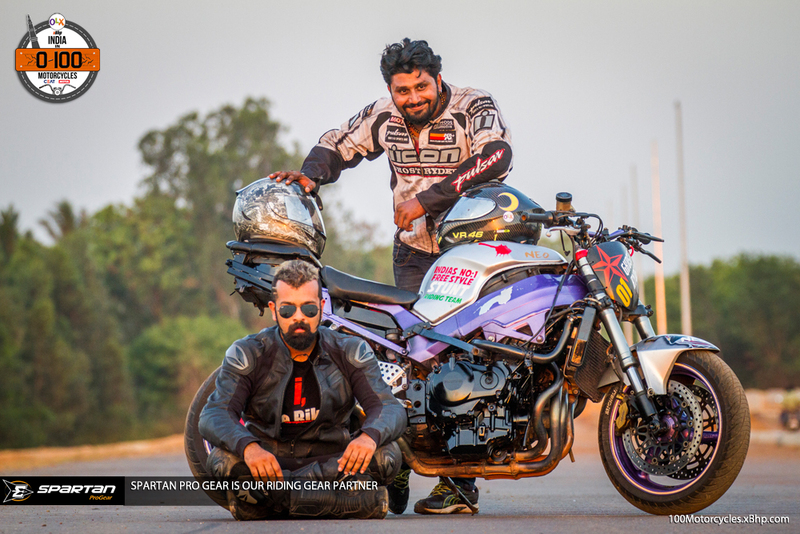 Tony is the fusion of two motorcycles and we’d bet it’s not easy to guess them as they are just so far apart from each other – Royal Enfield Classic 500 and the Yamaha YZF-R15. That’s not a typo! 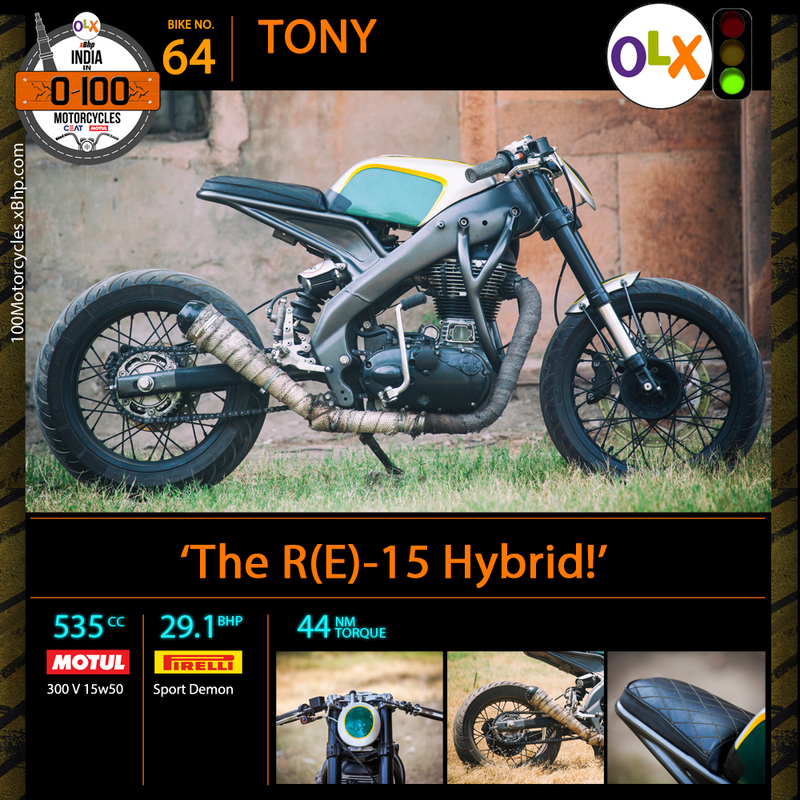 So Tony is basically the engine of a Classic 500 housed inside an R15’s frame. It is a naked, hence, there’s no bodywork, not even a tiny amount of it. 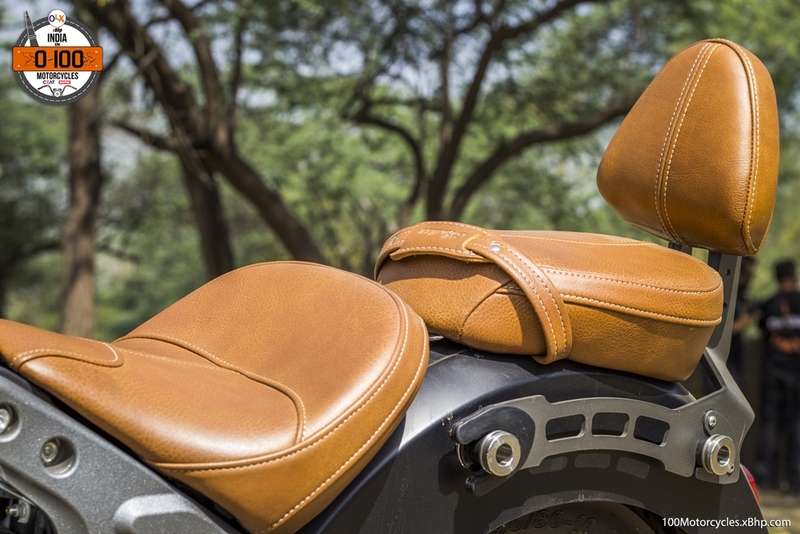 There’s only a single seat, handlebar is low and short, and it’s made to look like a Café Racer. 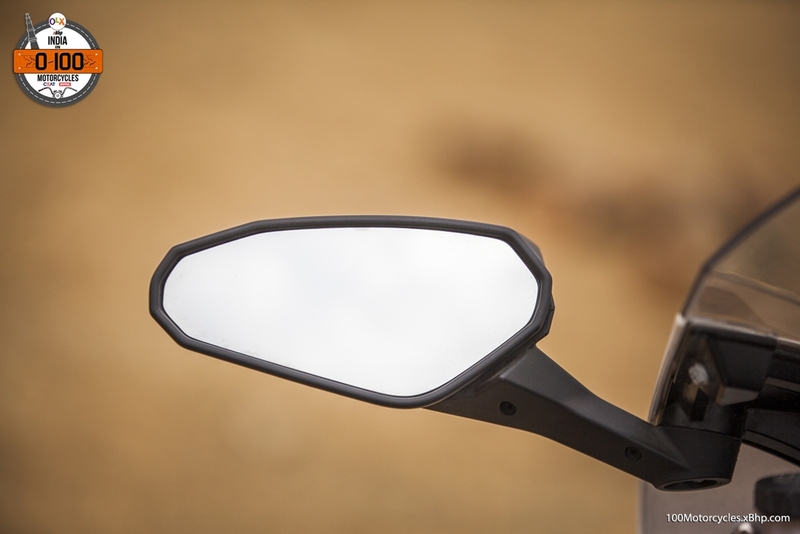 It hasn’t got any lights at front and back and there are no rear-view mirrors as well. 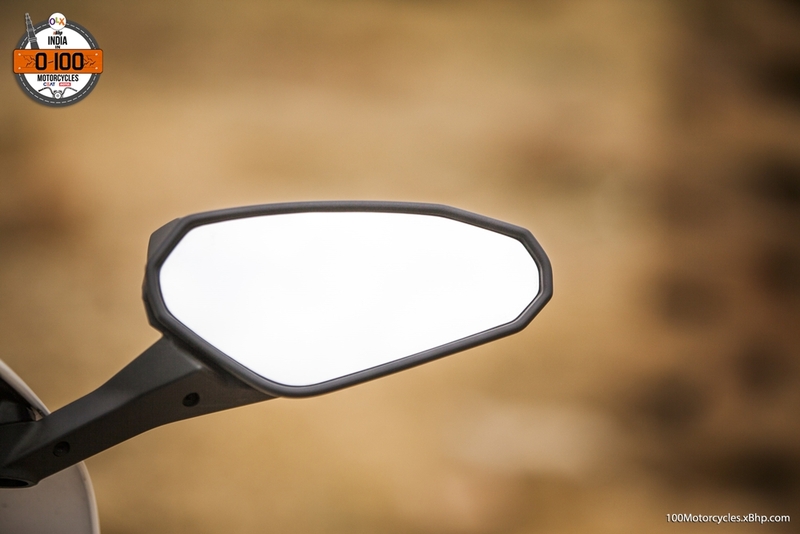 It is ripped down to the bare essentials – things that are a must to run and ride a motorcycle. 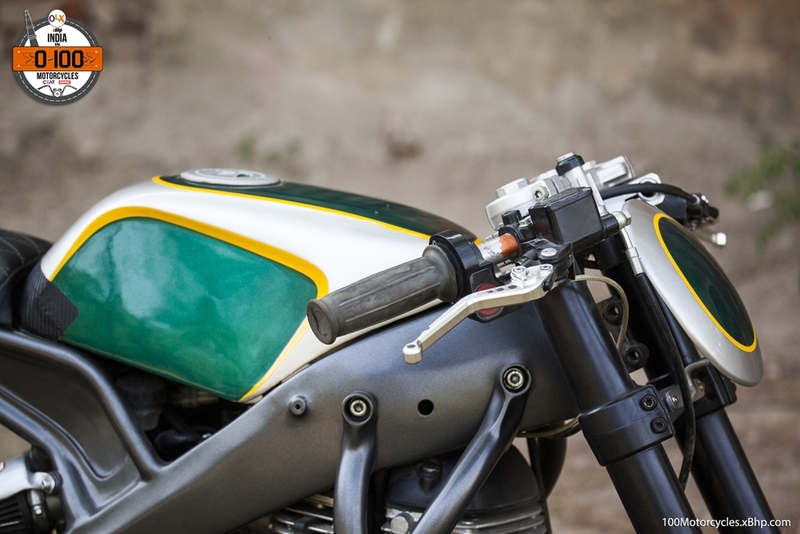 Since the engine is from a Classic 500, it is fuel-injected and comes to life only by a kick as the self-start has been removed to save weight. 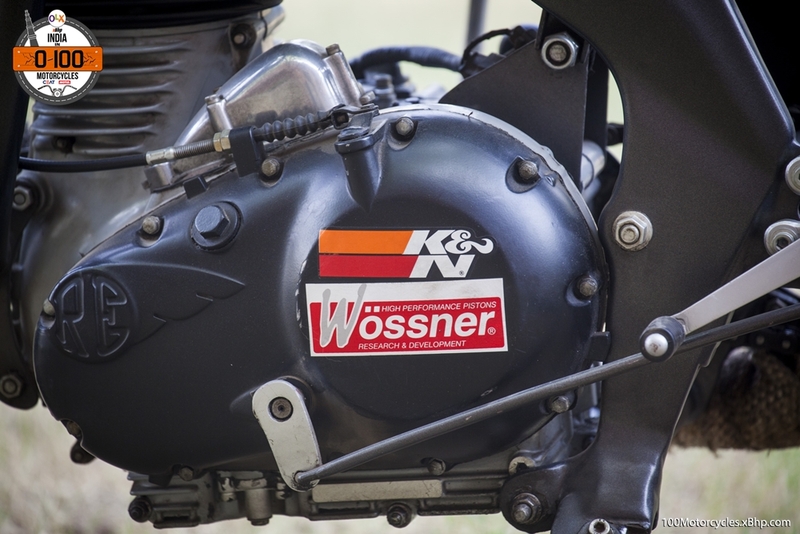 It is bored out to 535cc with several modifications to increase its performance like the Wossner high-performance pistons and a K&N air-filter to name a few. 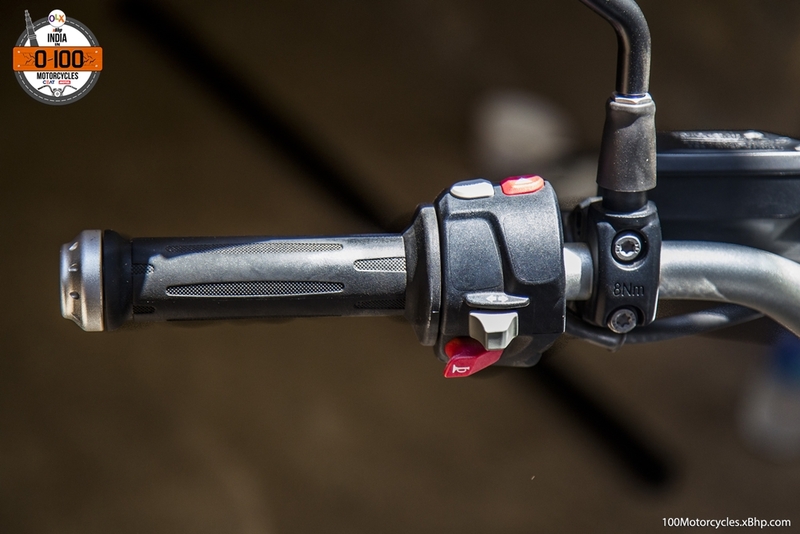 Tony rides on a pair of upside-down forks at the front and a link-type mono-shock at the rear. There’s single disc each at both ends on spoked wheels. We thank him for his time and giving us this opportunity to see and understand his unique creation – Tony. 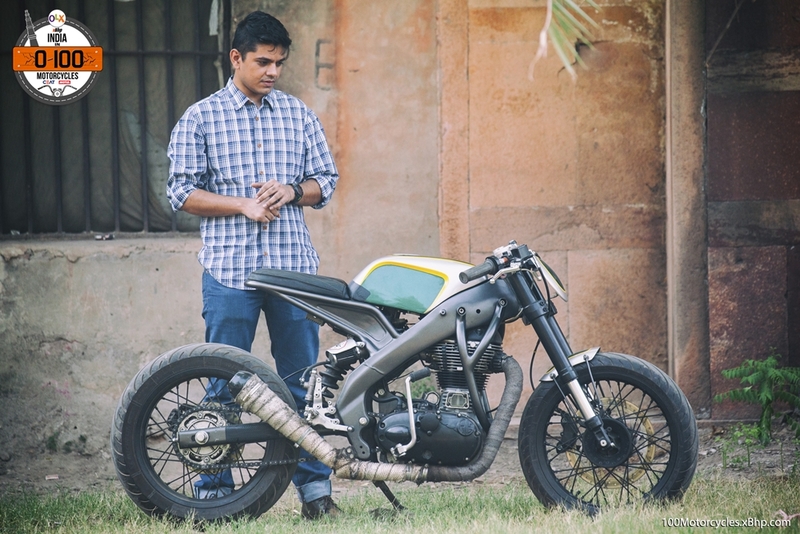 It is clearly one of the most interesting creations we have seen and the guy who has done it is Aseem Singh Pawar. 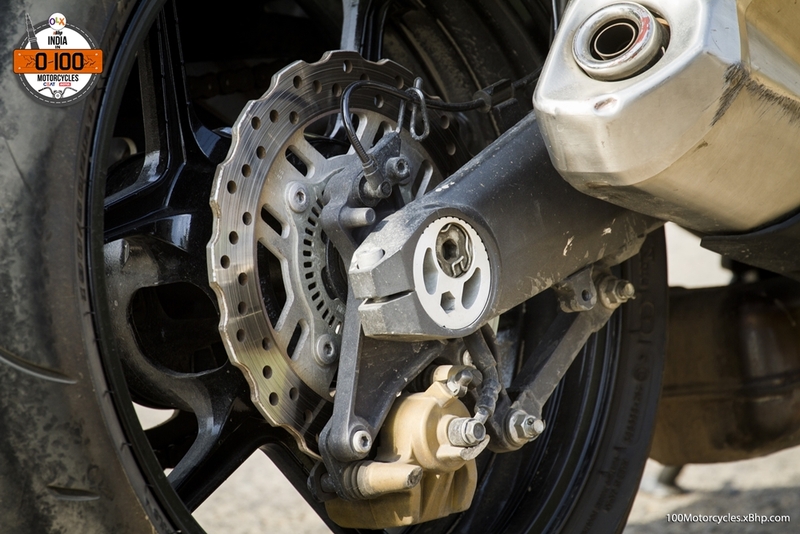 Of course, the RE engine is not a direct fit in the R15’s chassis and some alterations were done. 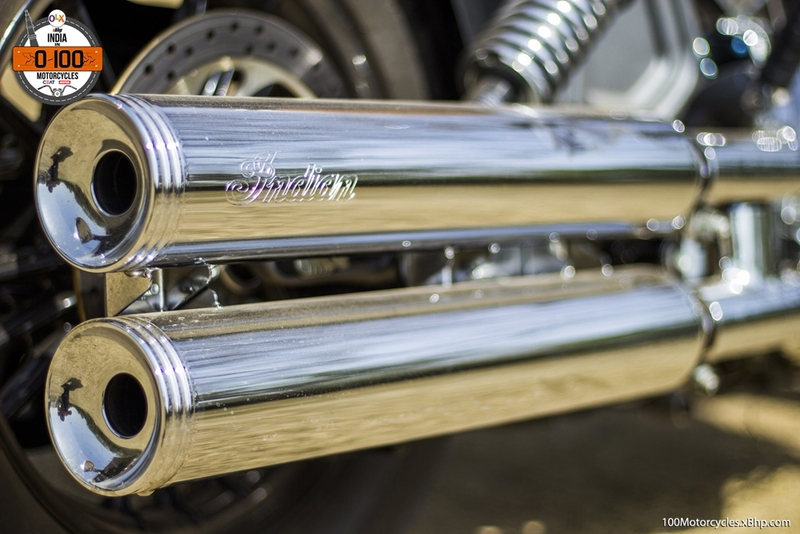 Separate tubes were used to hang the engine while the rear sub-frame is completely custom made. However, the overall work is pretty neat without any ugly touches. 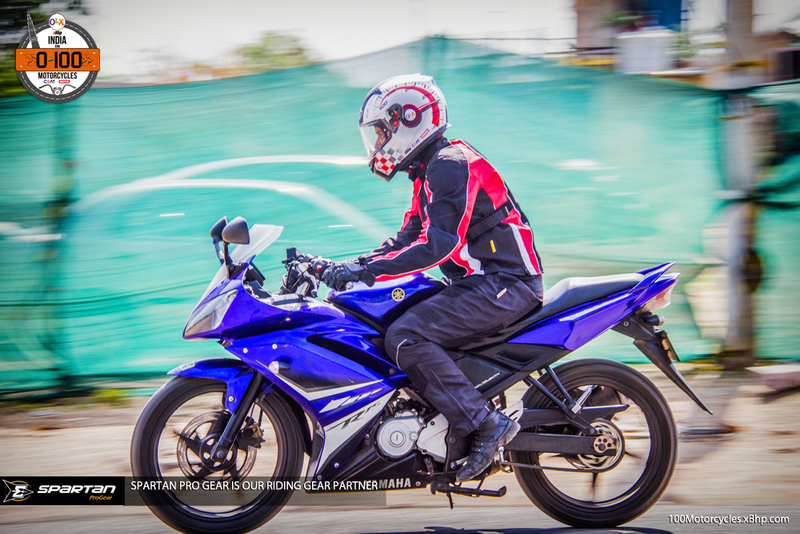 Tony handles quite well and it is light on its foot, the advantages of having an R15’s chassis are visible. Overall, it is a commendable effort by Aseem and is definitely praise worthy. When we asked him why he named it Tony, he mentioned that “Tony” is a small word and the motorcycle is small and compact as well. Also, naming it Tony gives it a more human character. 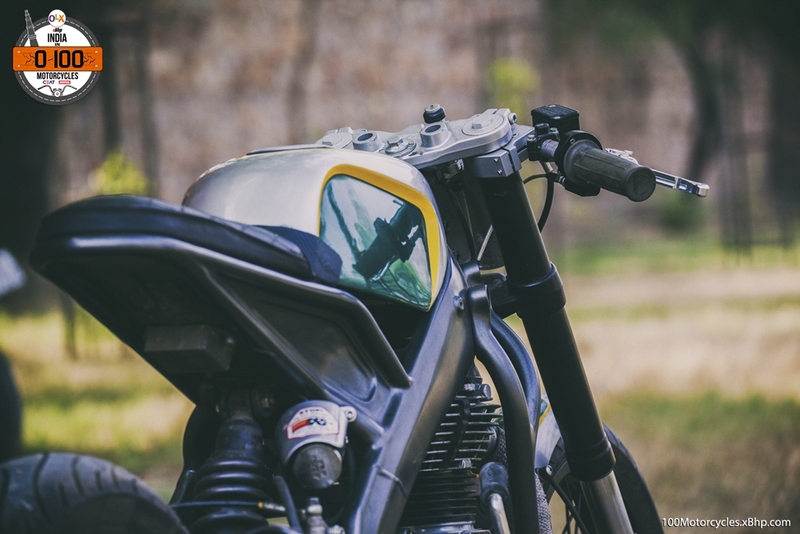 And although you and I won’t find a motorcycle like this one anywhere else, but what you can do is get a decent motorcycle through OLX and perhaps, build yourself one!